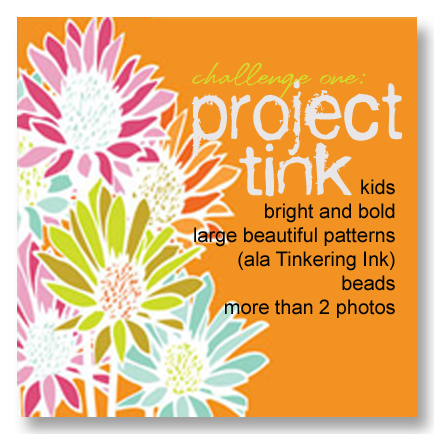 Congratulations to Gabrielle McCann, who won our first challenge, Project Tink, by an outstanding margin! We decided to have a second winner for each challenge, who would be voted for by our design team. 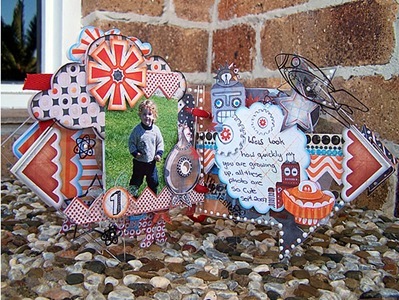 It was close there for a while but in the end Robyn Wilkinson came up trumps as our favourite - best fulfilling the criteria and using the Tinkering Ink papers. 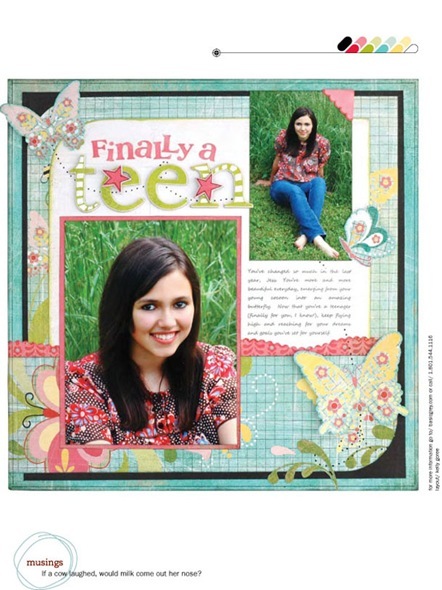 Congratulations Robyn! 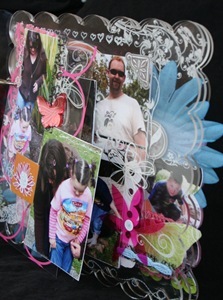 Thanks to everybody who joined in on such short notice. 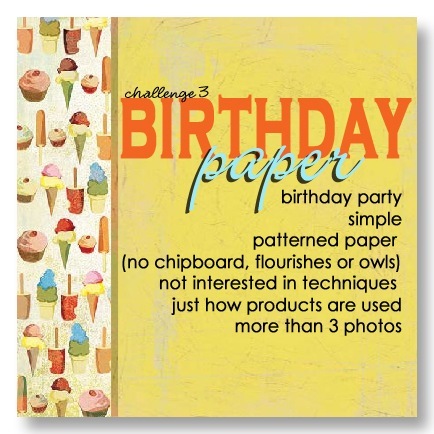 As you'll see in a minute, the challenge appears to be growing as we have an overwhelming number of entries into challenges two and three. 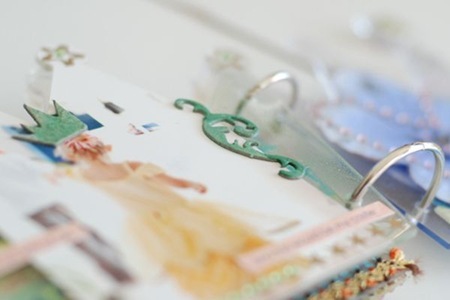 Standby to see them all. 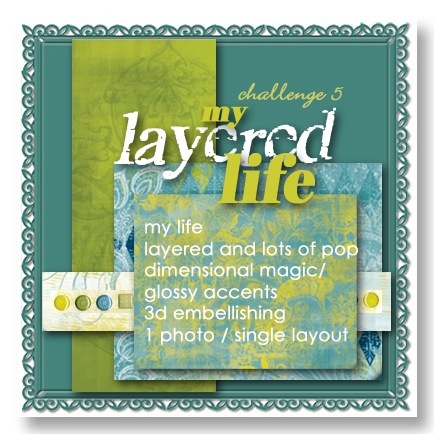 Before that, a reminder of next weeks challenges to keep you busy. 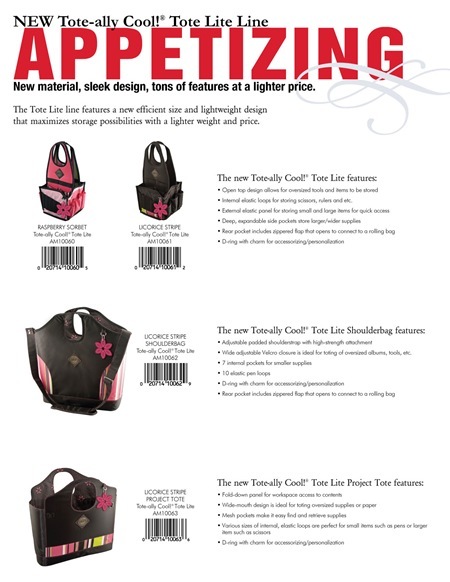 Choose one or the other, or do them both! 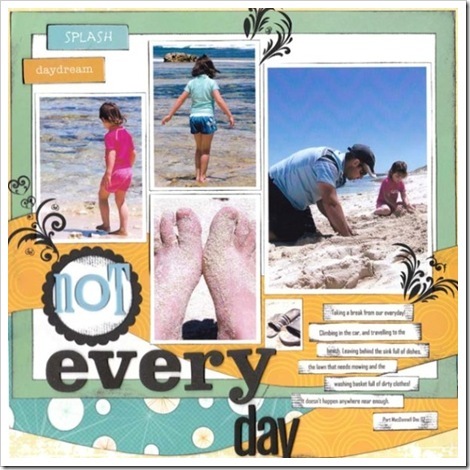 And email me on aussiedt@iinet.net.au with your layouts by next Tuesday 5 August. 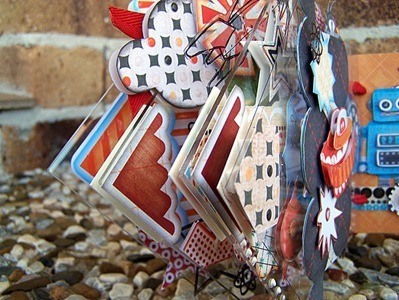 just in case you were scouting around looking for them, these are the next two challenges. i need to receive these by 5pm next tuesday 29 july if you are keen to play. 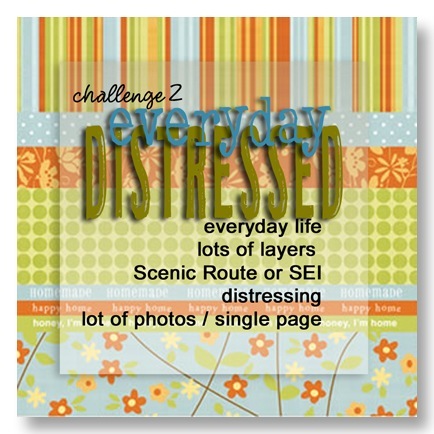 please email me with the name of the challenge (everyday distressed / birthday paper) in the subject line. 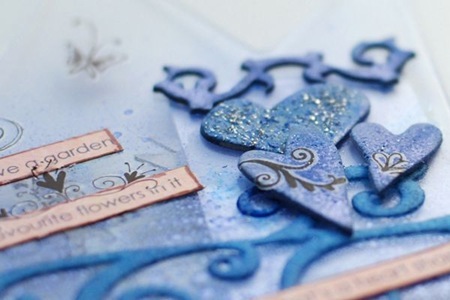 we've already received several fabulous entries and love that you are taking up the challenges, getting inspired and trying new techniques and products. 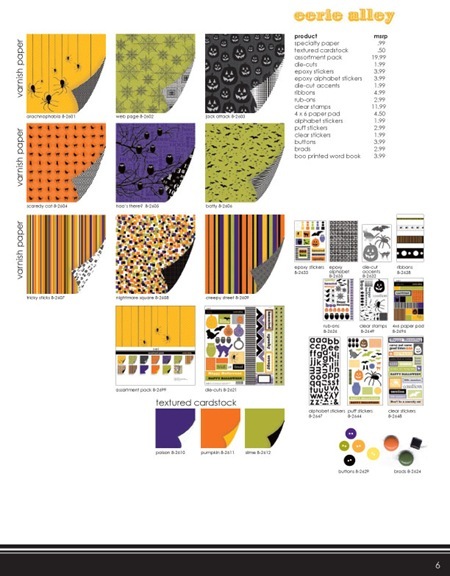 is focusing on design a technique? 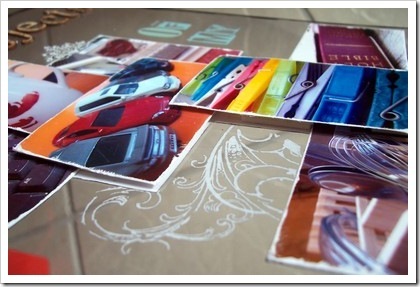 your most favourite photos that you have ever taken. 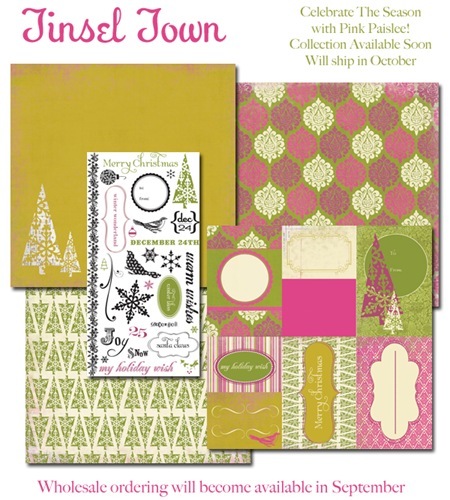 So now you can get planning, get shopping, and get challenged! 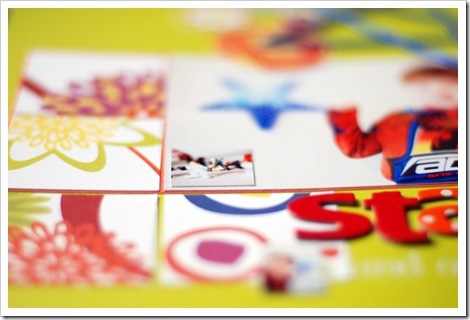 We'd love to hear from you so if you have any questions, feel free to leave a comment. 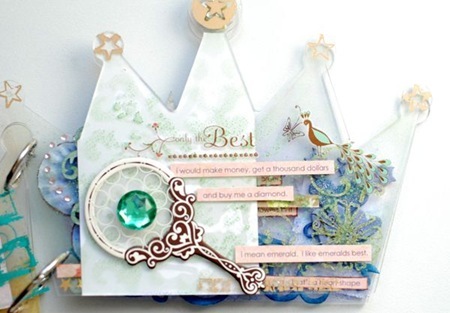 and in the meantime - make sure you vote for your favourite layout in Project Tink! 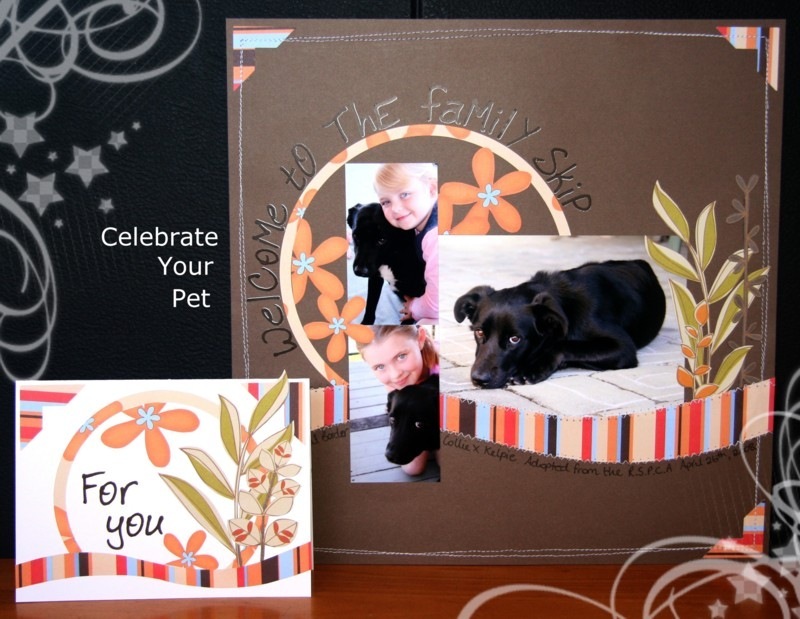 Celebrate that extra special family member! 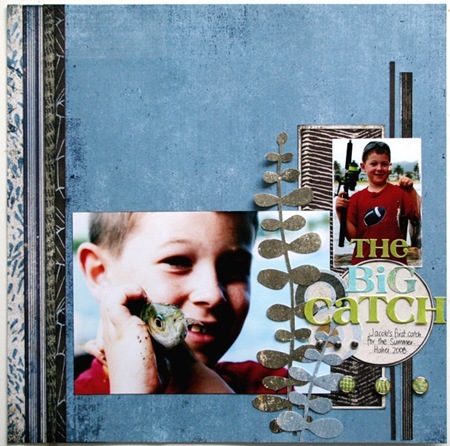 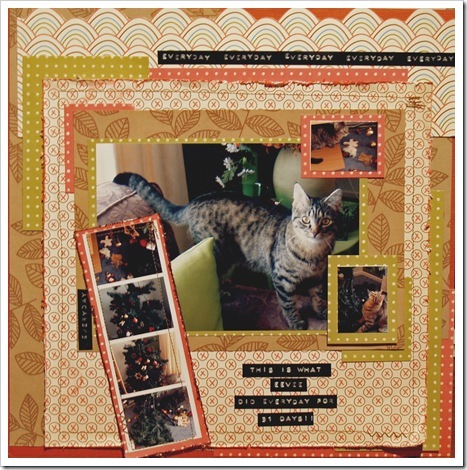 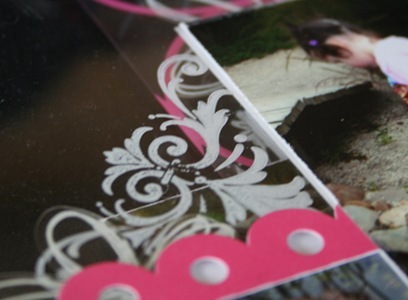 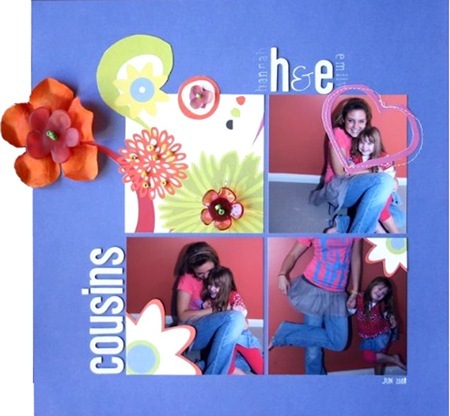 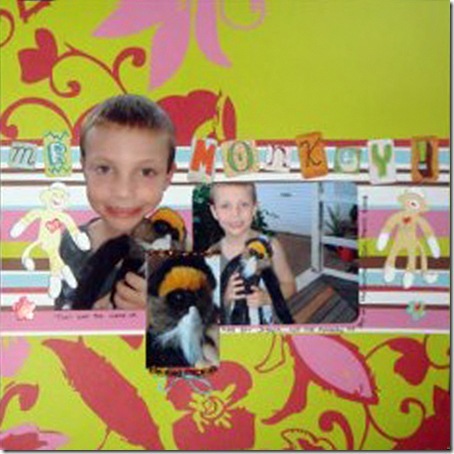 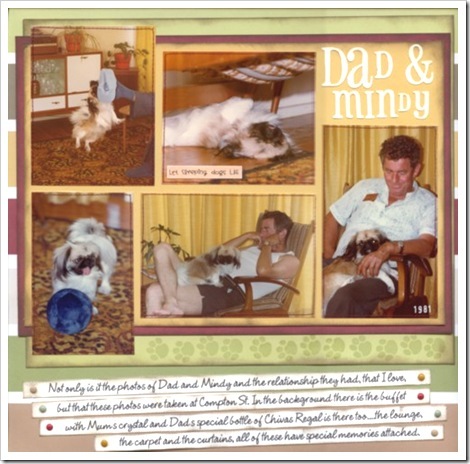 Whether it be the family dog, cat, bird or fish, create this appealing layout to add to your family album. 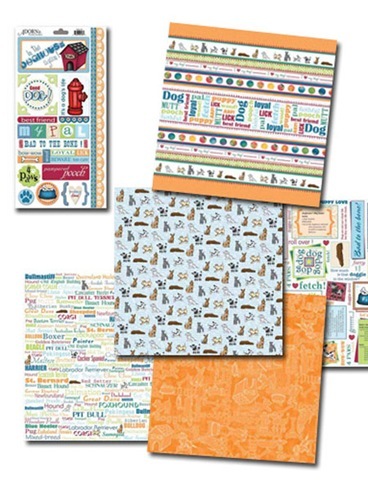 Included in the instructions are 10 alternative title ideas to suit your pet as well as an entire packet of rub-on alphabets to create them with. 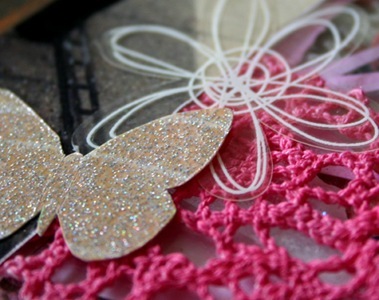 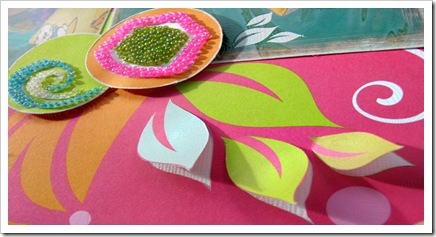 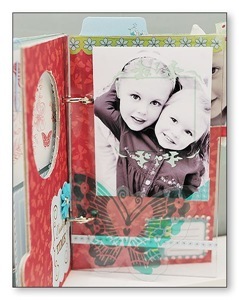 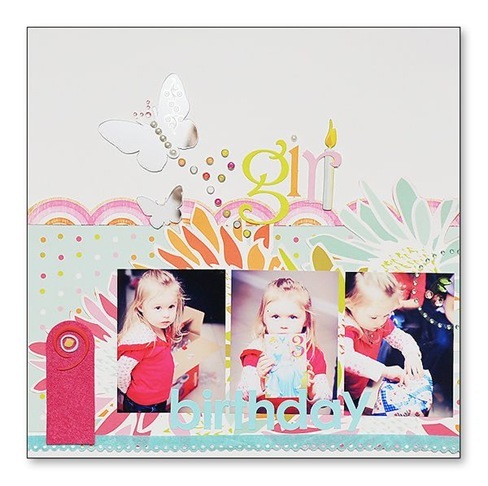 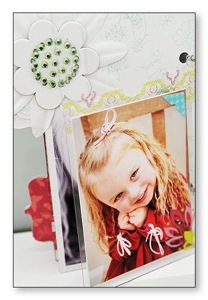 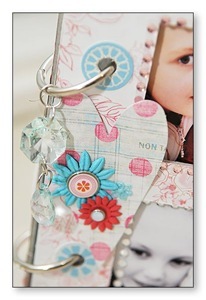 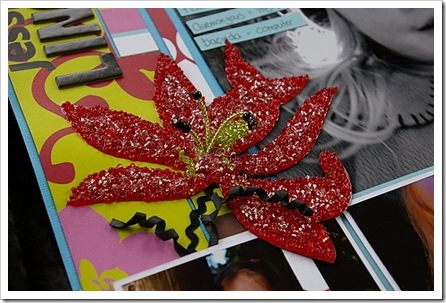 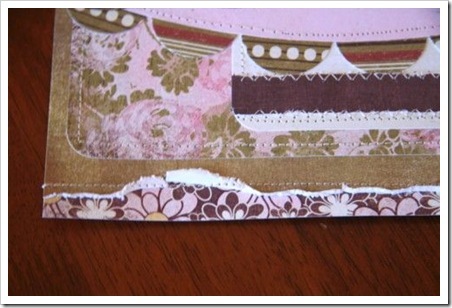 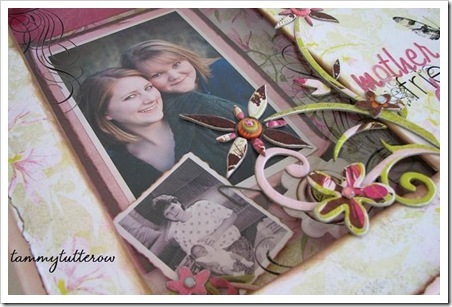 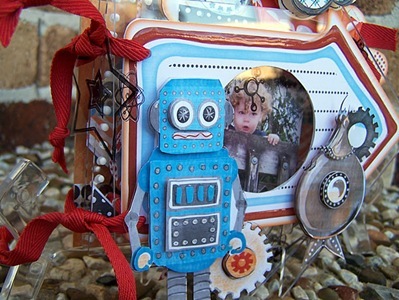 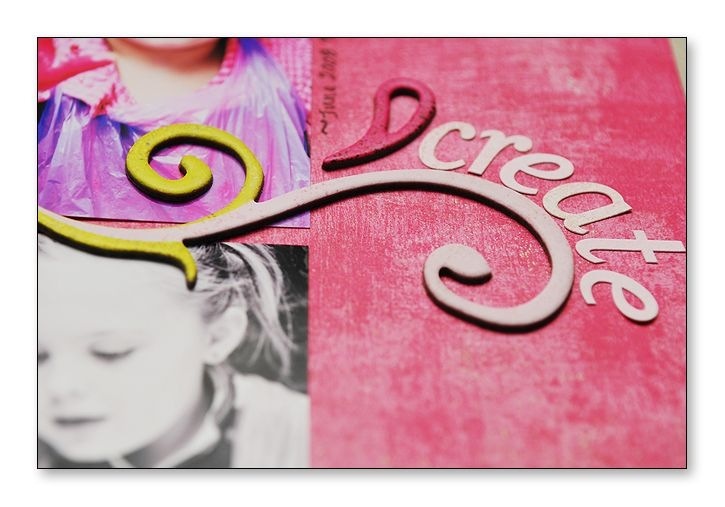 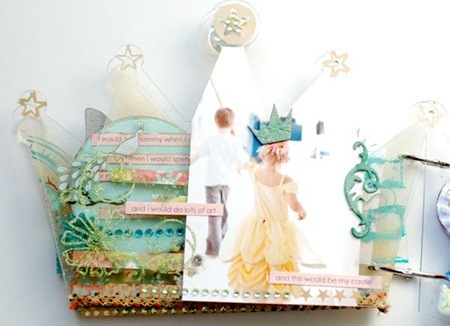 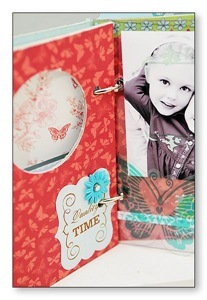 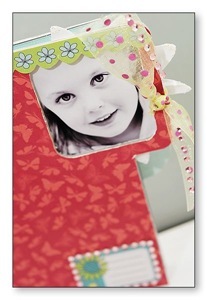 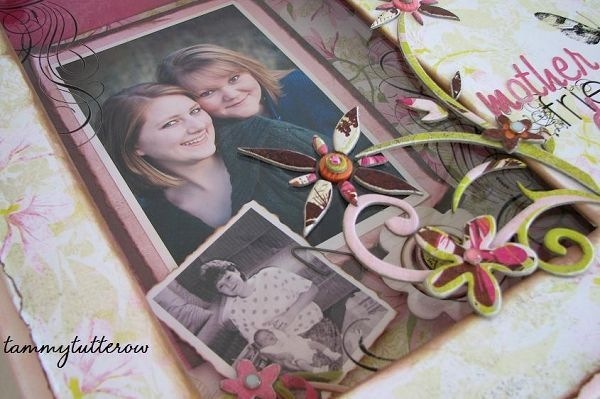 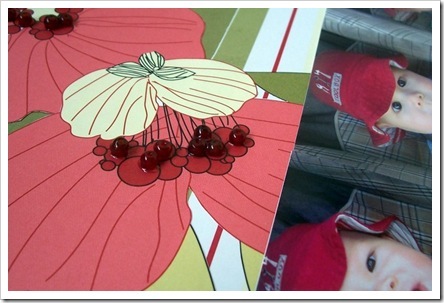 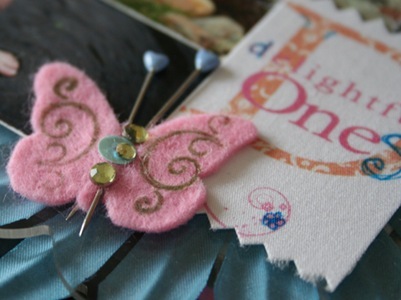 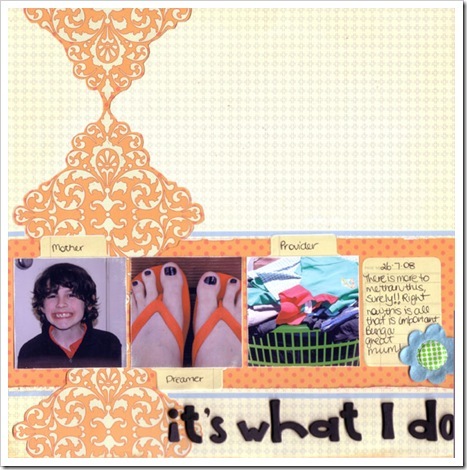 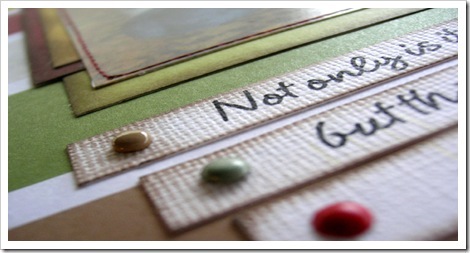 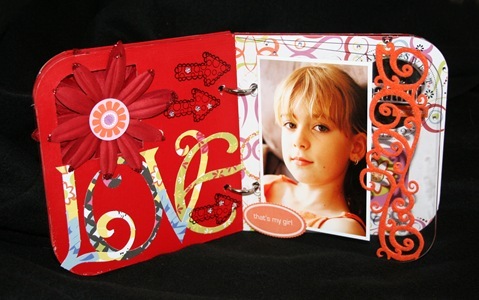 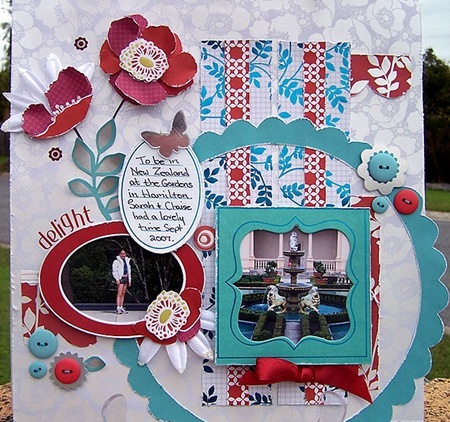 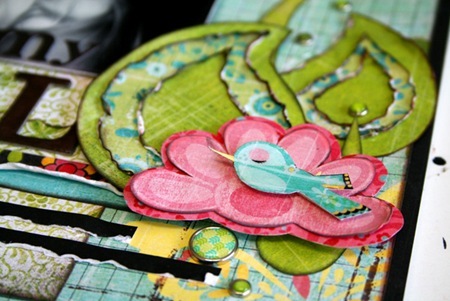 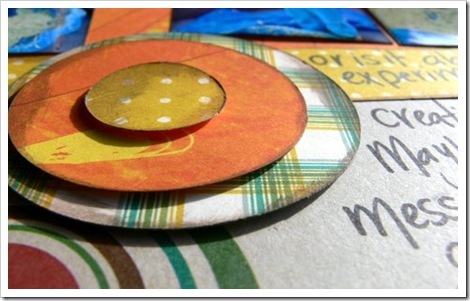 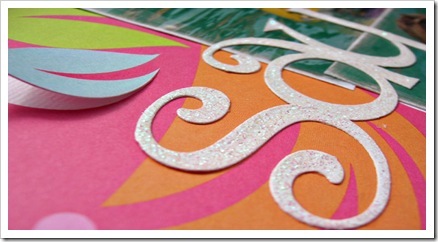 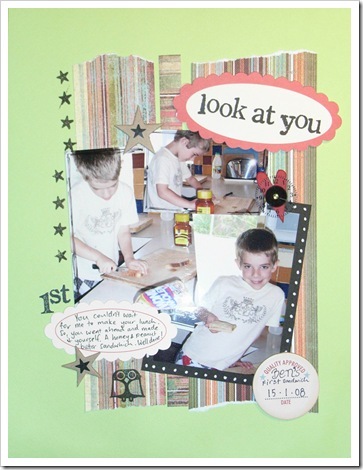 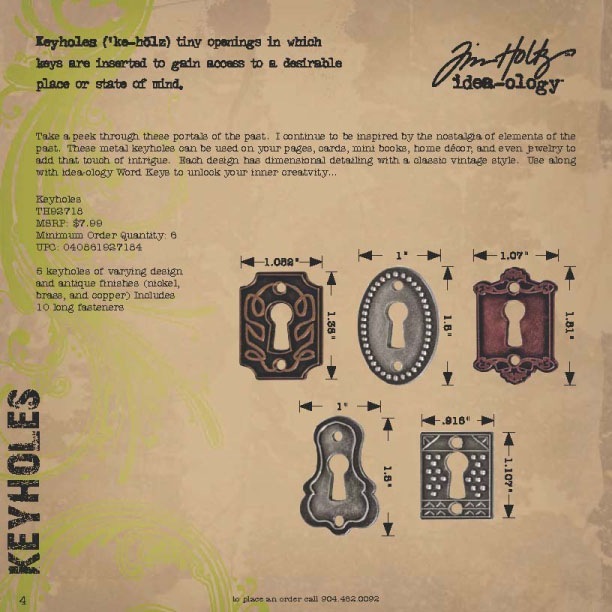 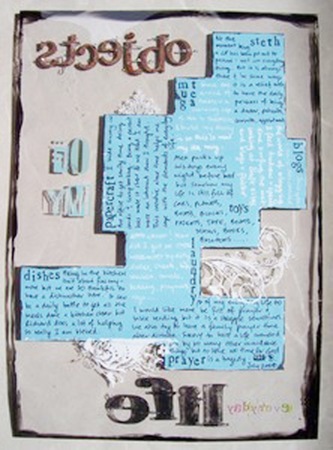 Bring out your scissors and sewing machine for this layout and matching card. 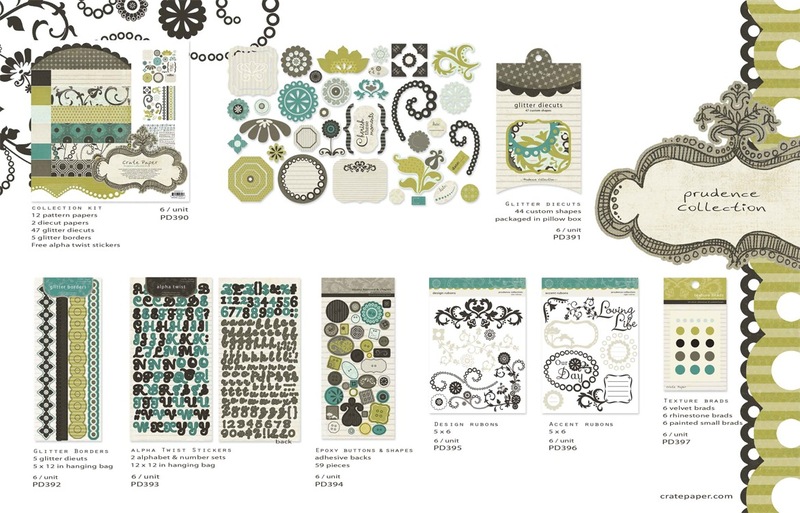 BasicGrey meets SEI! 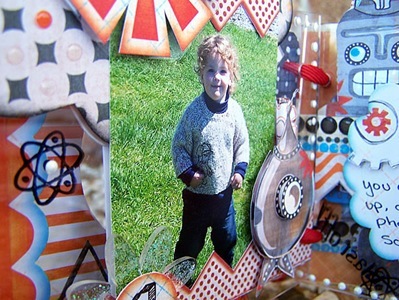 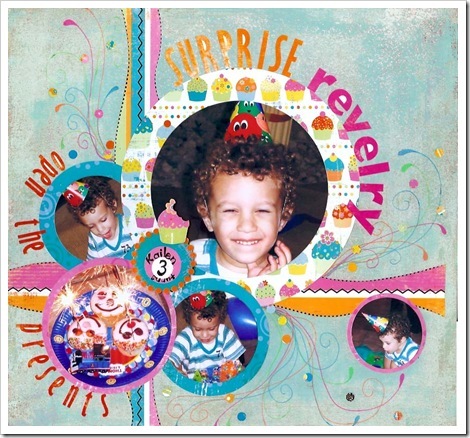 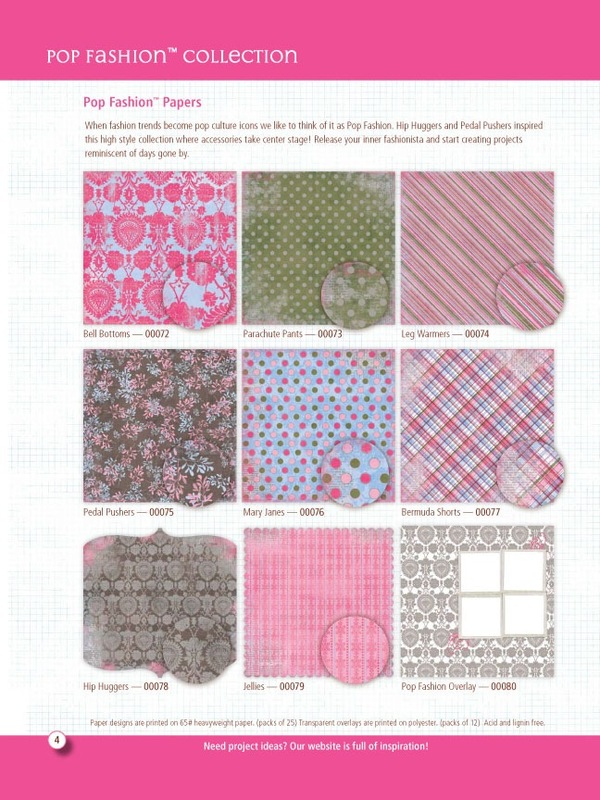 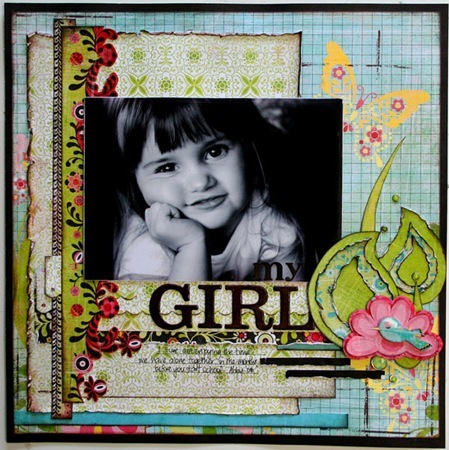 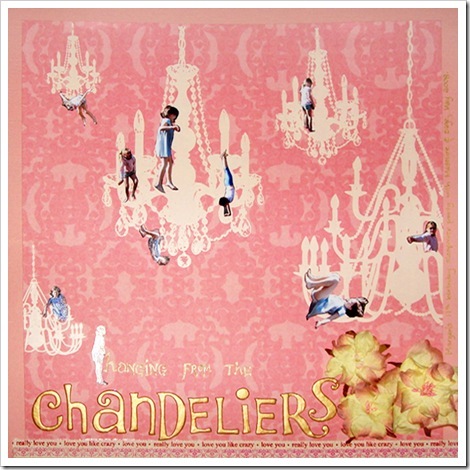 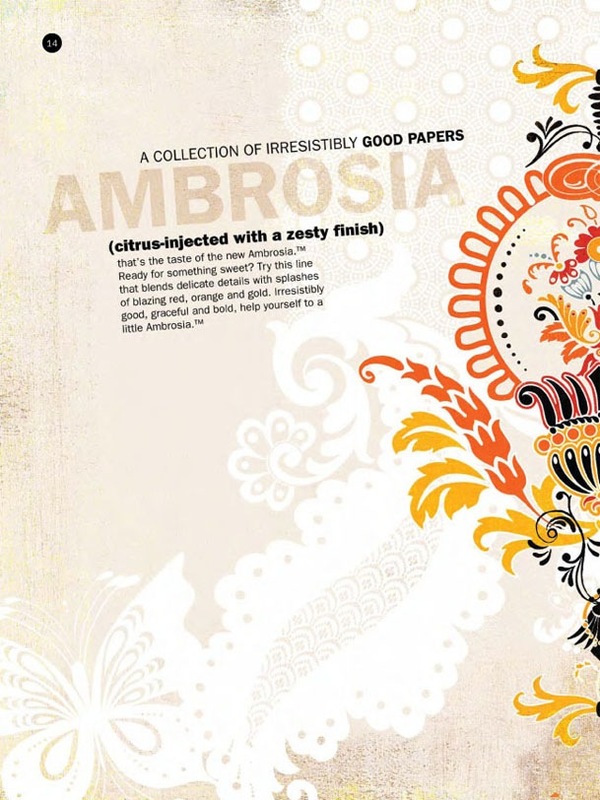 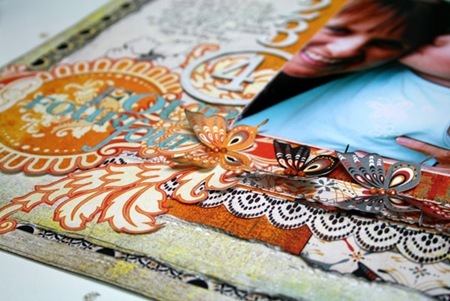 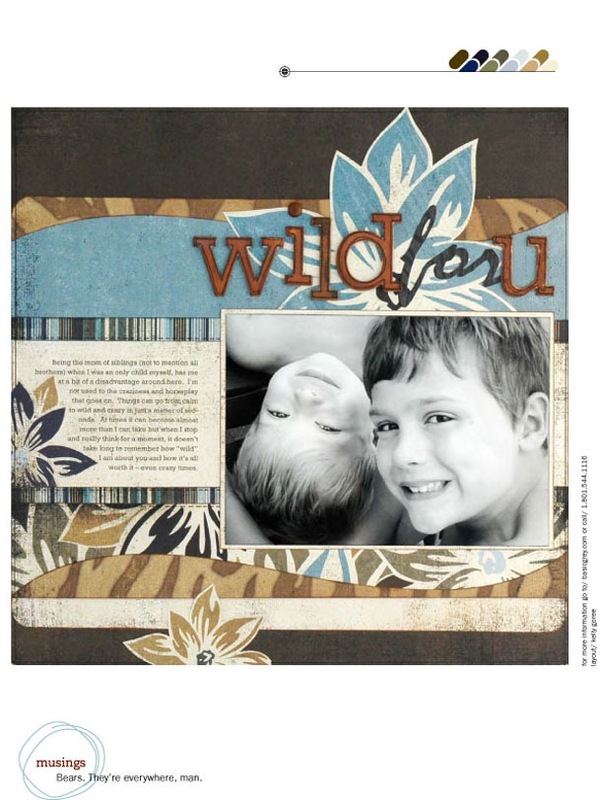 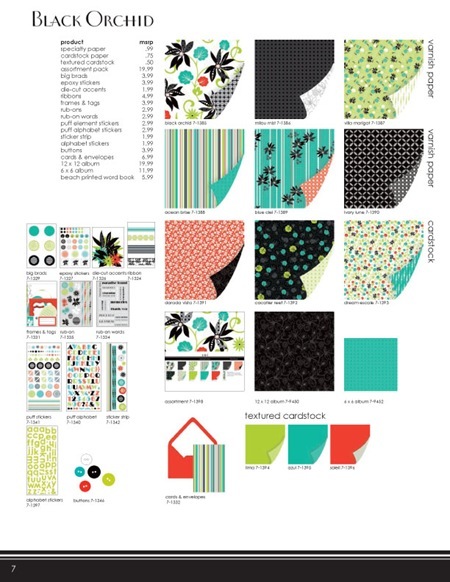 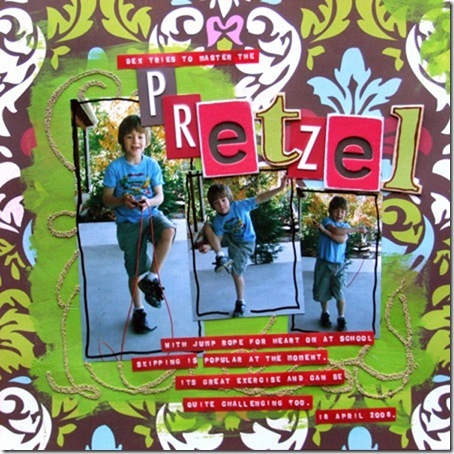 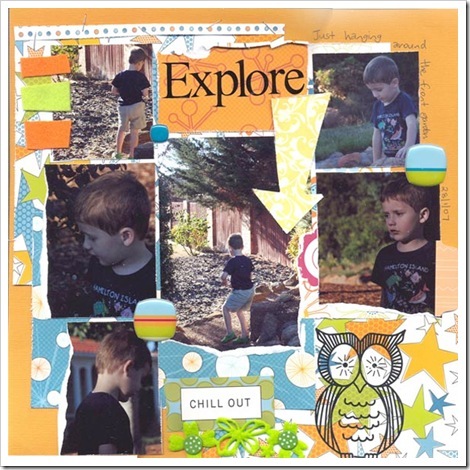 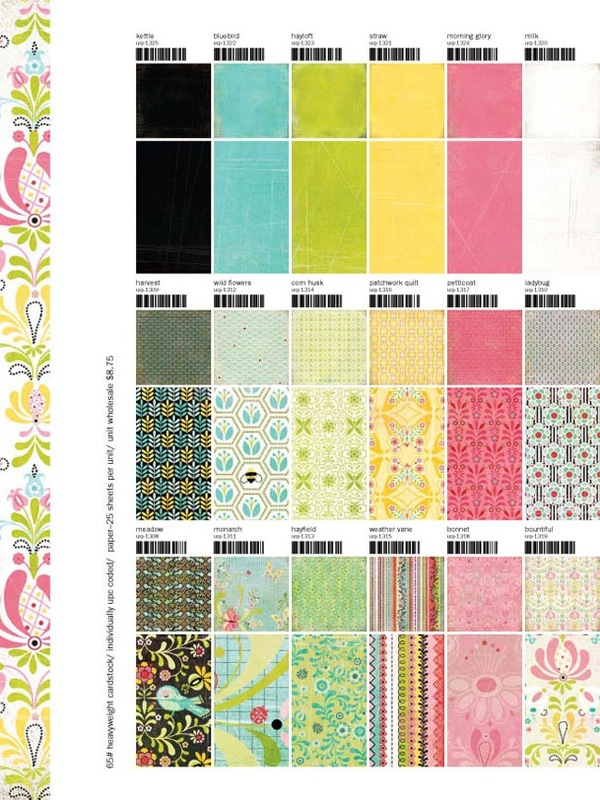 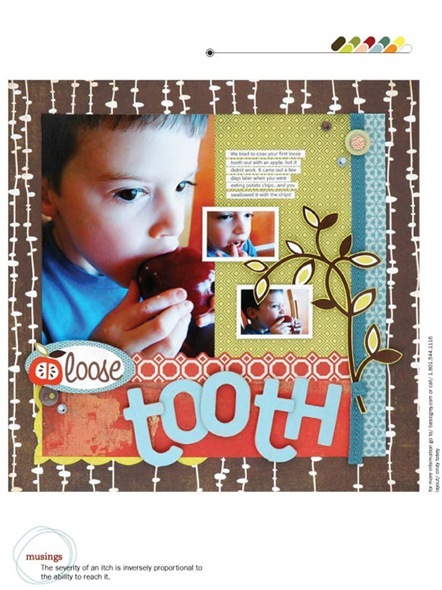 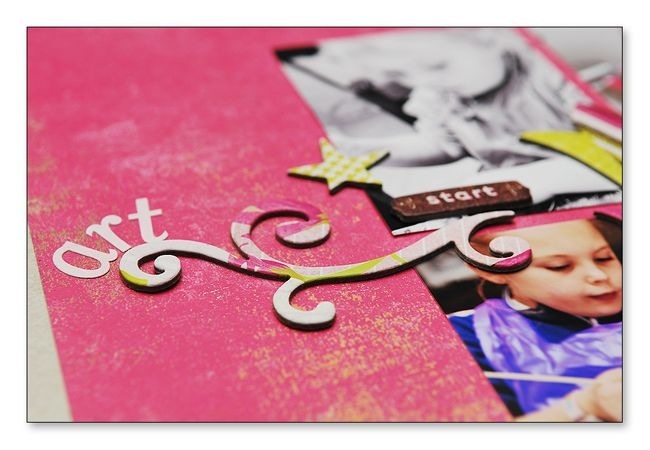 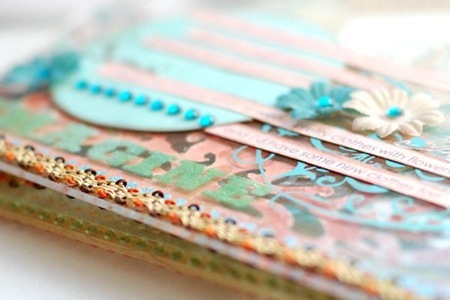 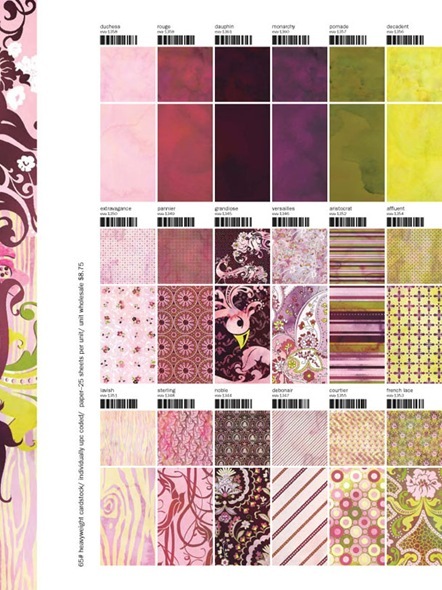 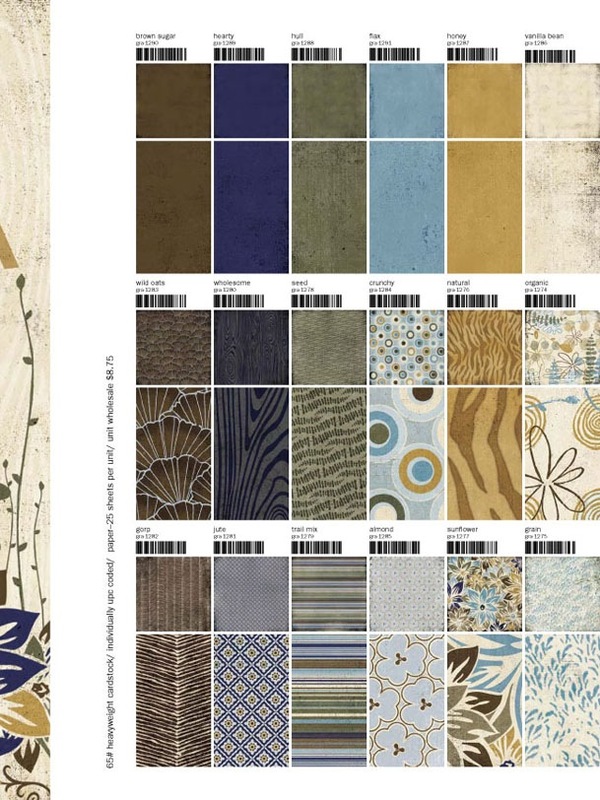 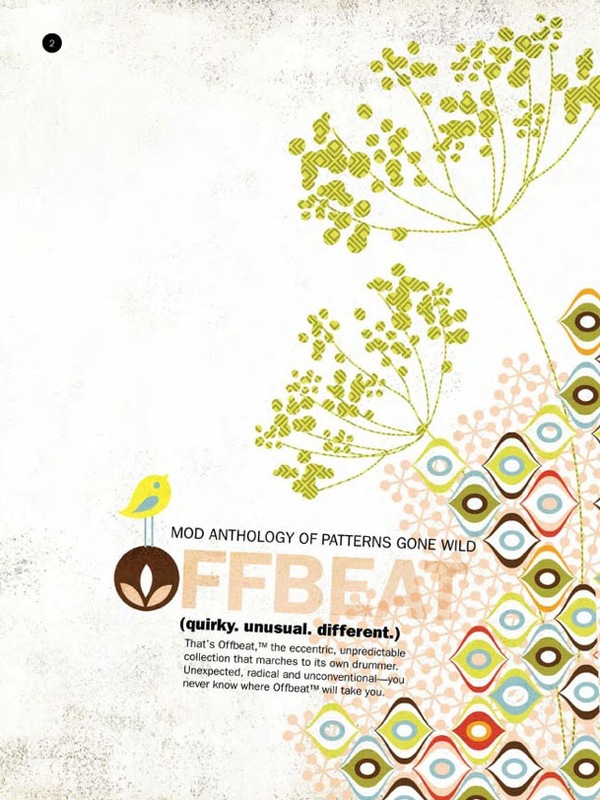 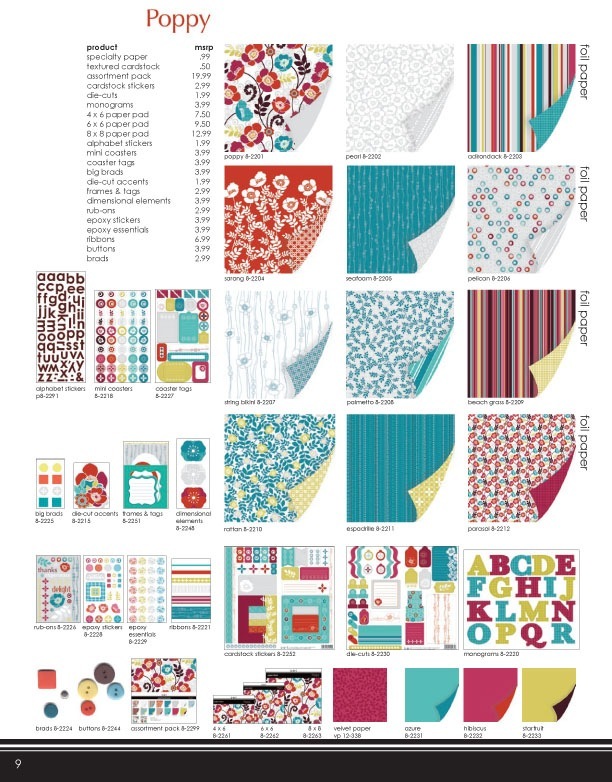 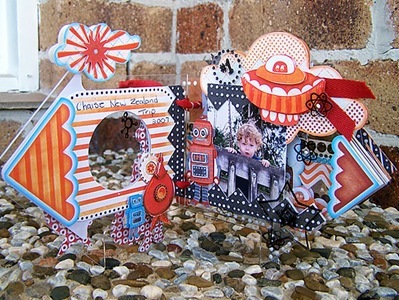 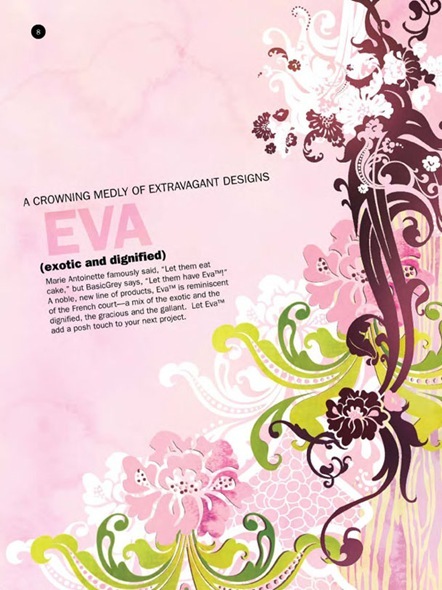 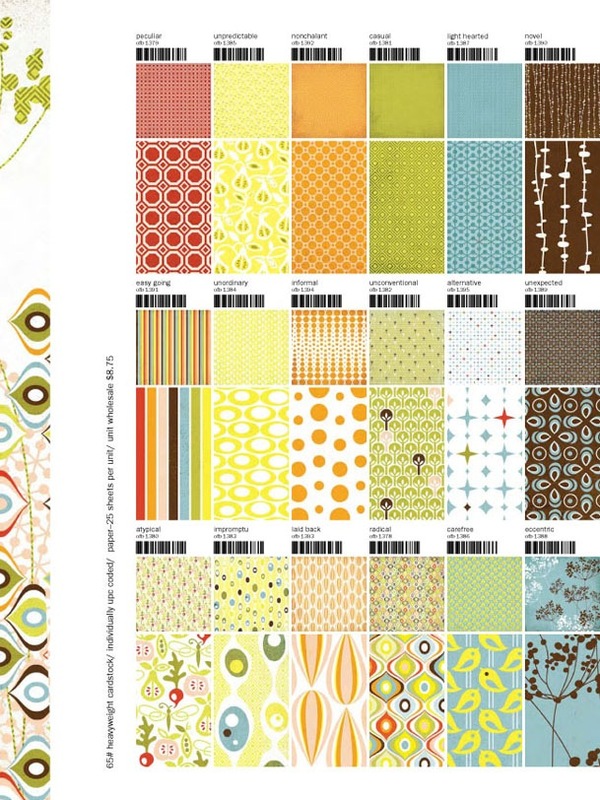 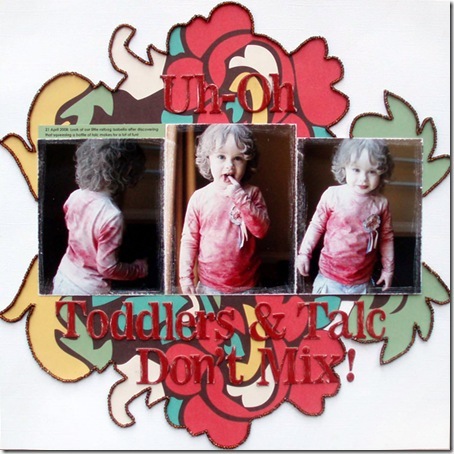 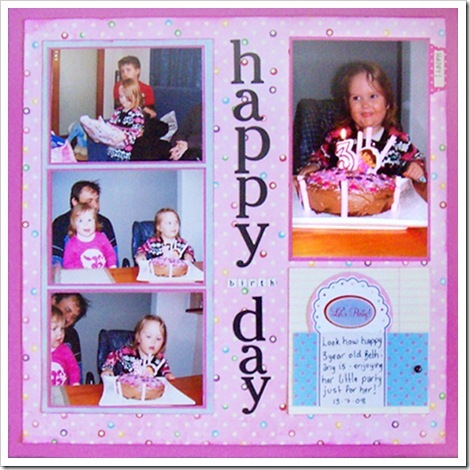 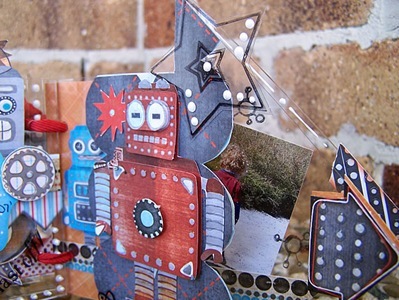 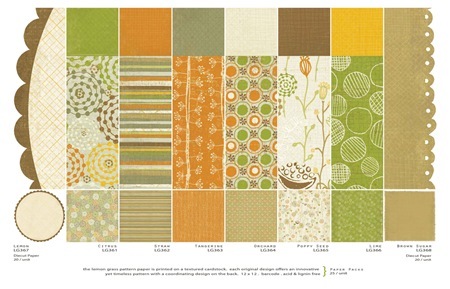 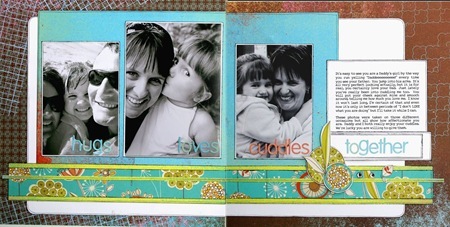 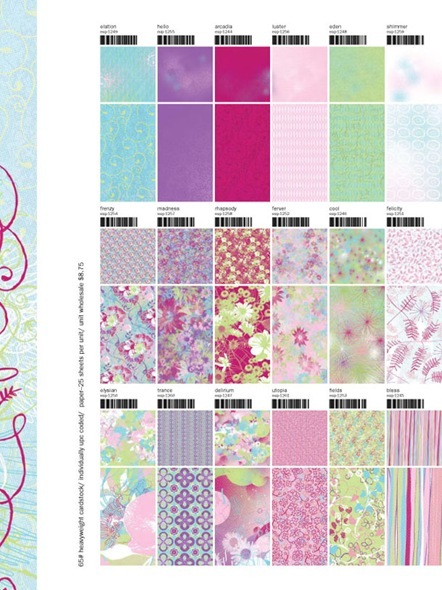 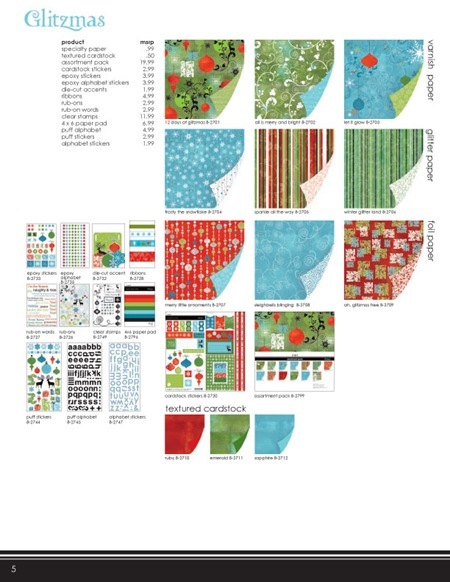 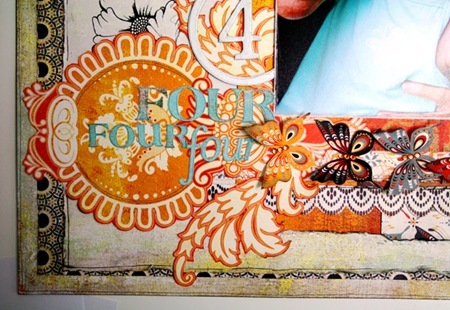 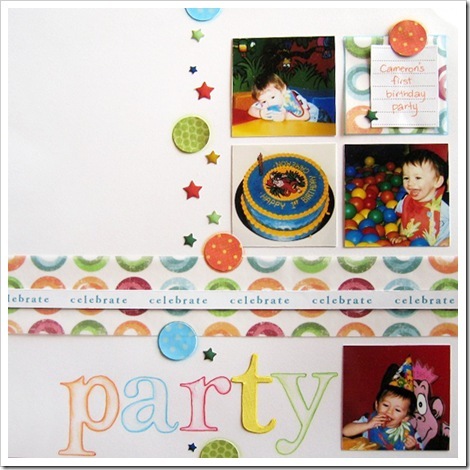 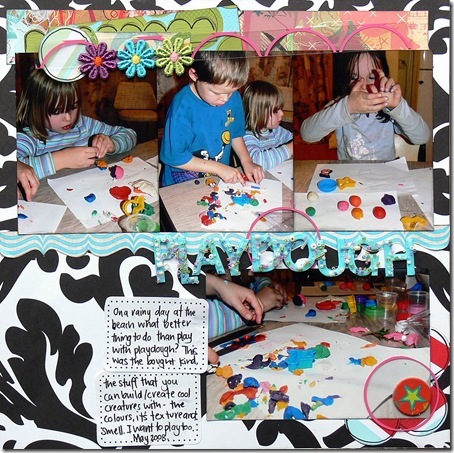 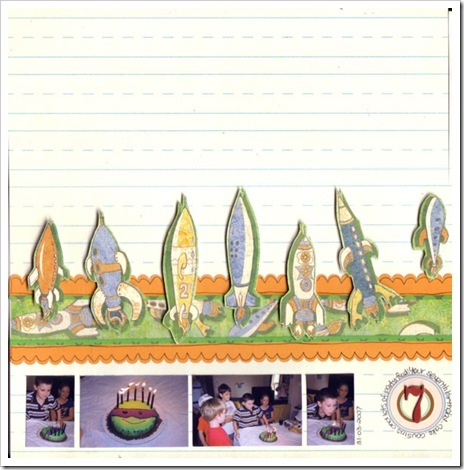 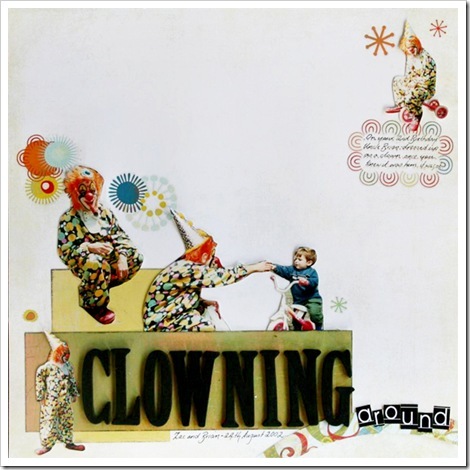 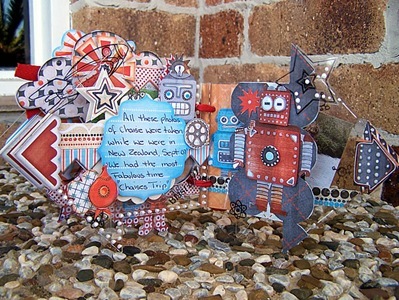 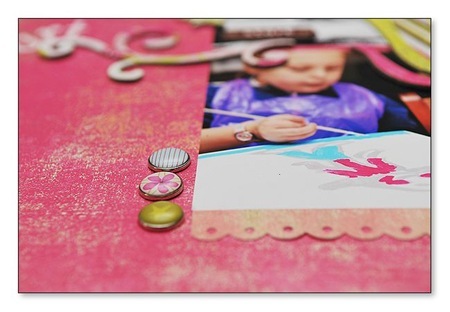 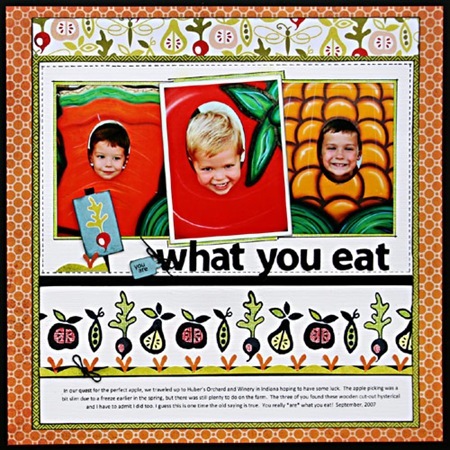 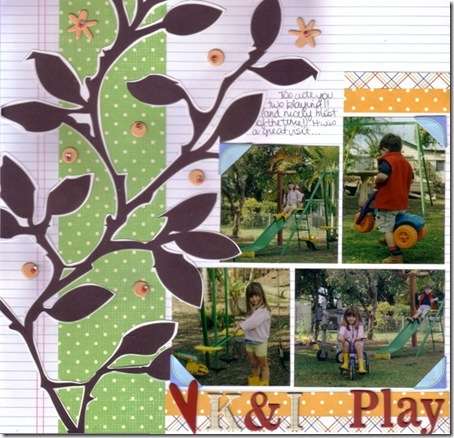 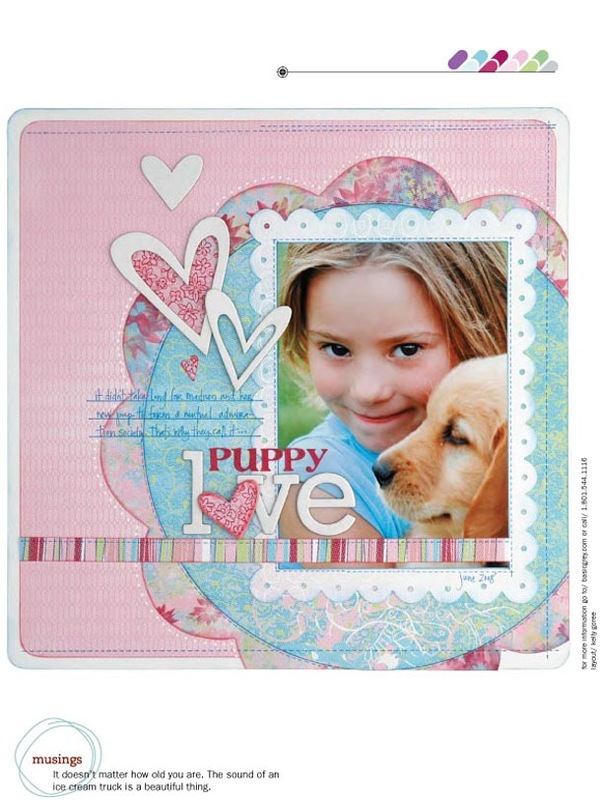 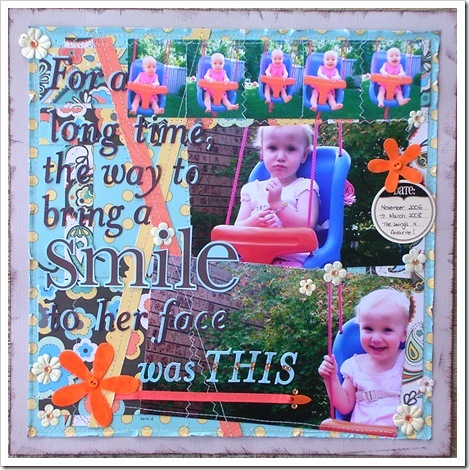 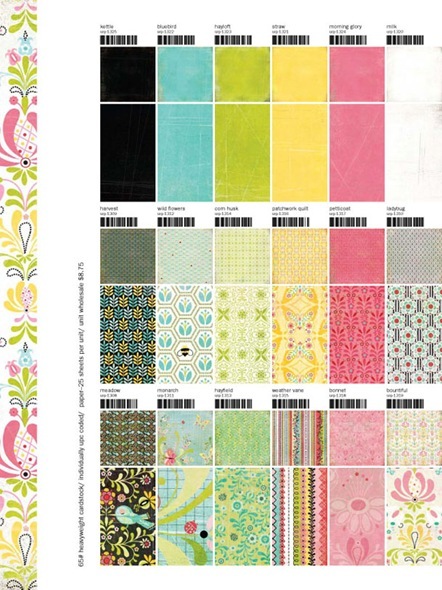 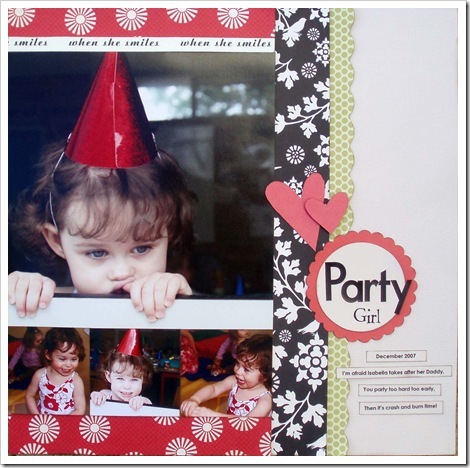 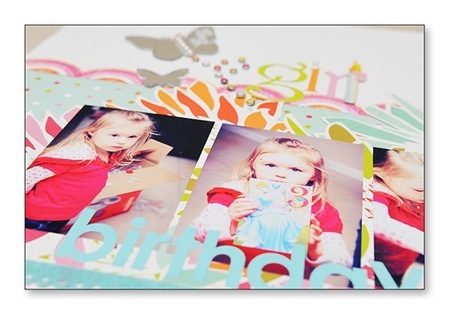 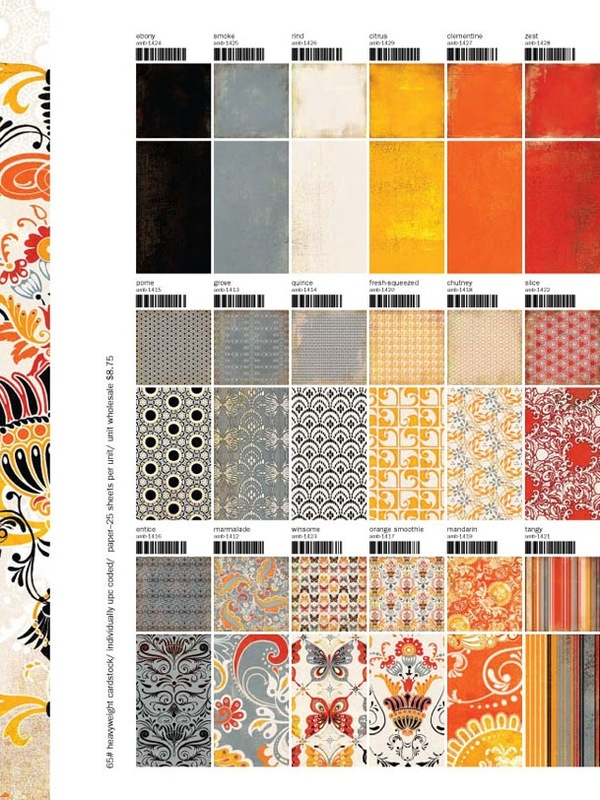 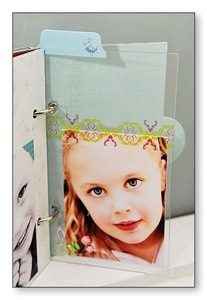 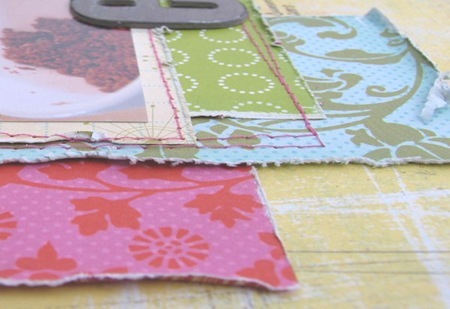 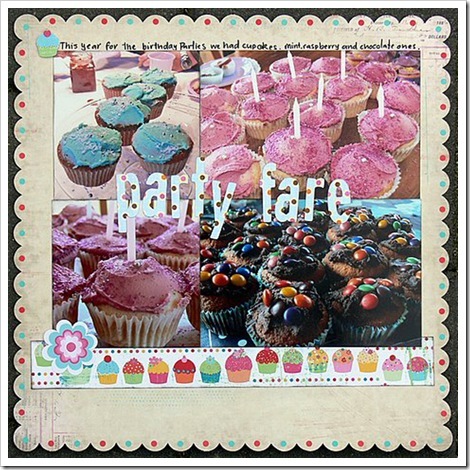 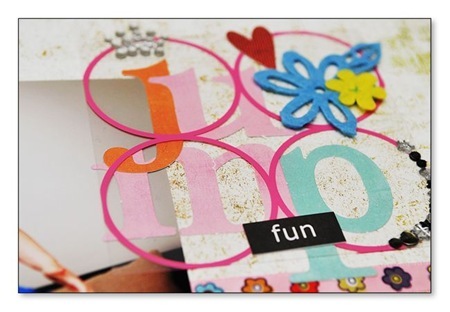 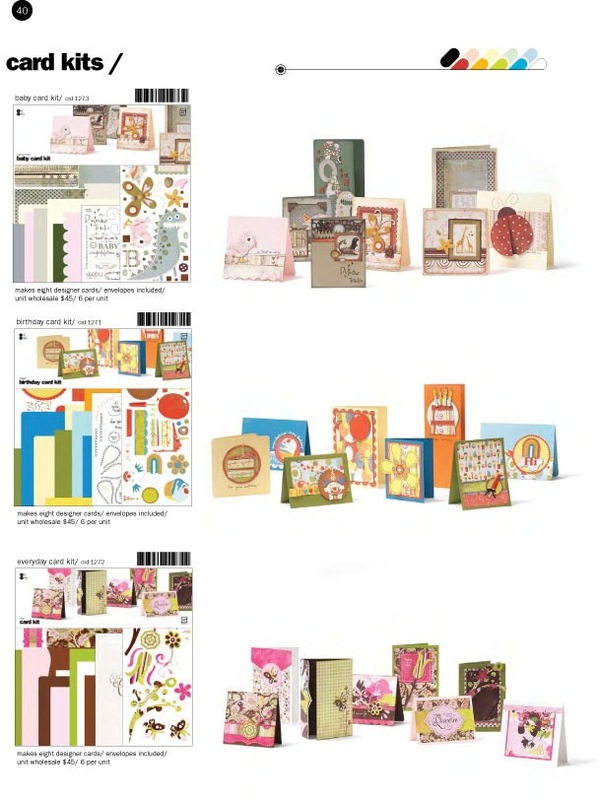 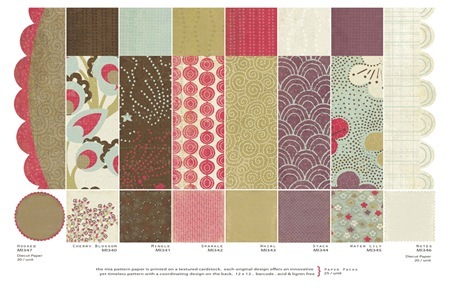 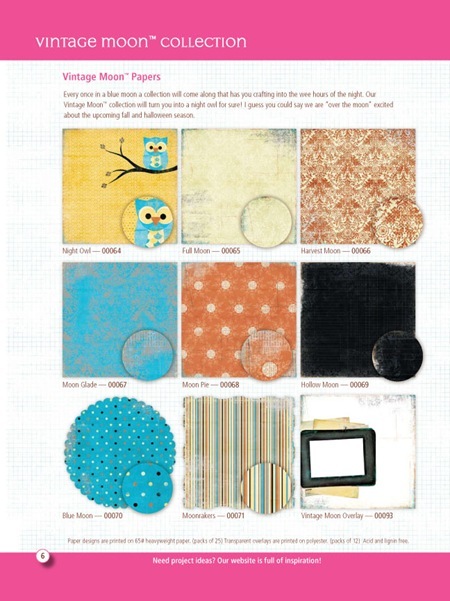 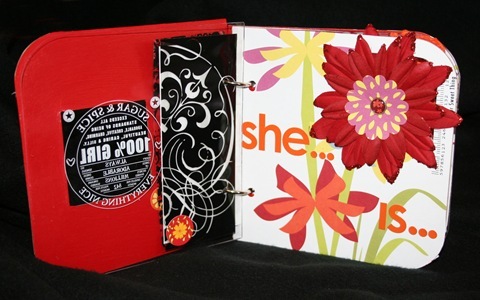 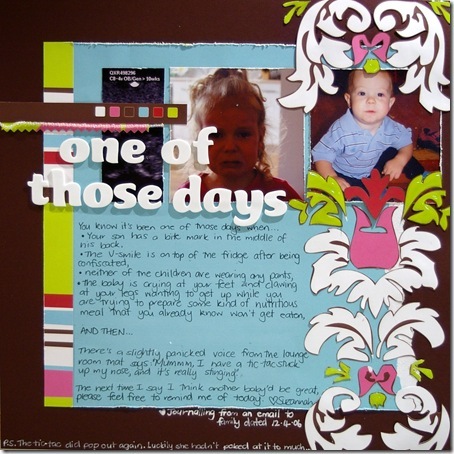 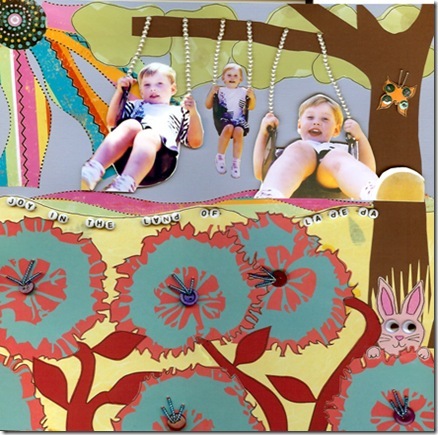 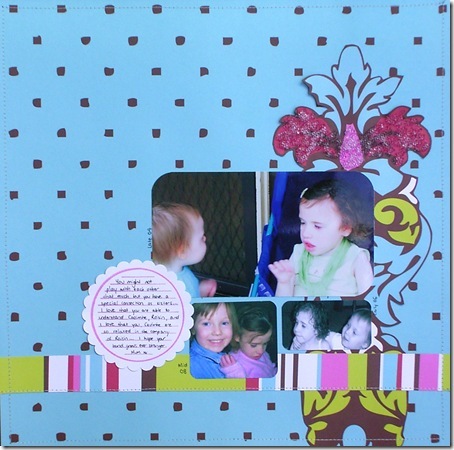 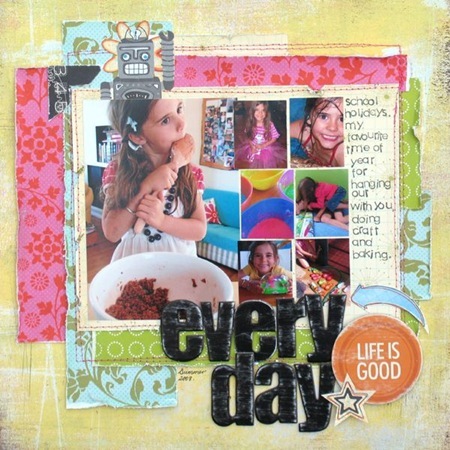 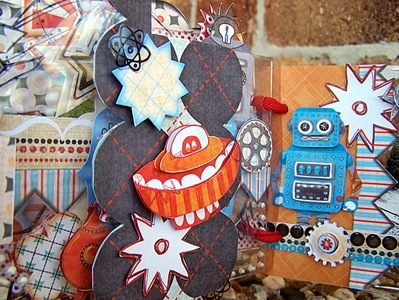 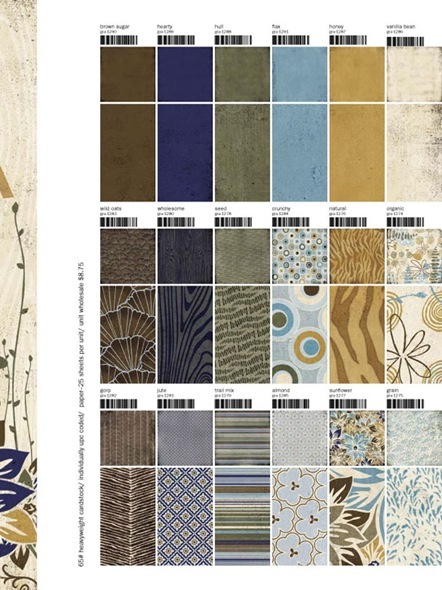 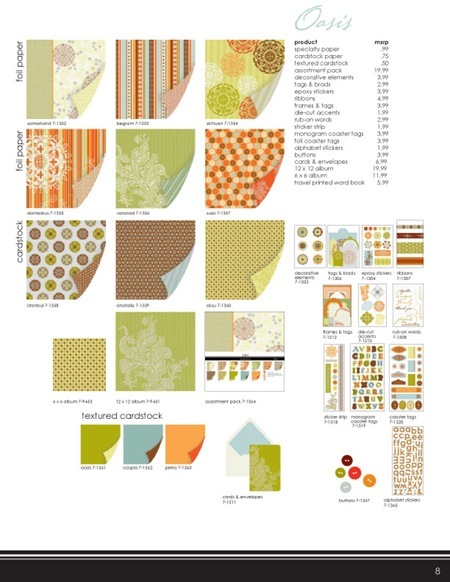 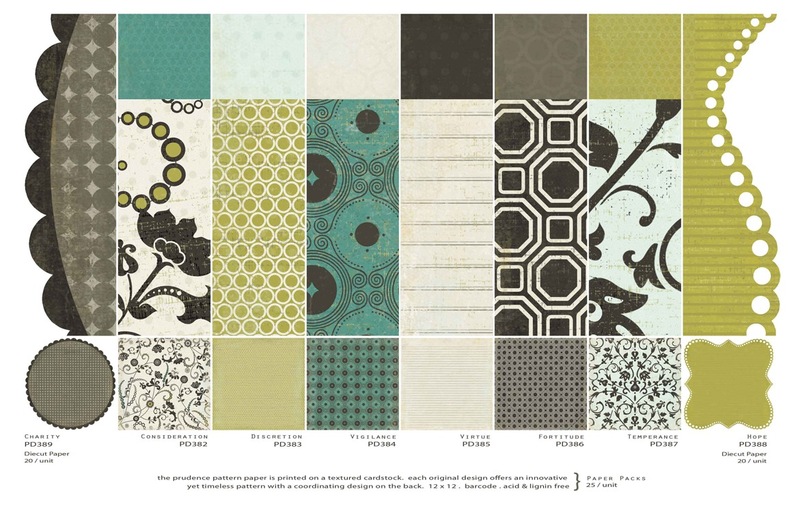 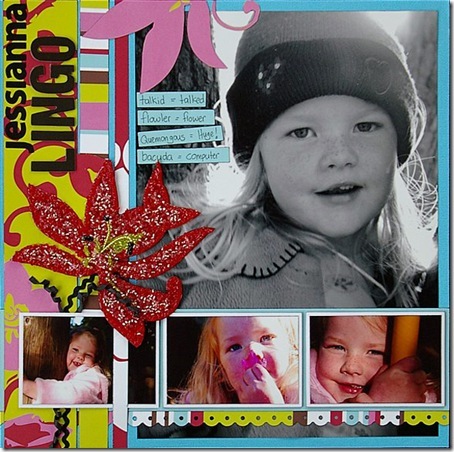 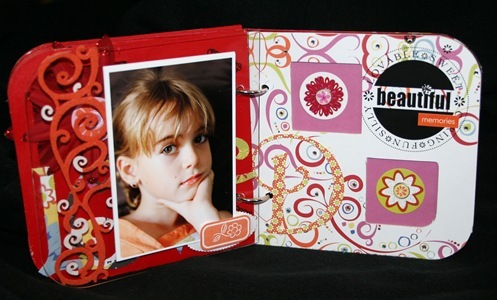 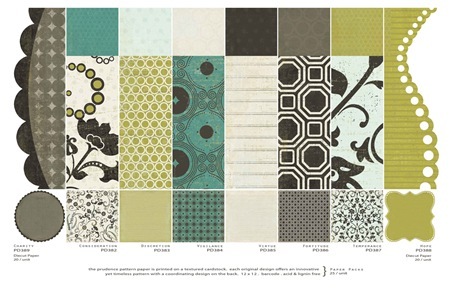 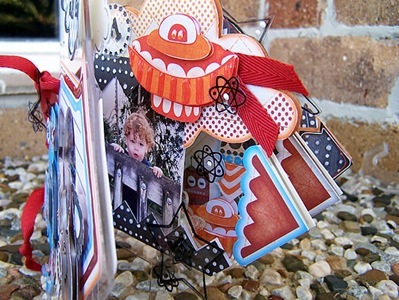 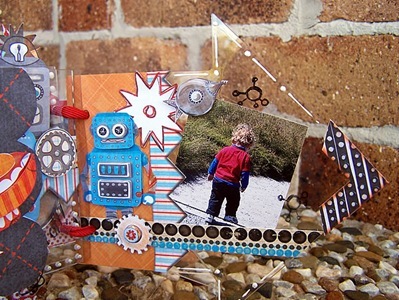 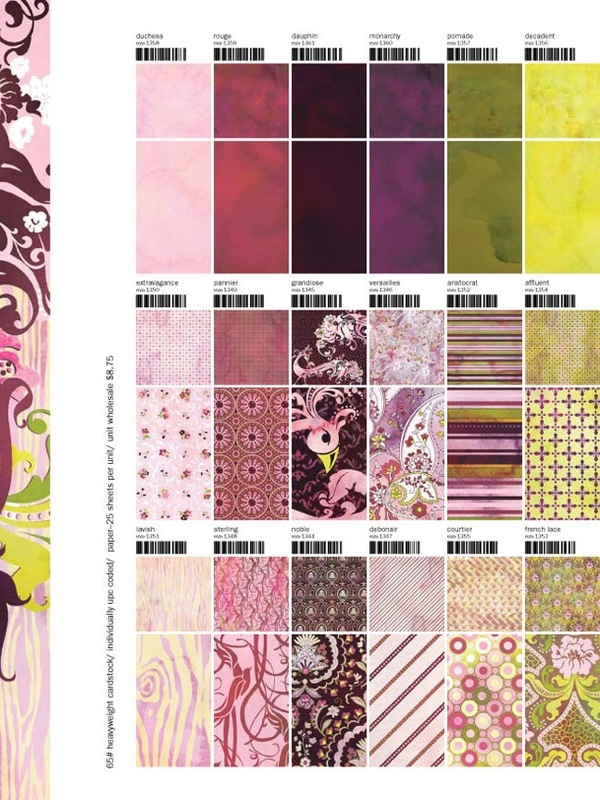 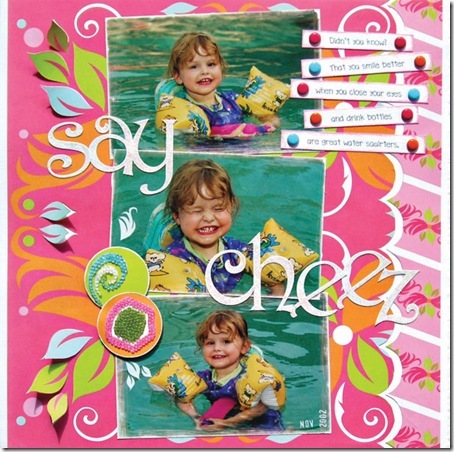 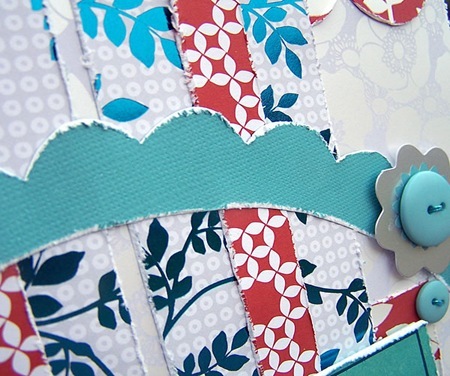 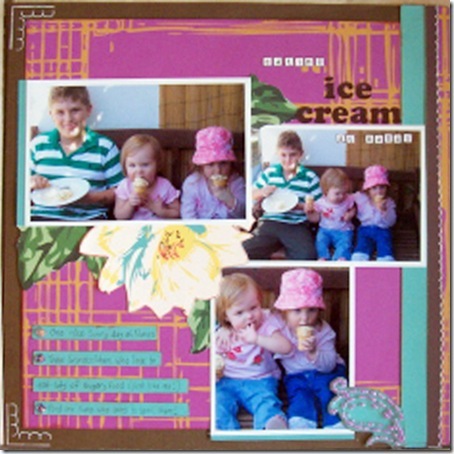 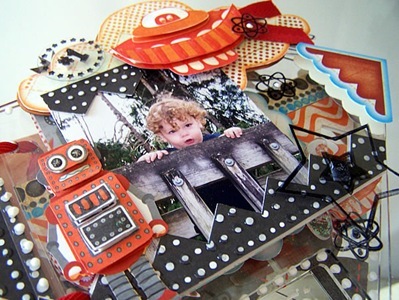 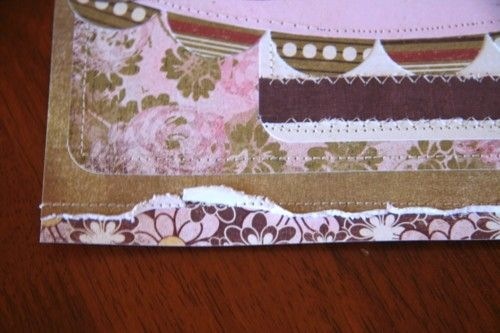 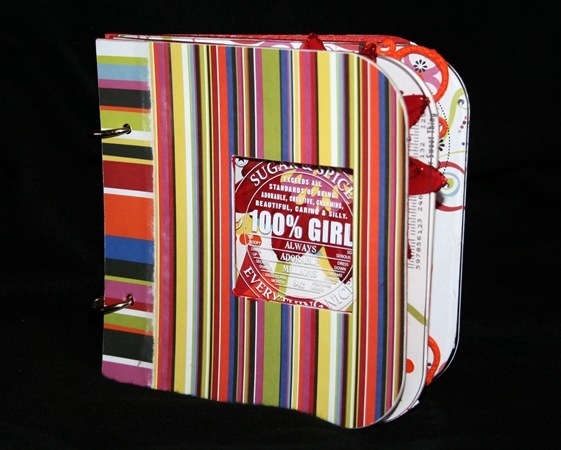 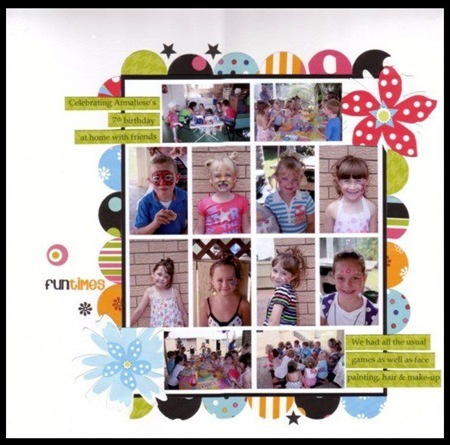 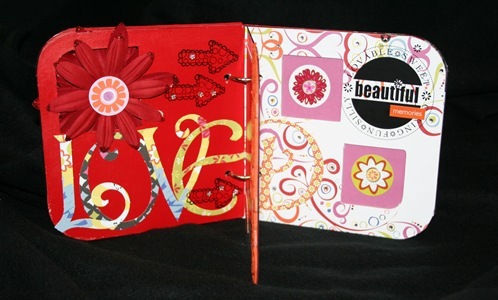 Patterned Papers from both companies make this fun double page layout something every scrapper will want in their album. 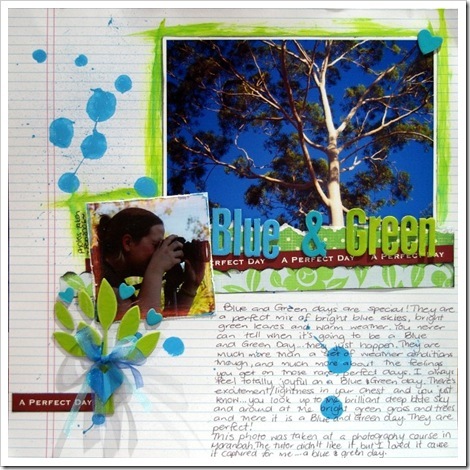 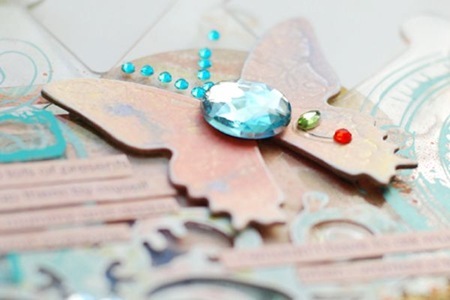 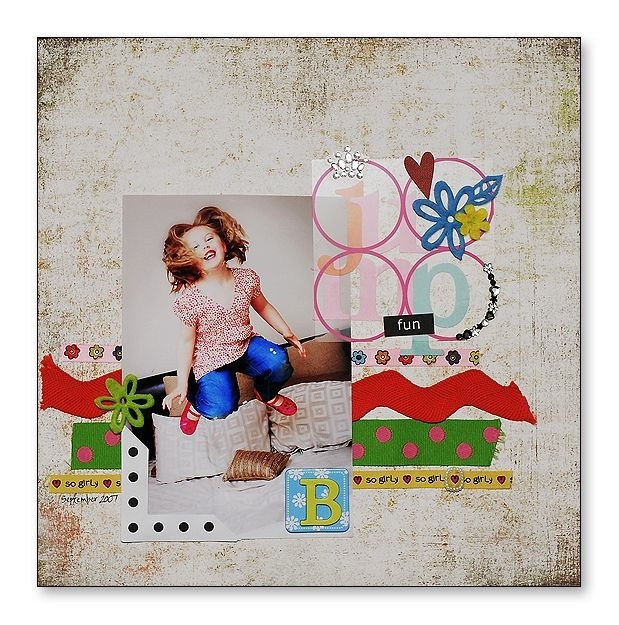 With bright blues and greens and gorgeous gem brads, this layout will suit any photos you have been waiting to scrap and didn’t know how. 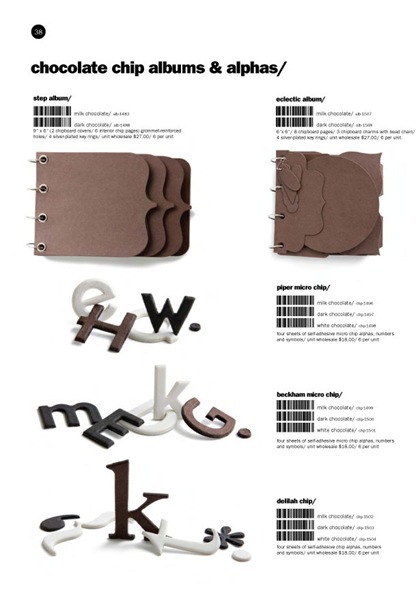 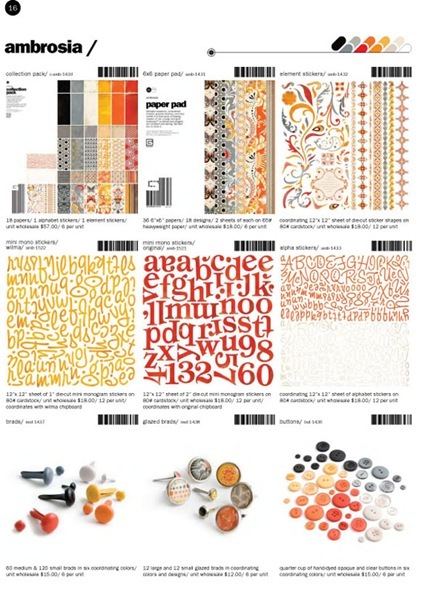 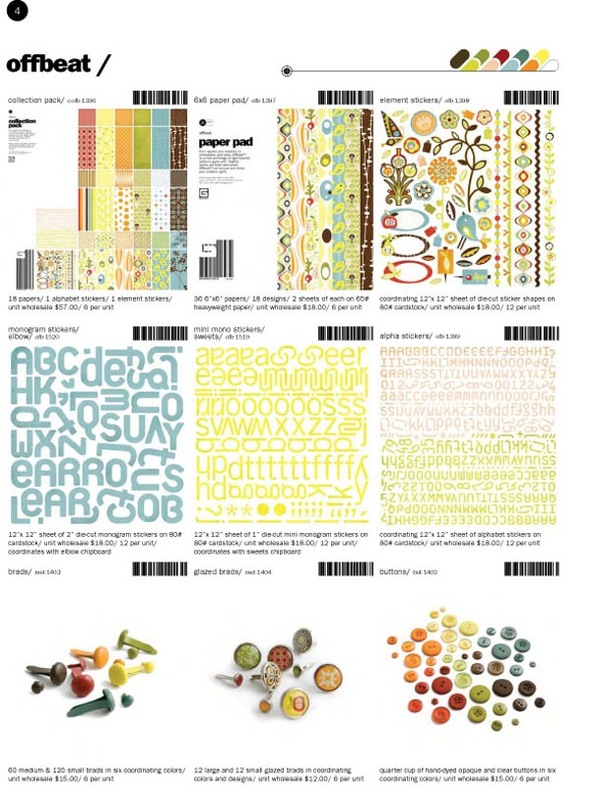 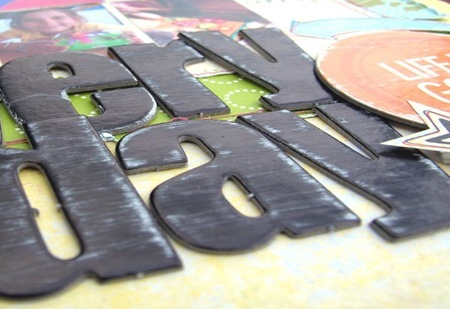 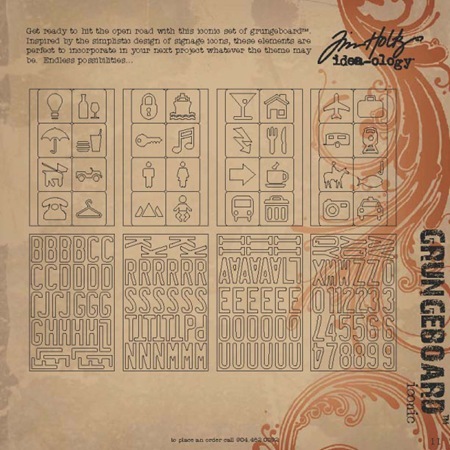 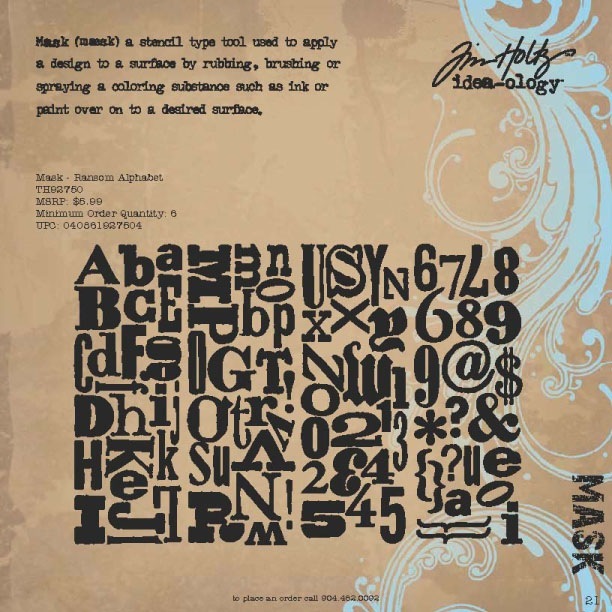 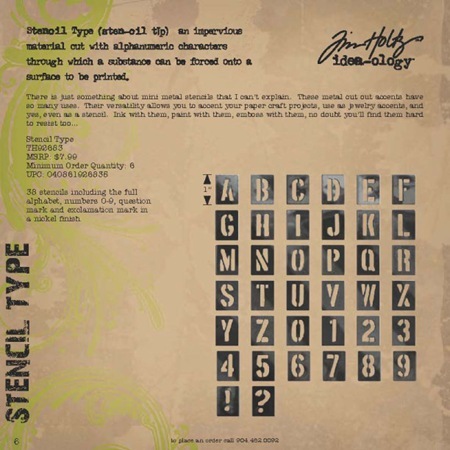 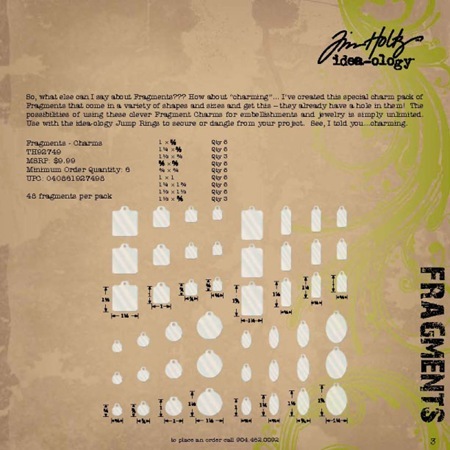 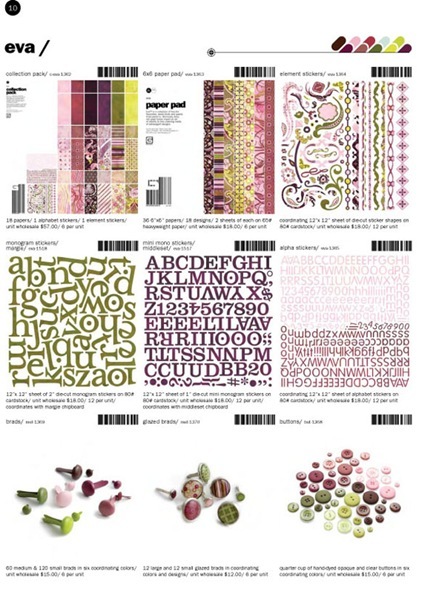 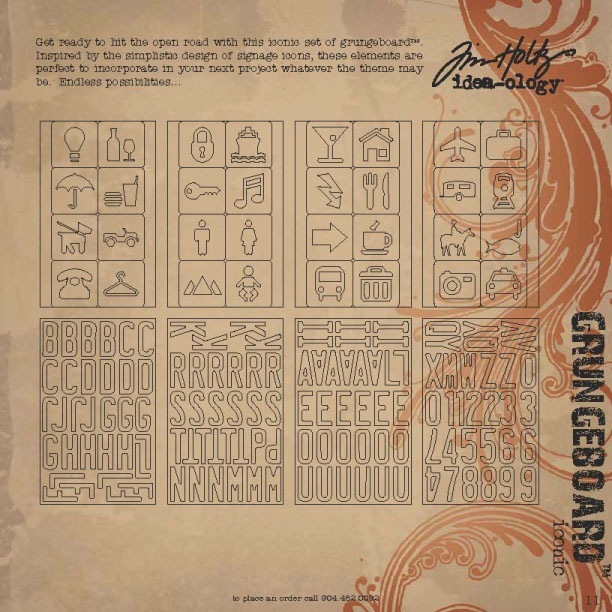 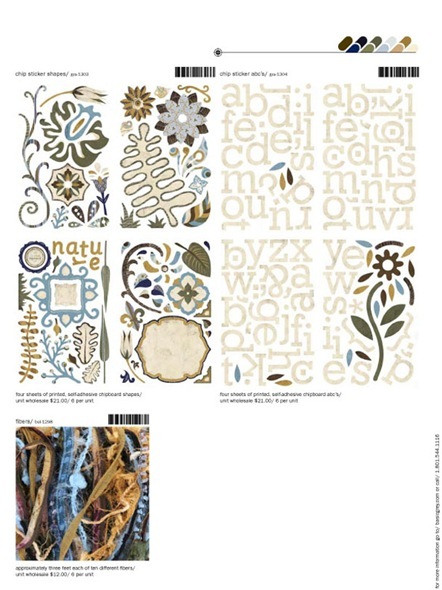 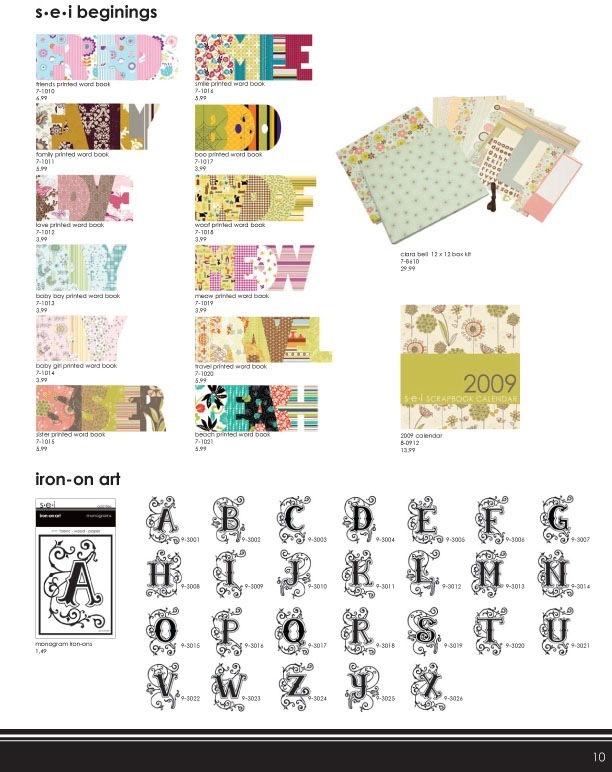 A large alphabet set is provided for your to create any theme of layout you wish. 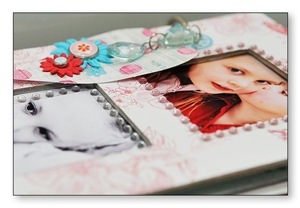 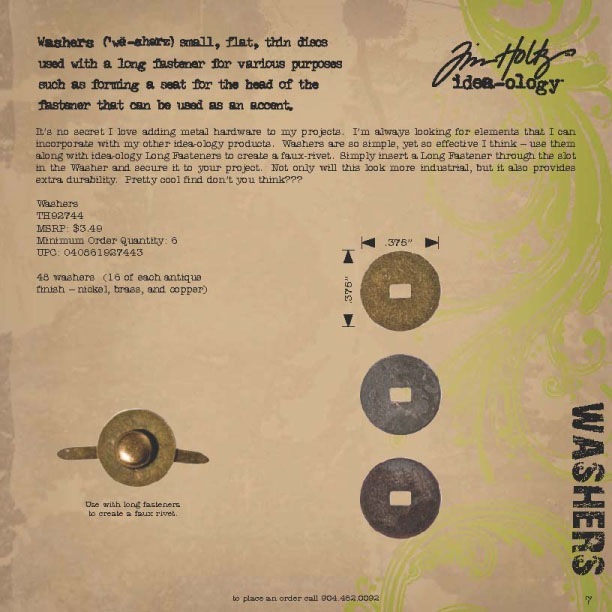 Once you have finished you will find you can use this easy format again and again – an added bonus to this class. 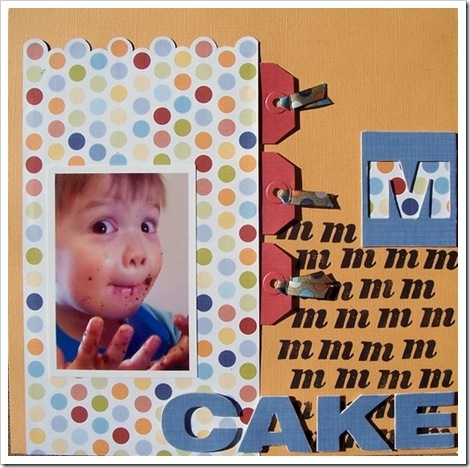 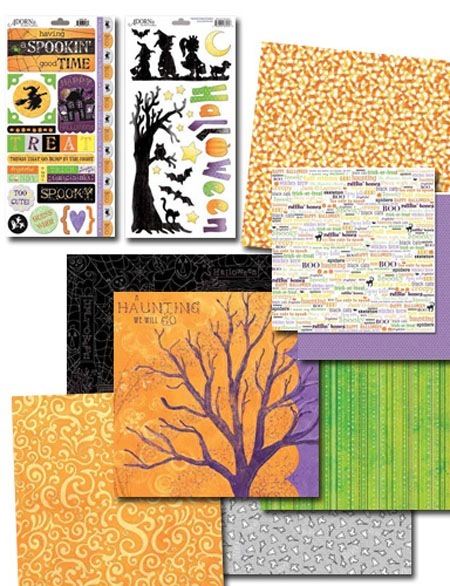 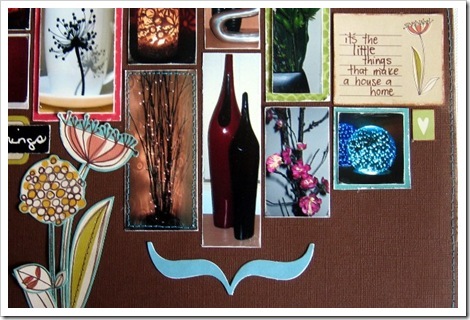 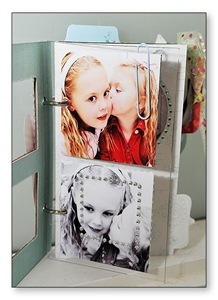 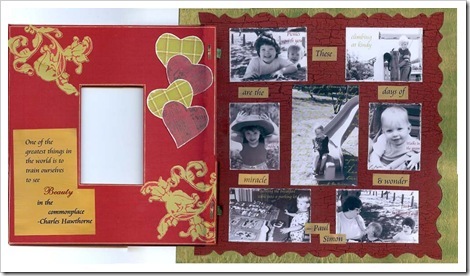 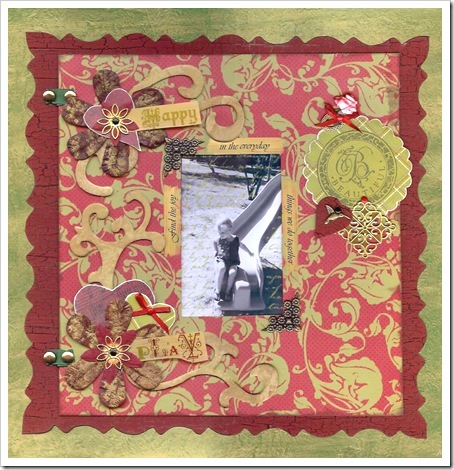 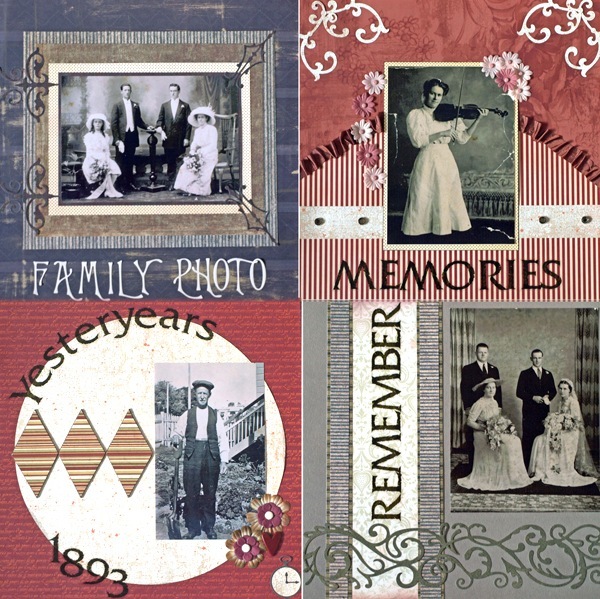 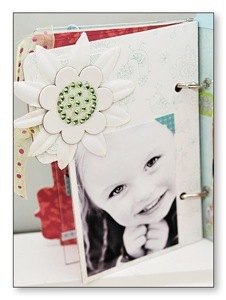 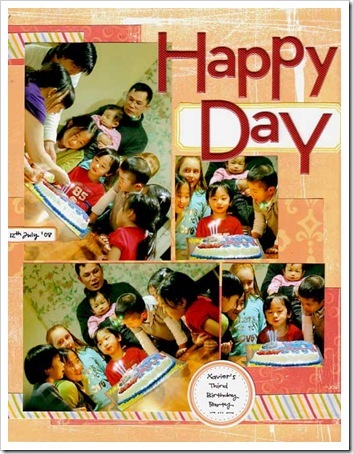 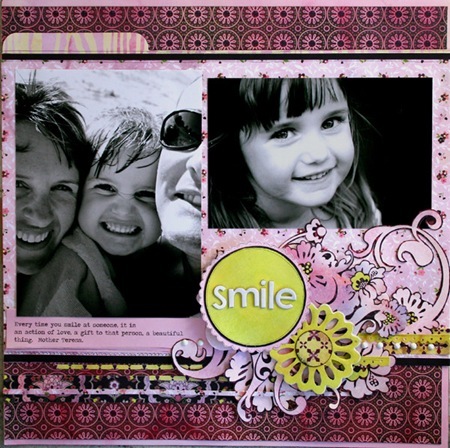 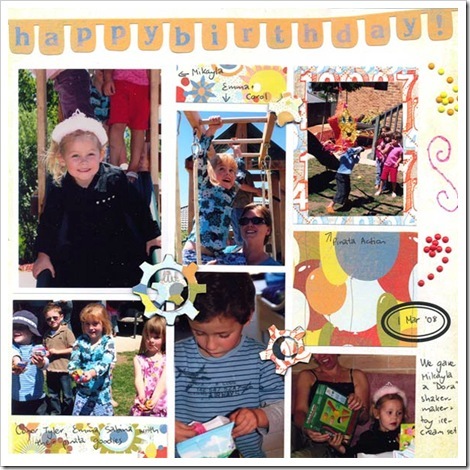 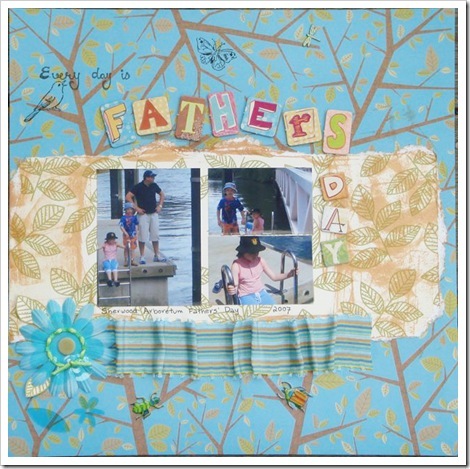 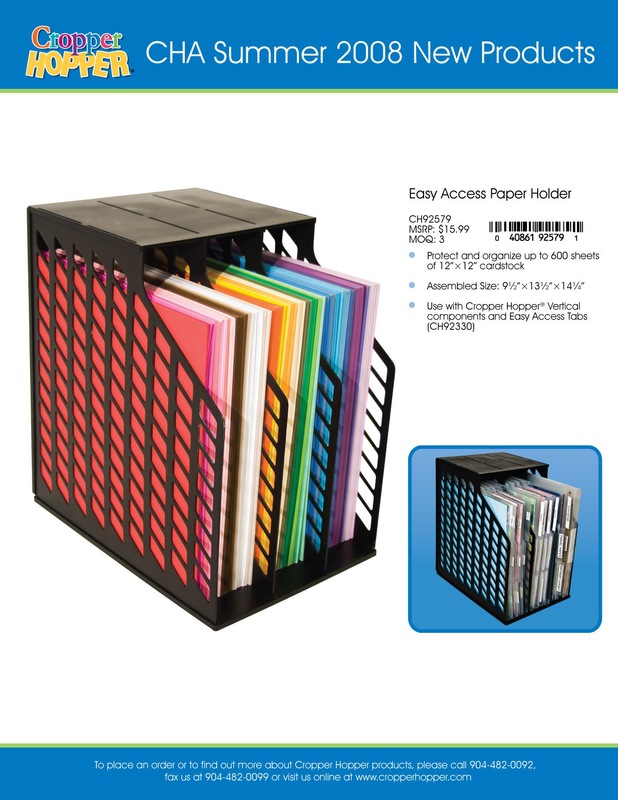 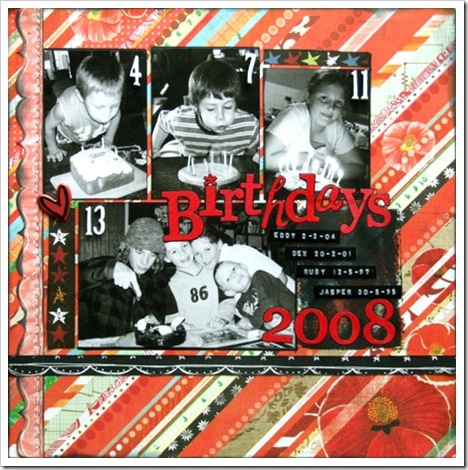 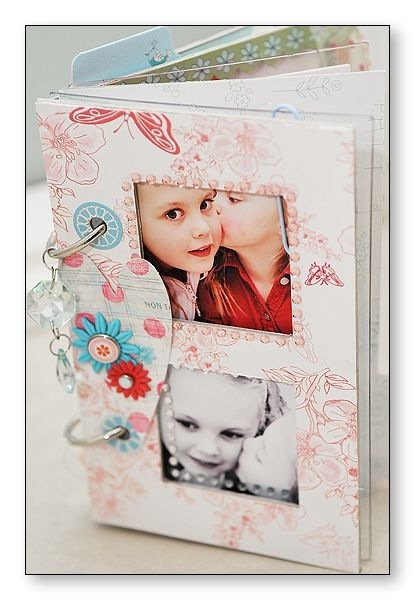 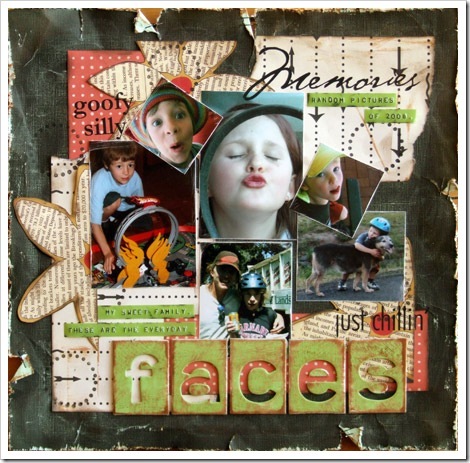 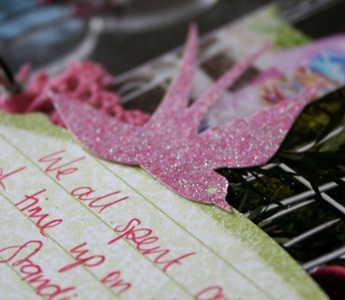 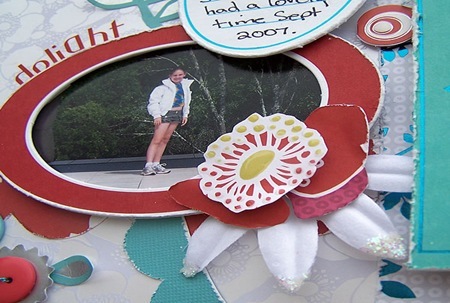 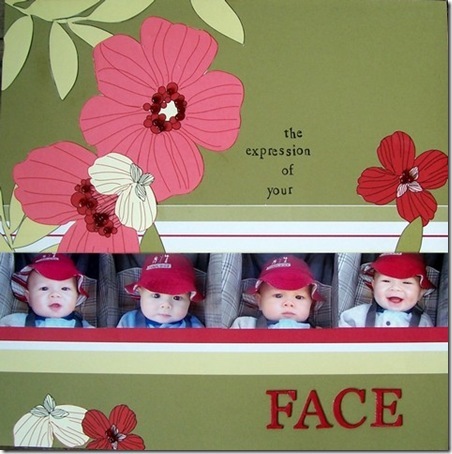 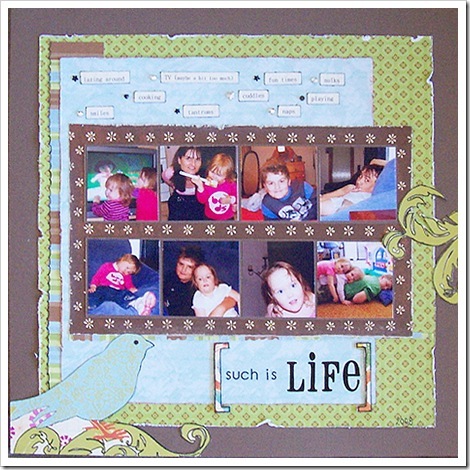 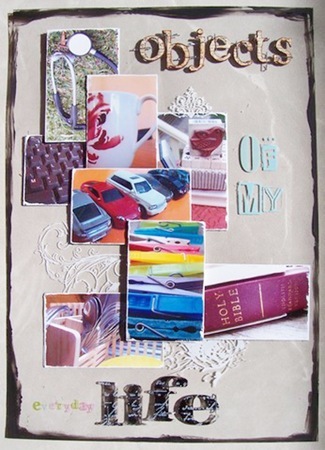 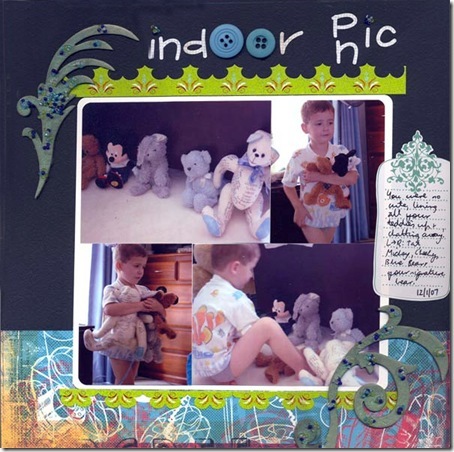 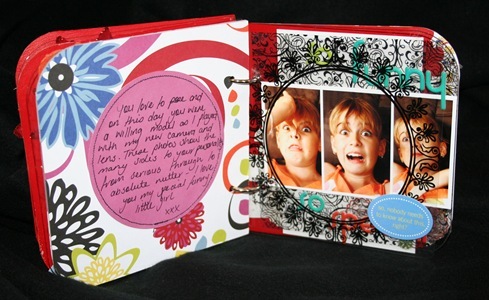 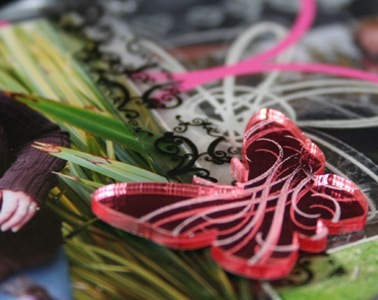 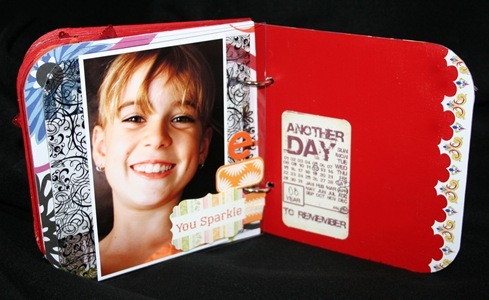 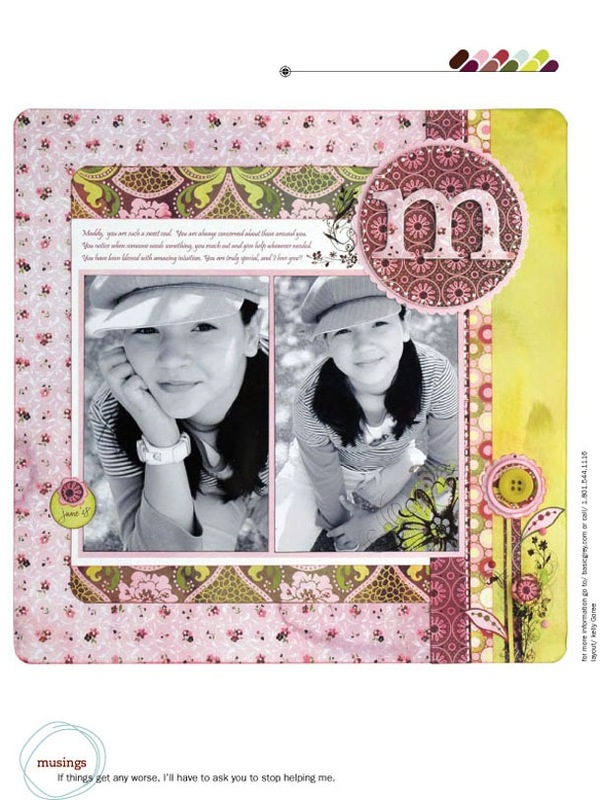 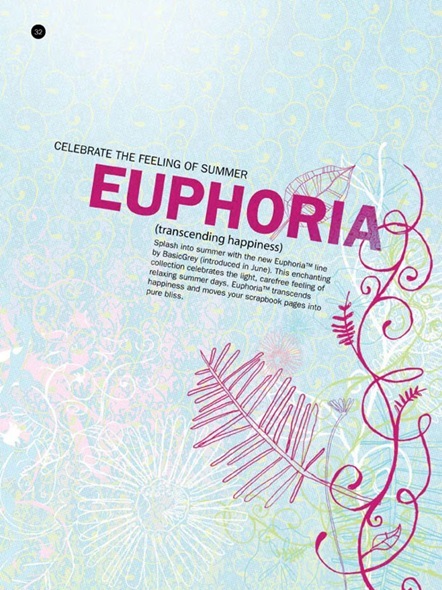 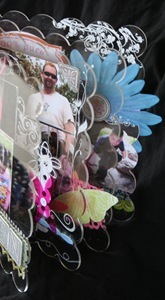 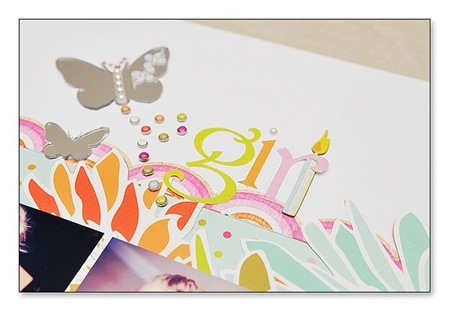 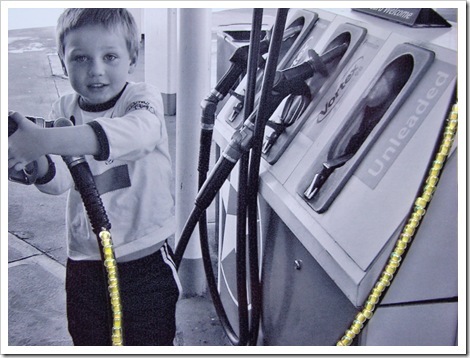 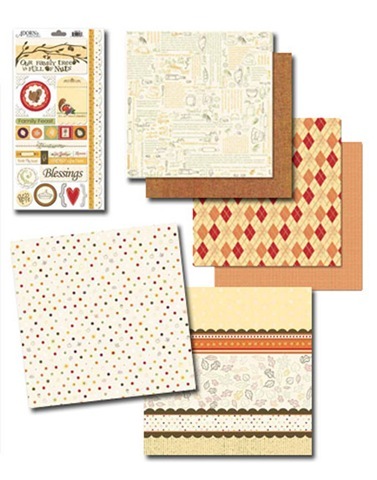 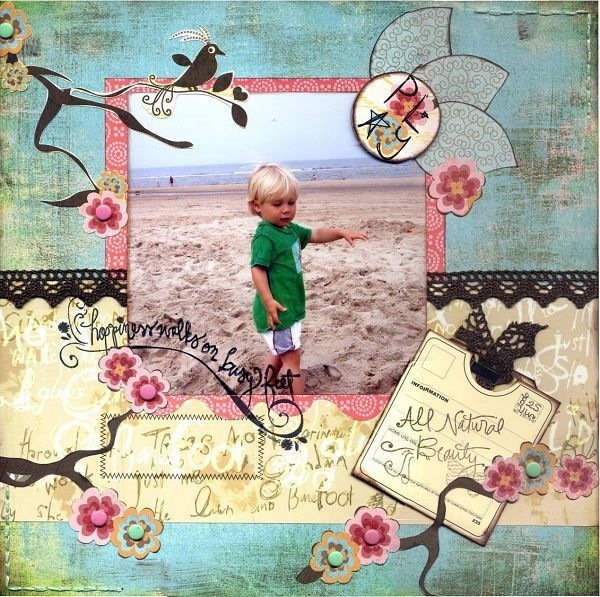 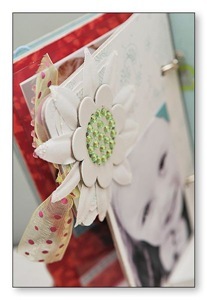 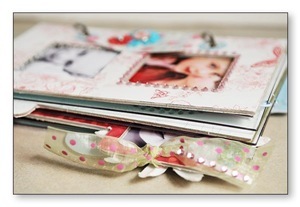 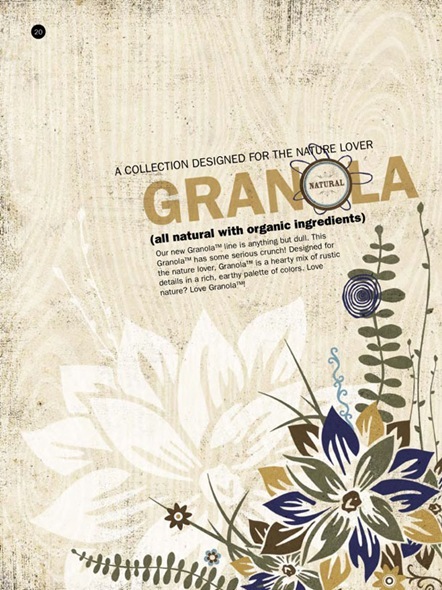 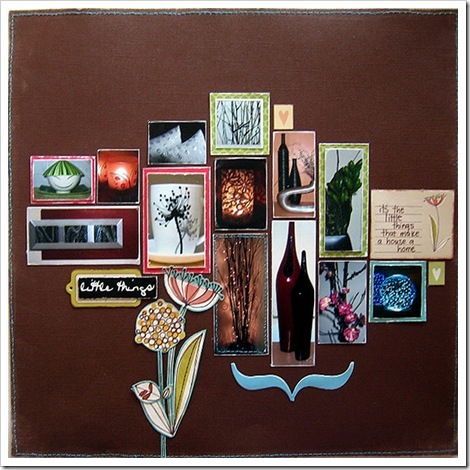 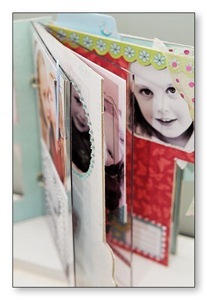 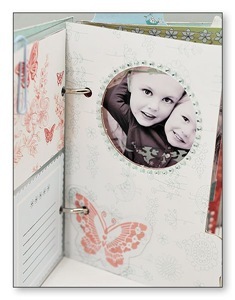 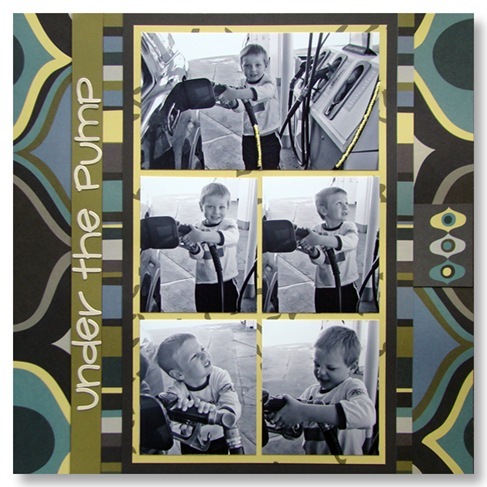 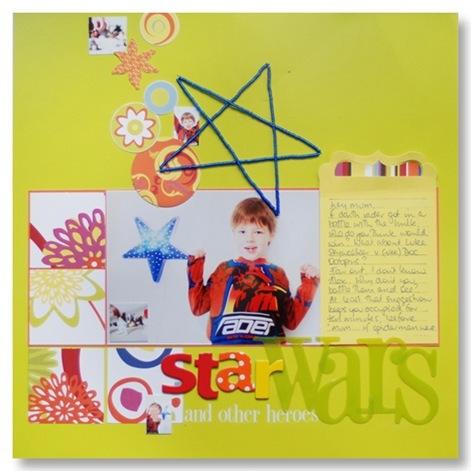 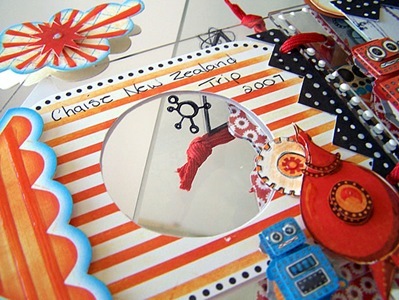 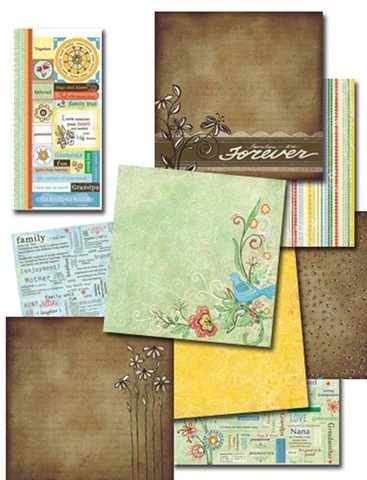 Scrapbook those important photos of someone special in your life using the Harvest range of papers from Scenic Route. 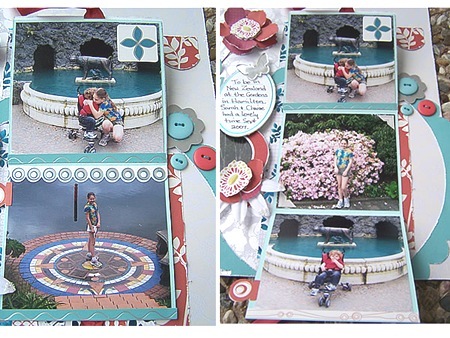 This double layout showcases three large photos with a full pack of SEI Mini Coasters and a full Carolee’s sticker pack so you can personalise your layouts! In response to the numerous requests we receive for Heritage layouts, this month we have designed a Heritage quick and easy kit. 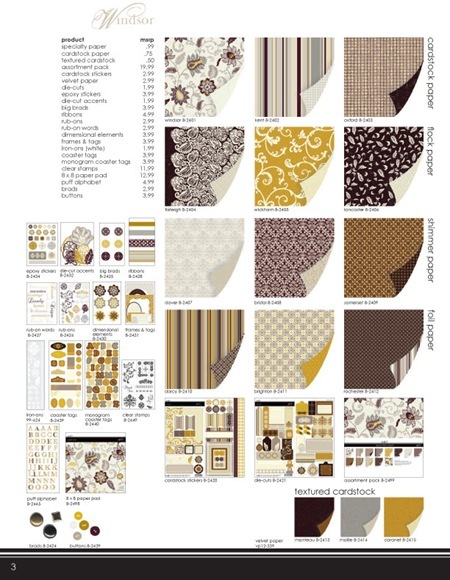 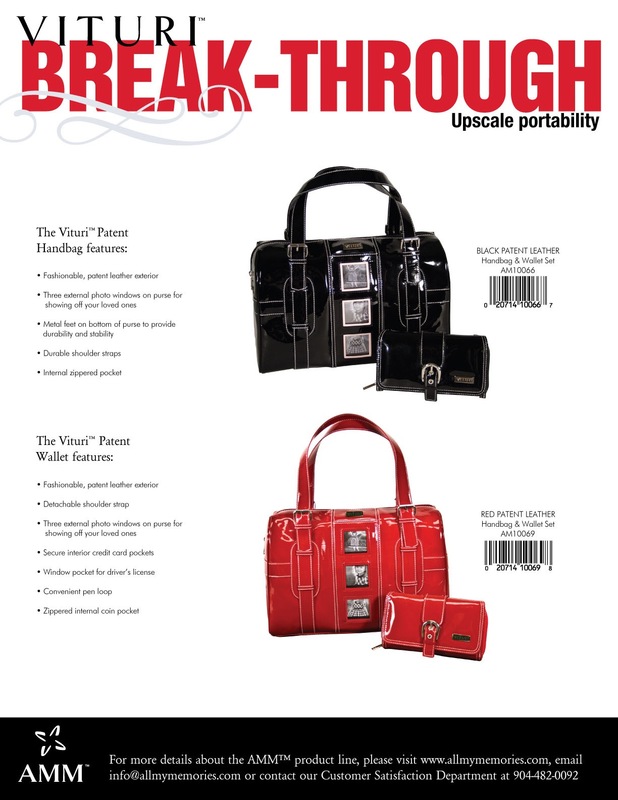 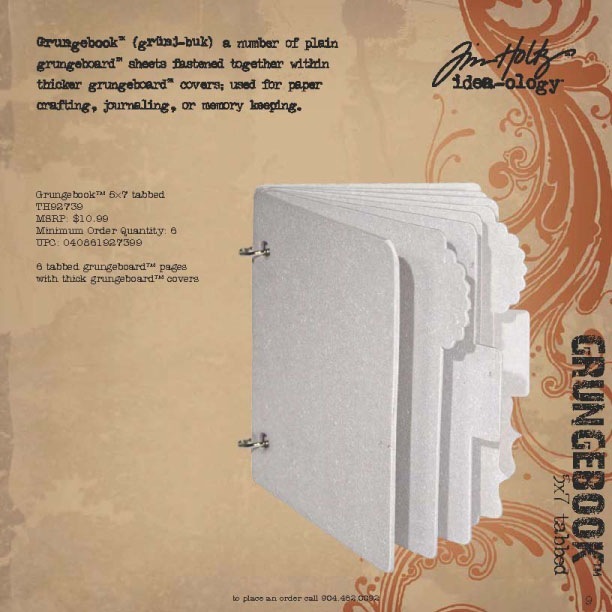 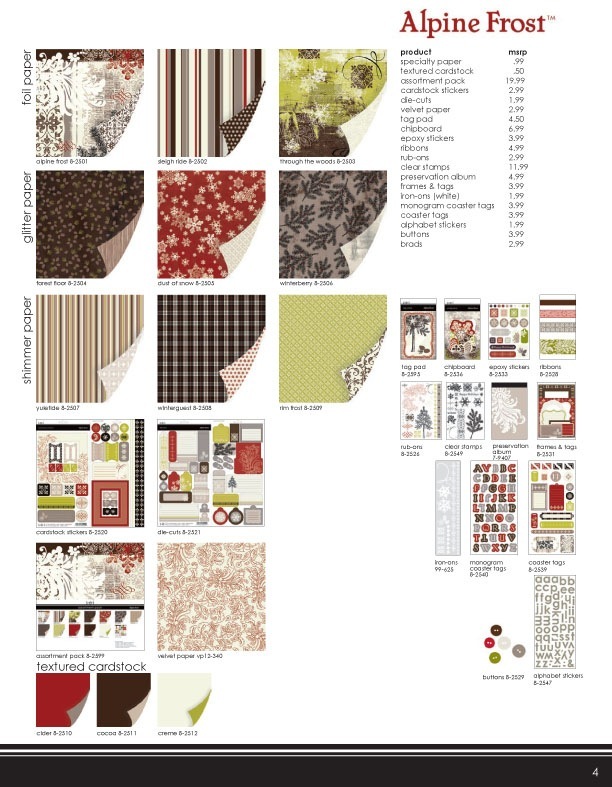 There are 4 single page layouts with 2 in burgundy colourings and 2 in grey-greens. 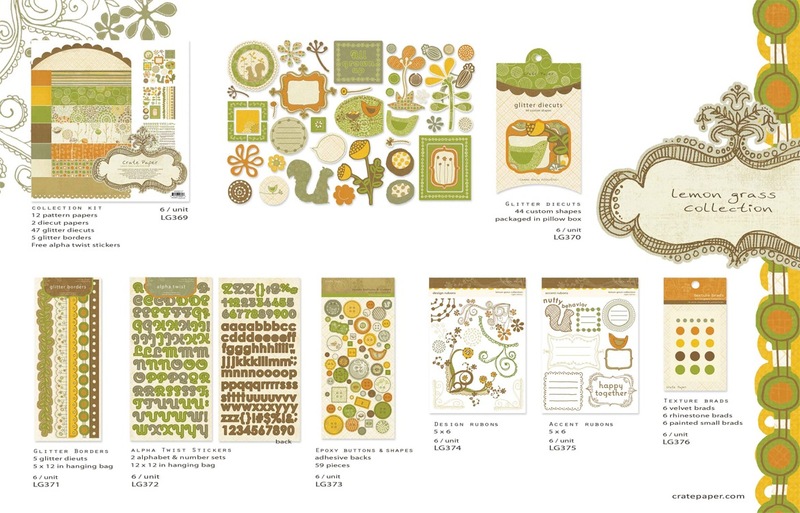 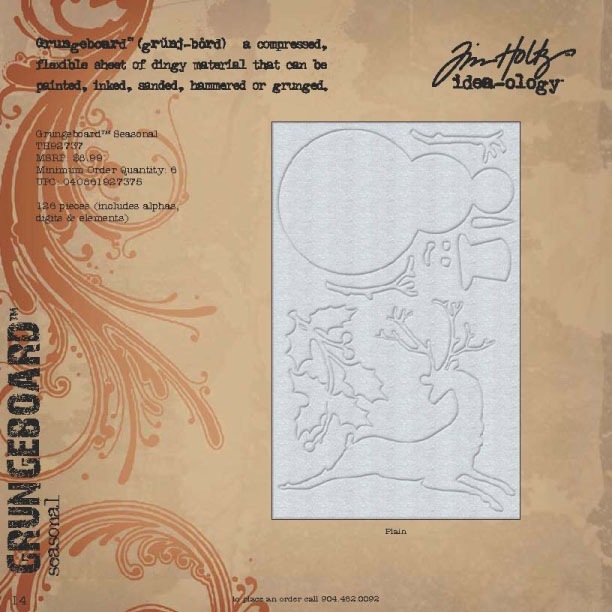 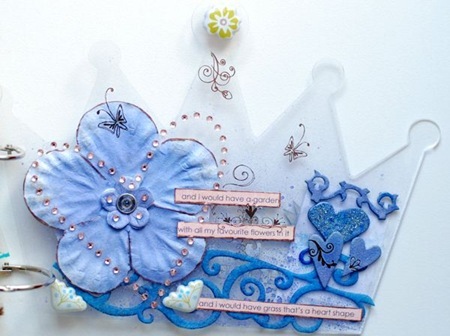 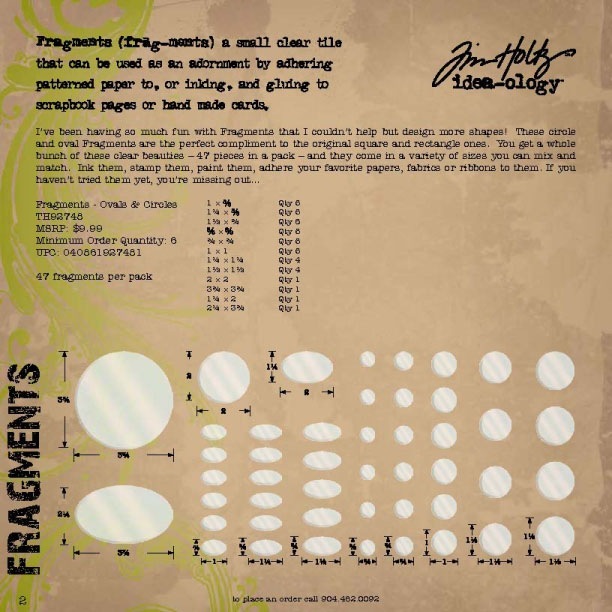 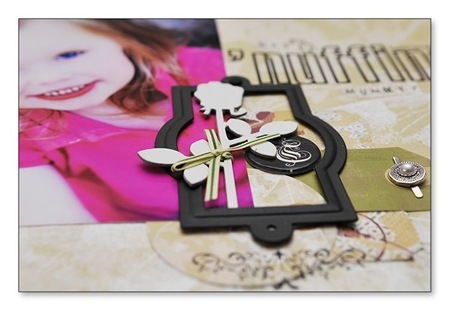 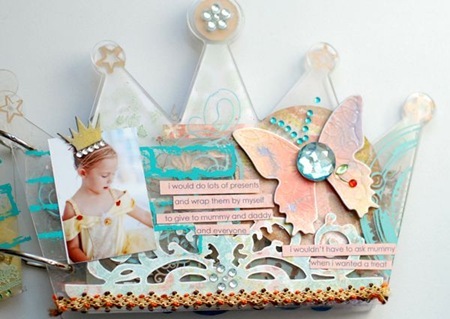 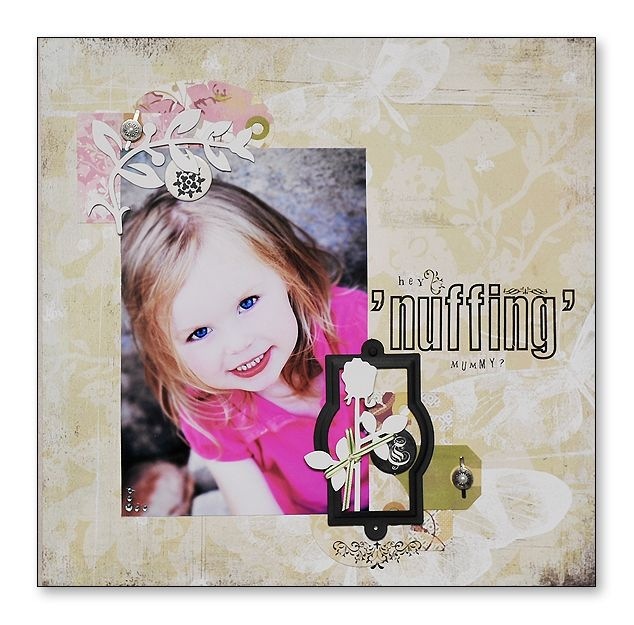 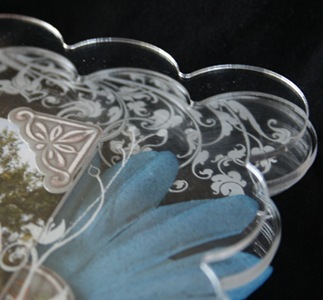 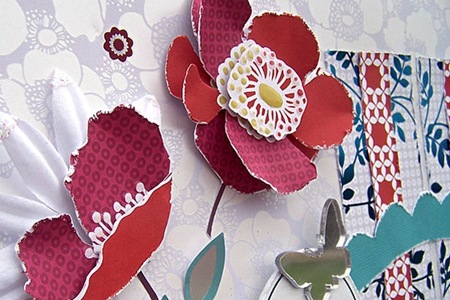 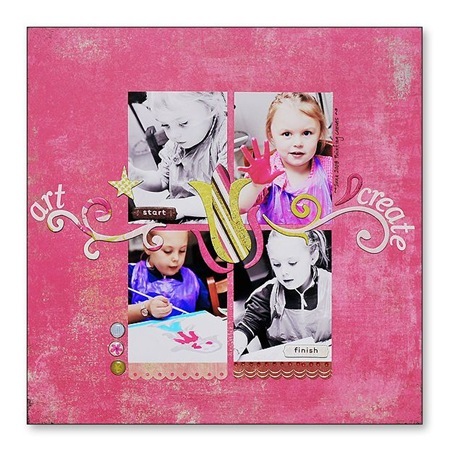 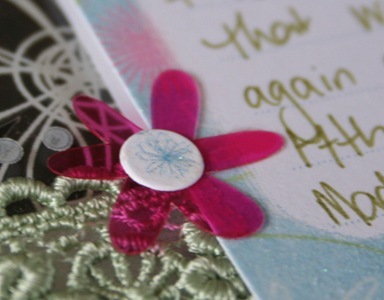 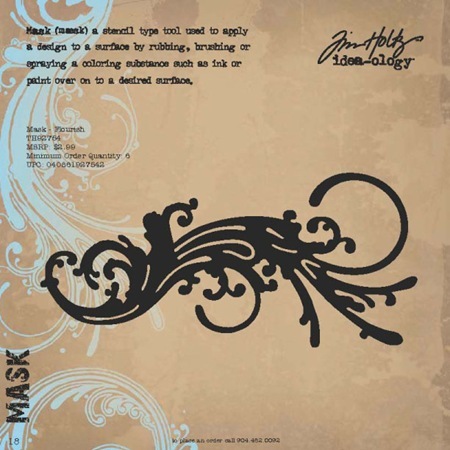 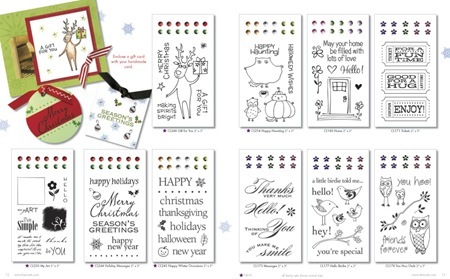 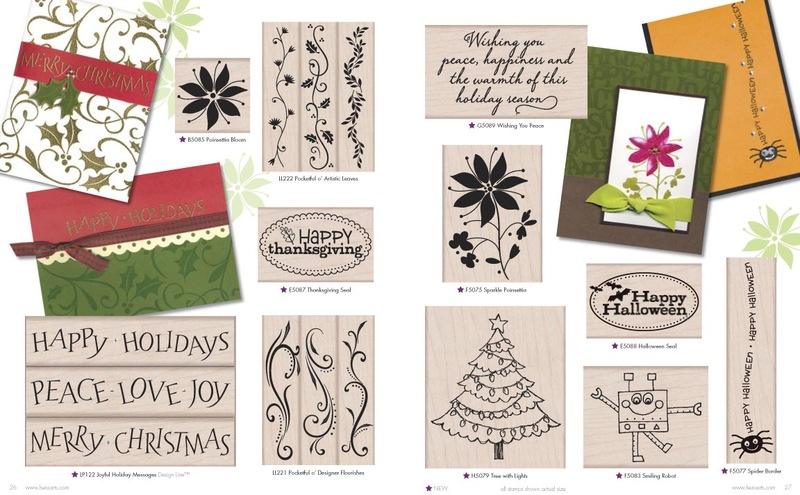 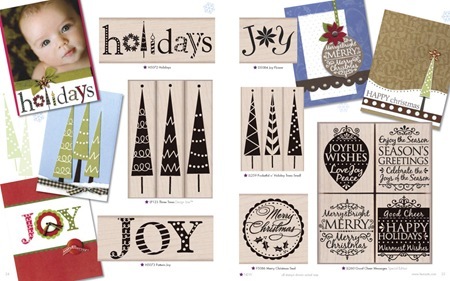 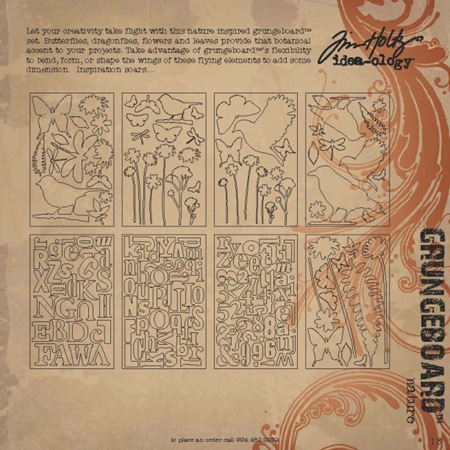 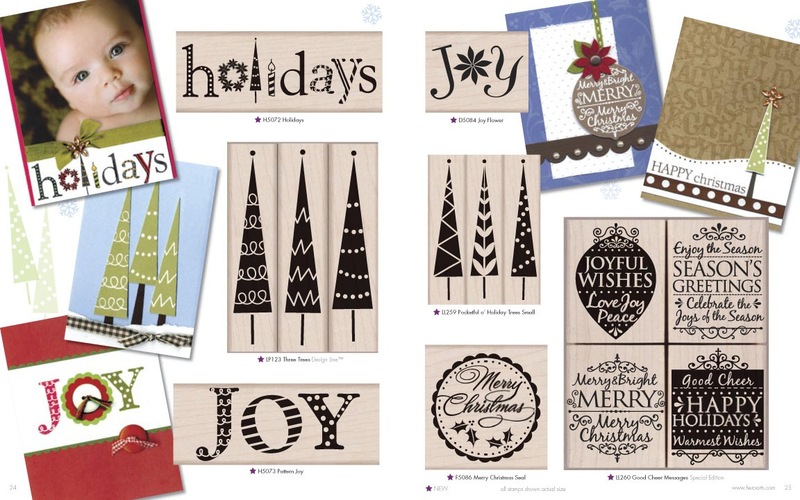 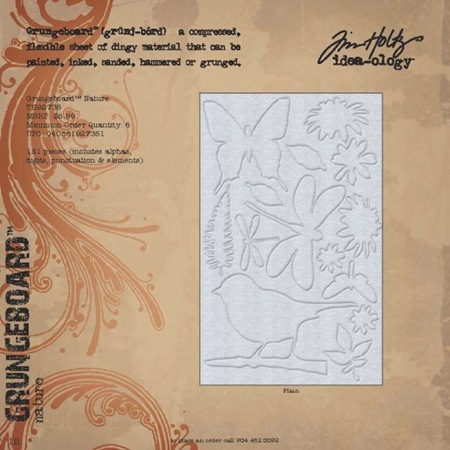 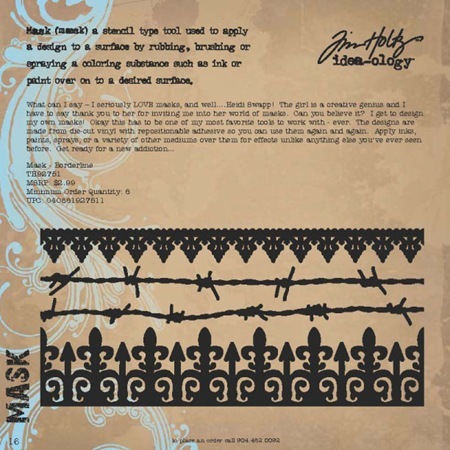 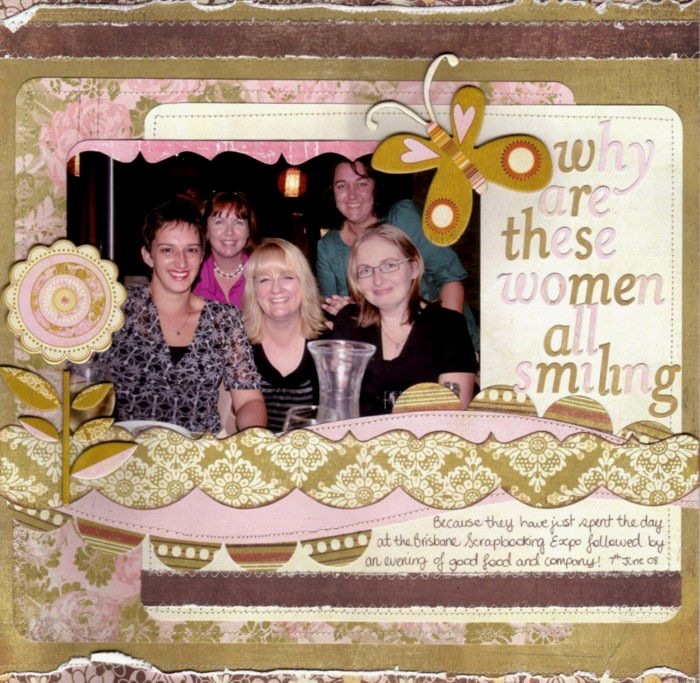 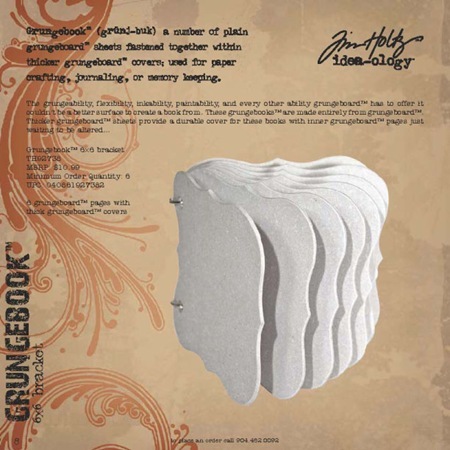 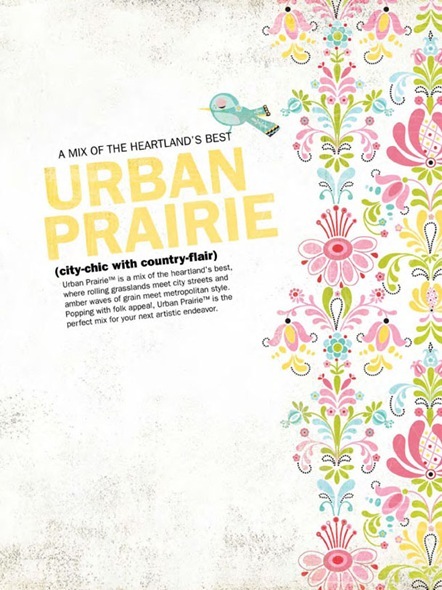 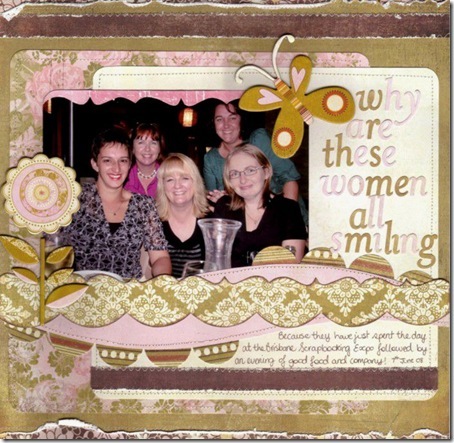 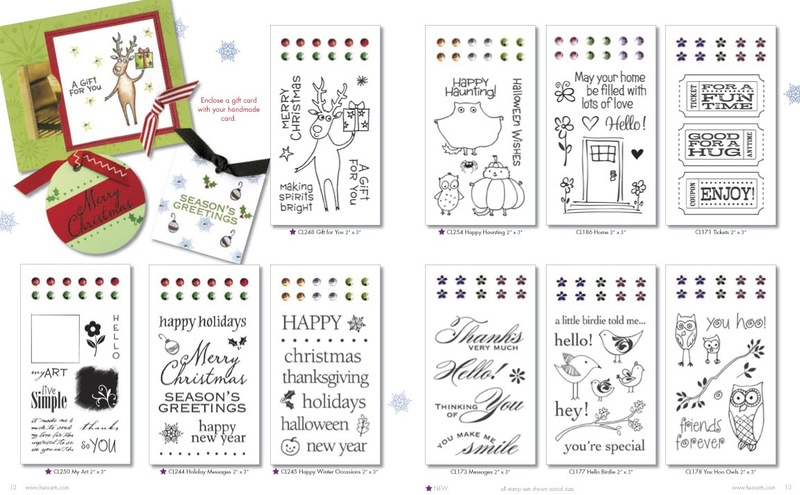 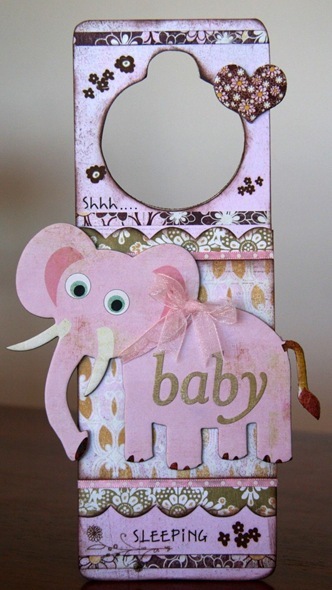 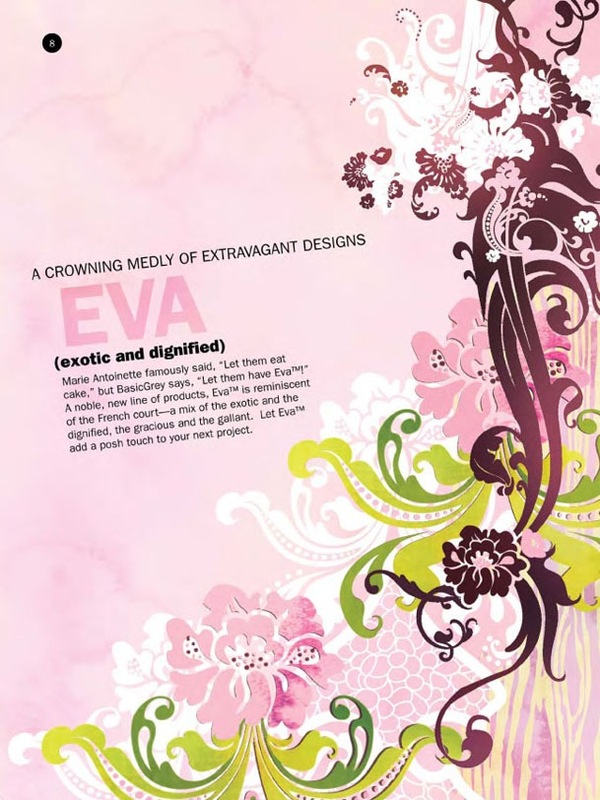 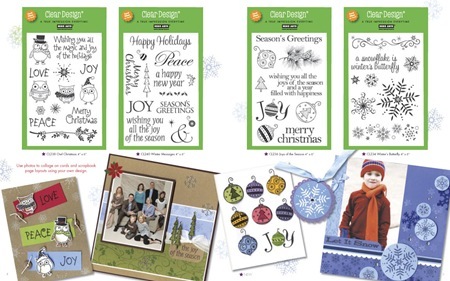 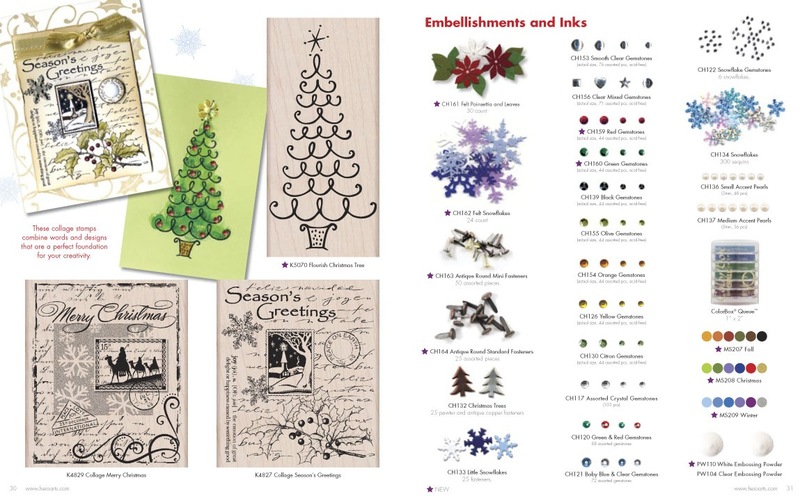 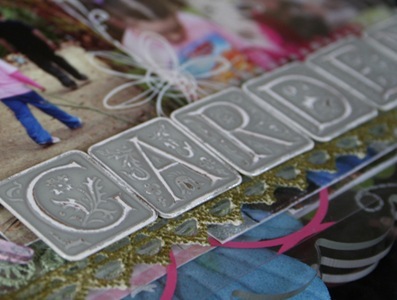 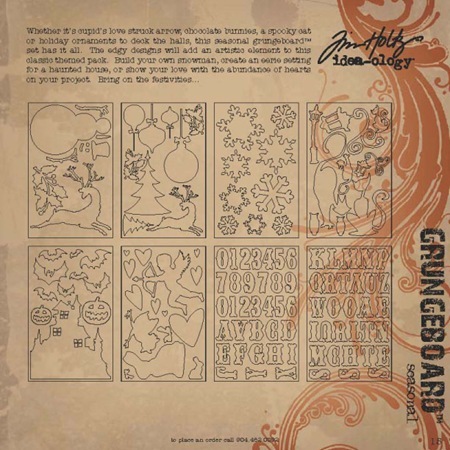 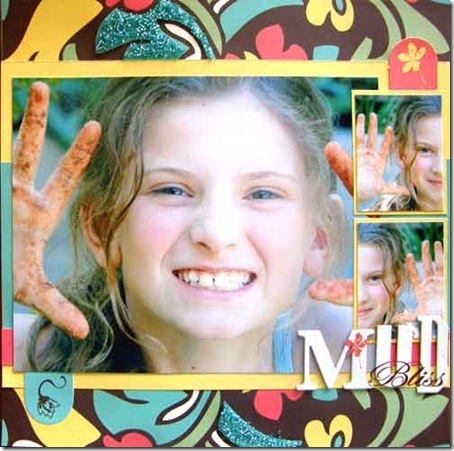 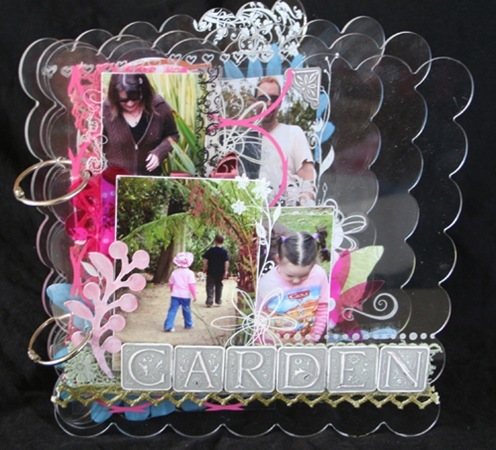 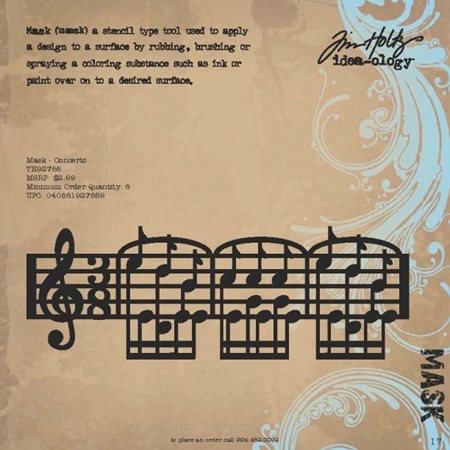 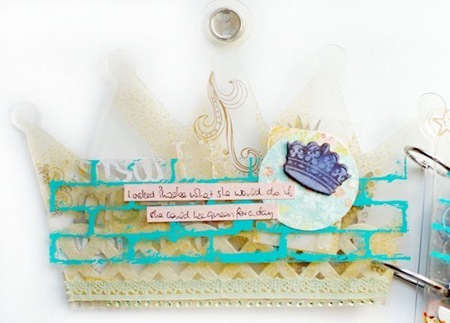 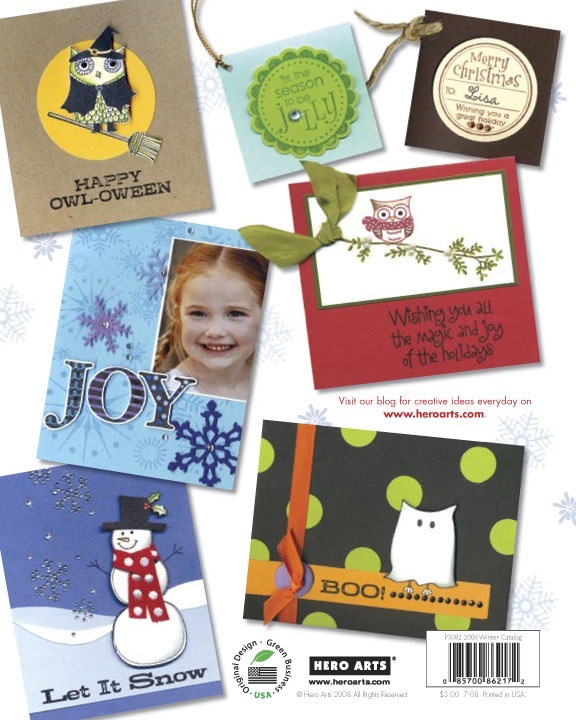 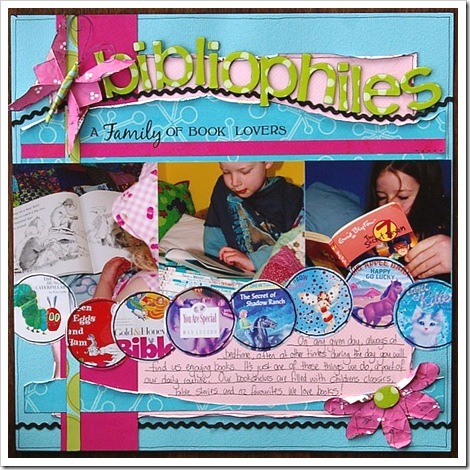 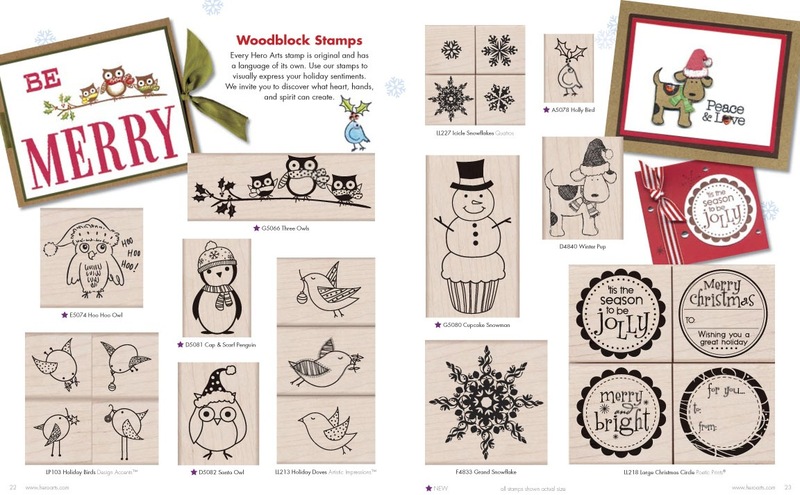 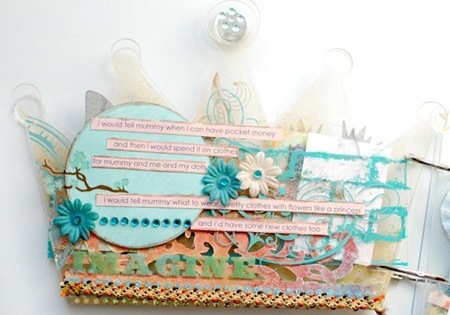 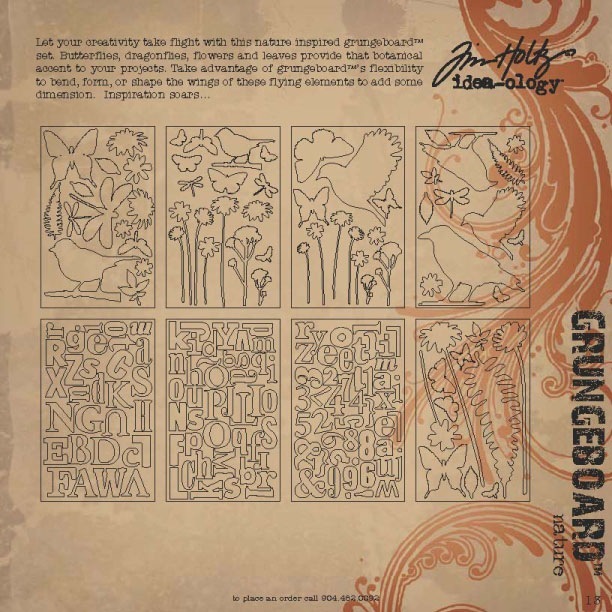 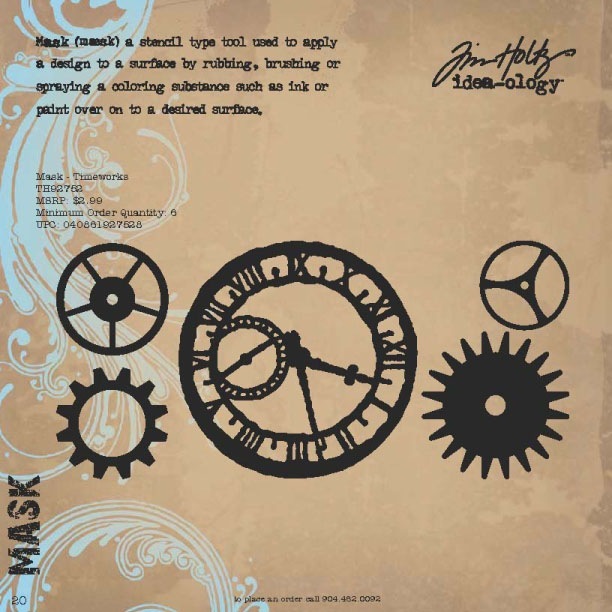 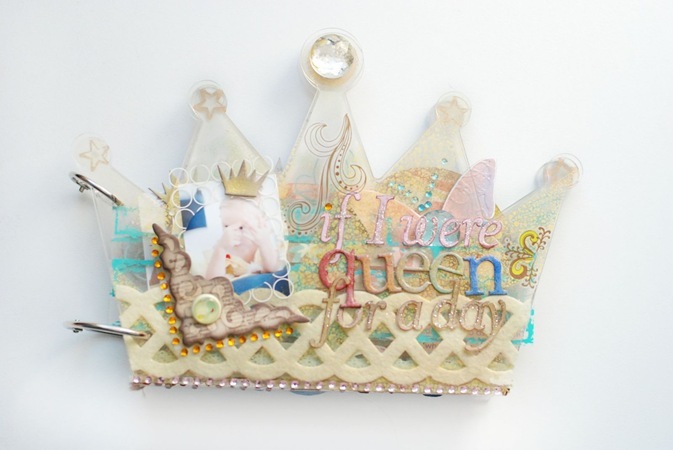 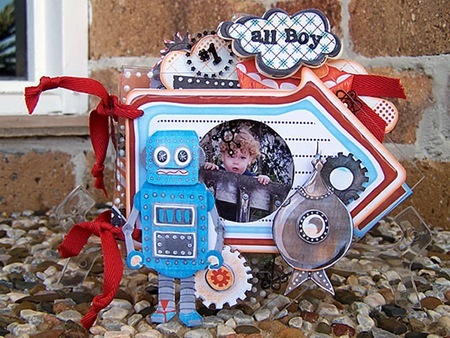 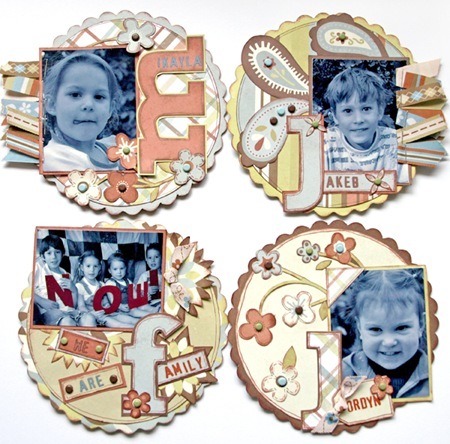 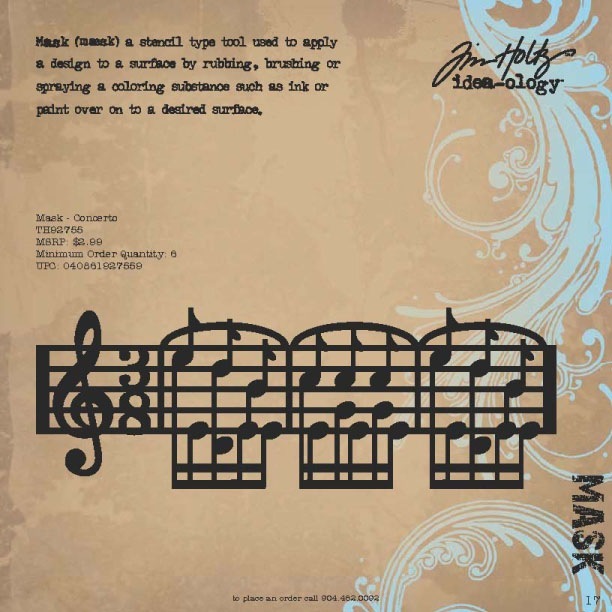 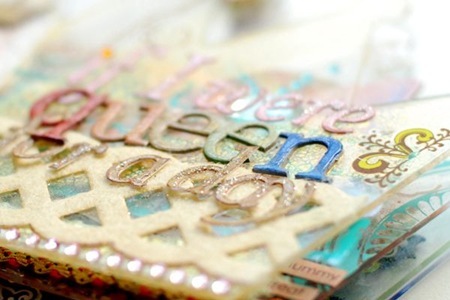 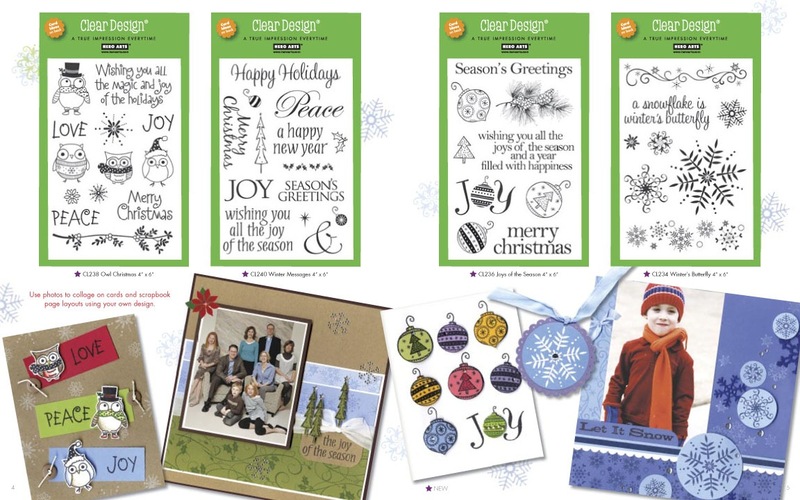 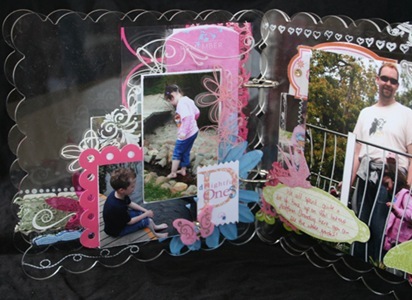 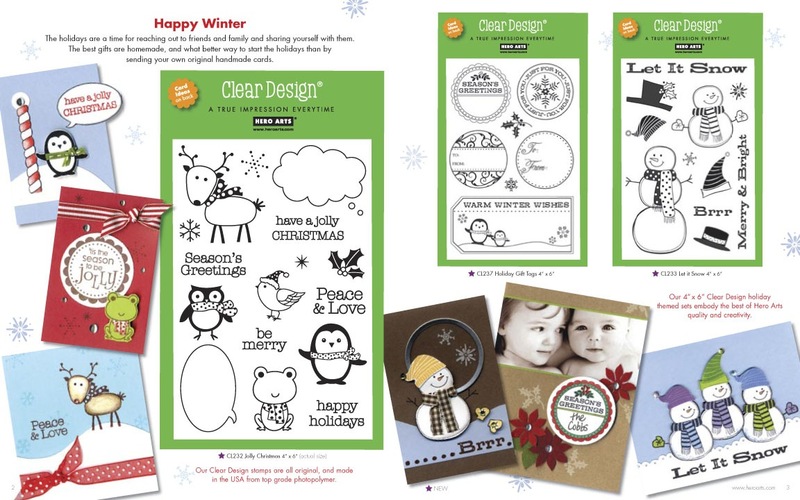 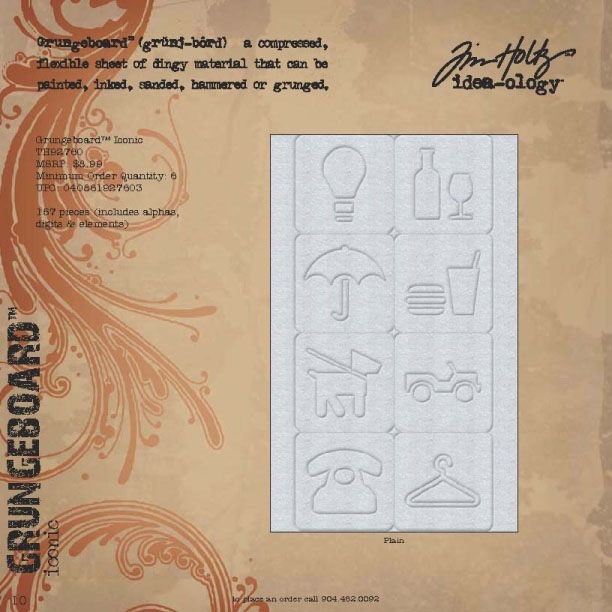 The layouts all feature simple designs, layering and a little inking and are accented with chipboard shapes, ribbon, florals, brads and embellishments that have be precut using the Quickutz die-cutting system. There is a full set of alphabet stickers with upper and lowercase letters as well as numbers, so titles can be customised to suit. 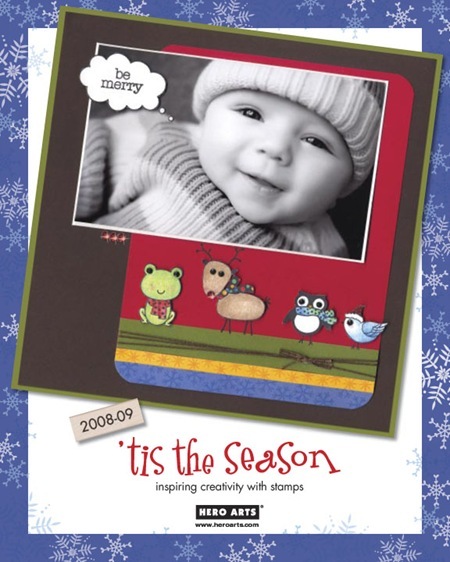 What a fantastic idea for Christmas! 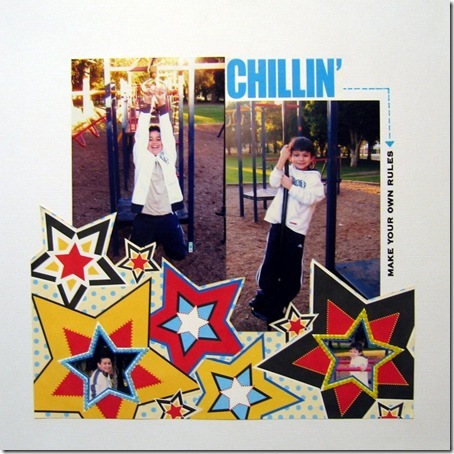 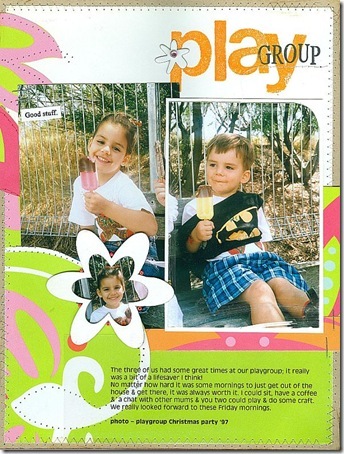 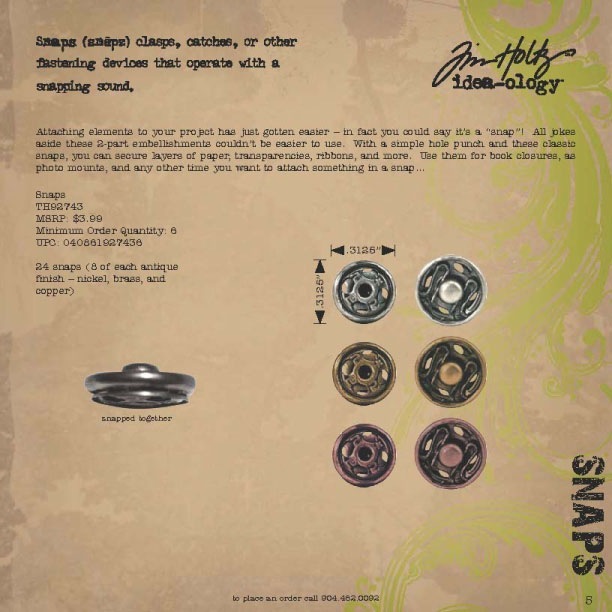 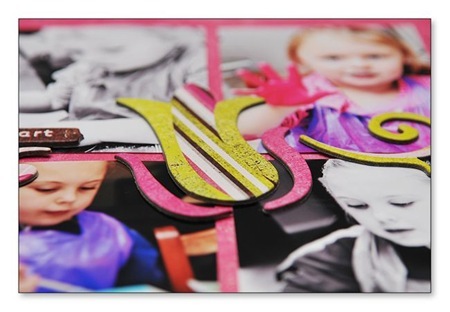 This versatile set of four magnets are designed to be used for both a boy and girl theme. 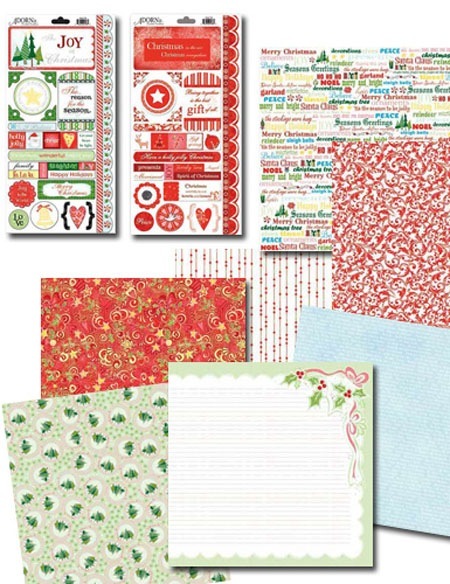 Using WeR Memory Keepers papers and ribbons and finished with loads of brads, these make a lovely present that can be used all year round. 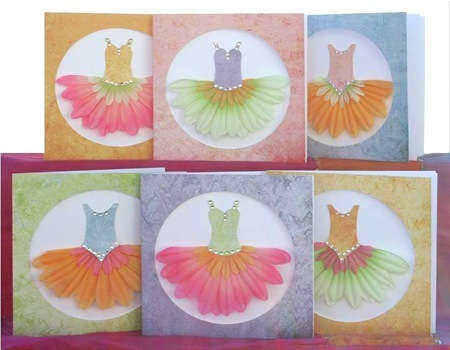 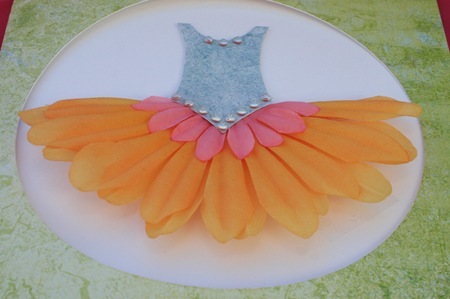 Create these 6 gorgeous 3D ballerina card with cut-out windows to keep on hand when you want to put a smile on a little (or big) girl’s face. 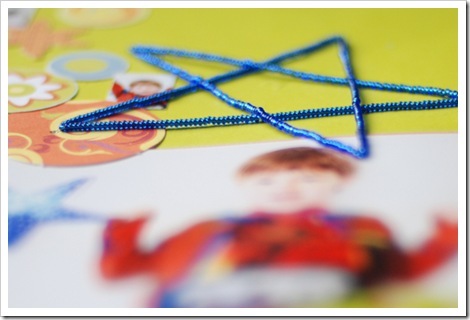 All materials are included in this quick and easy kit which would even be suitable for older children. 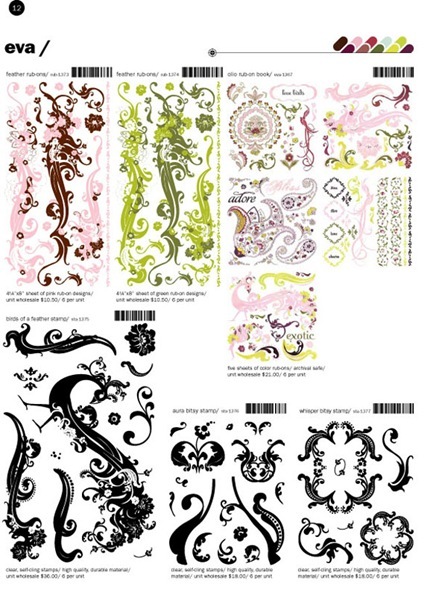 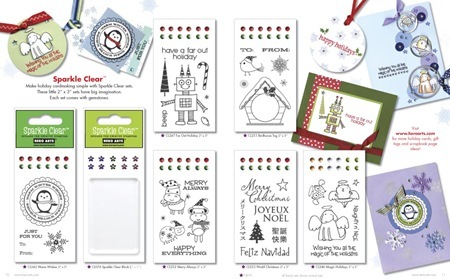 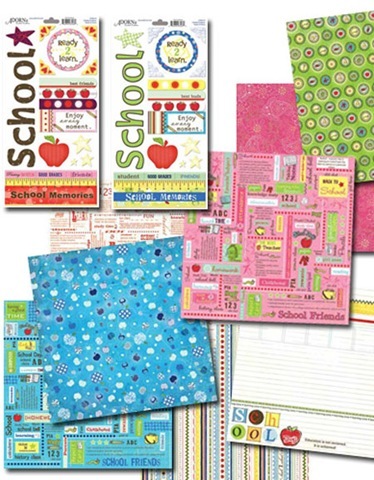 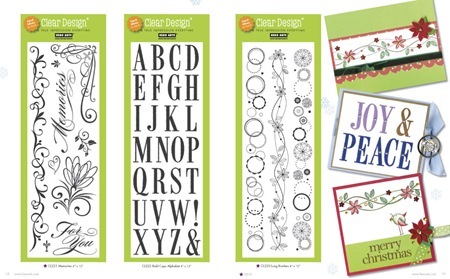 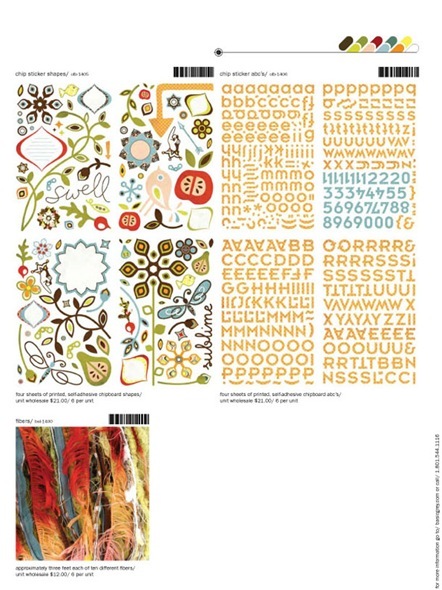 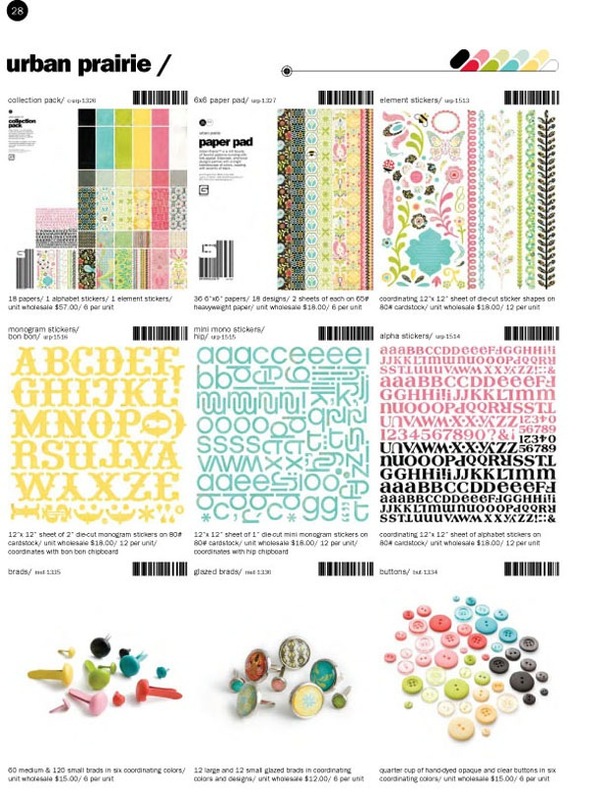 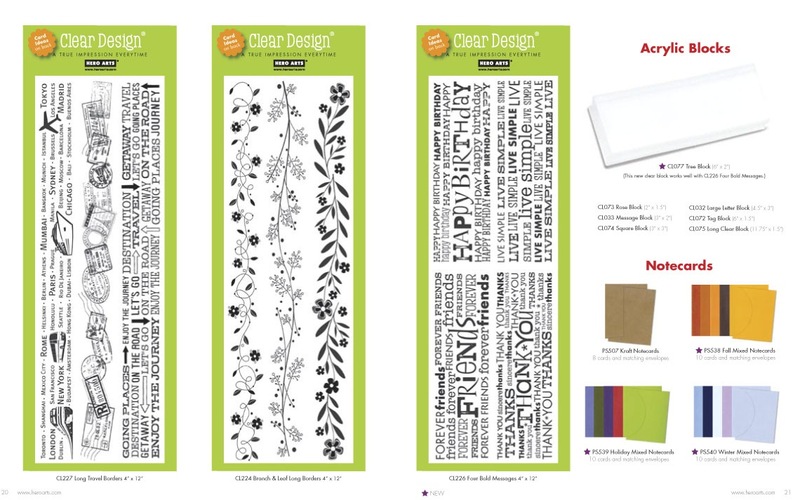 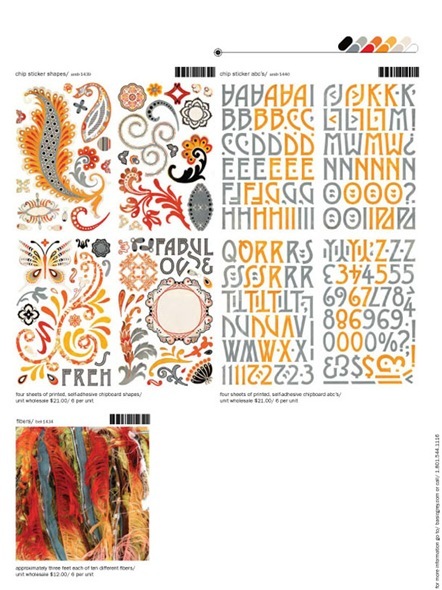 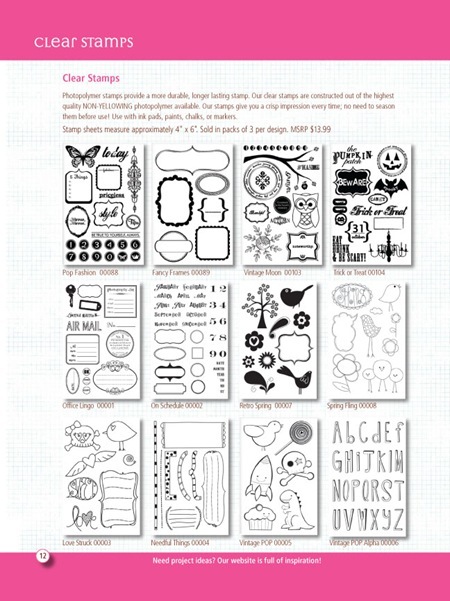 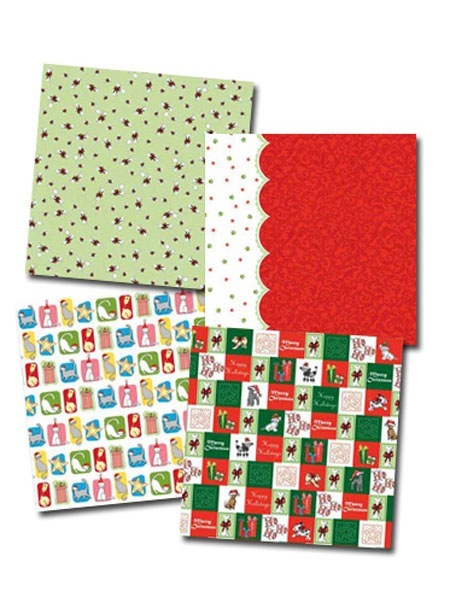 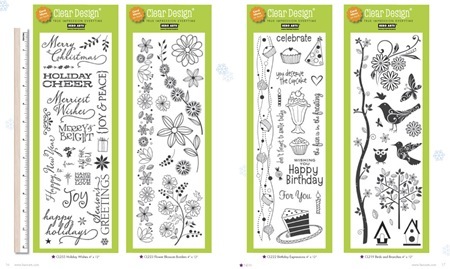 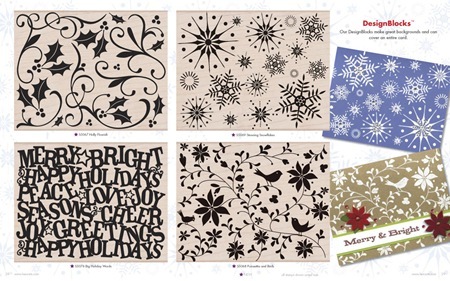 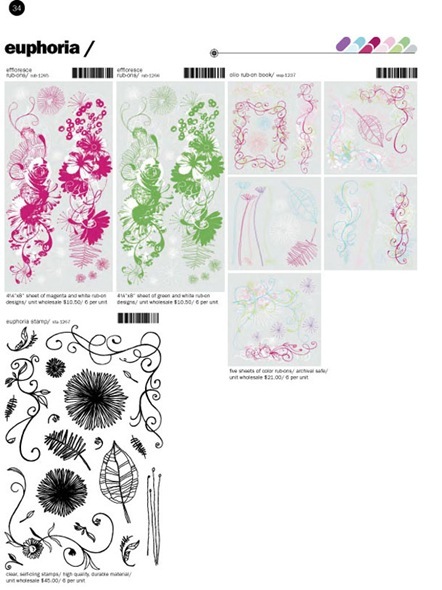 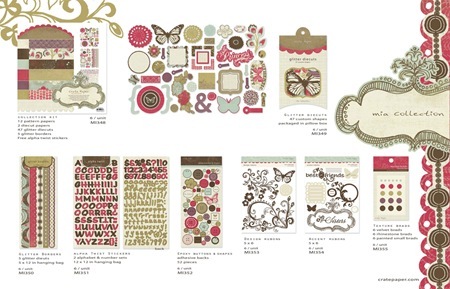 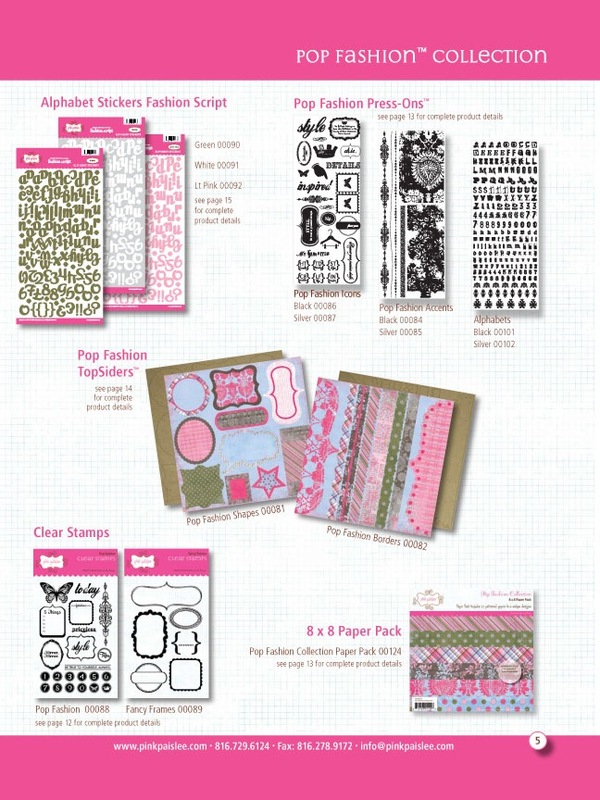 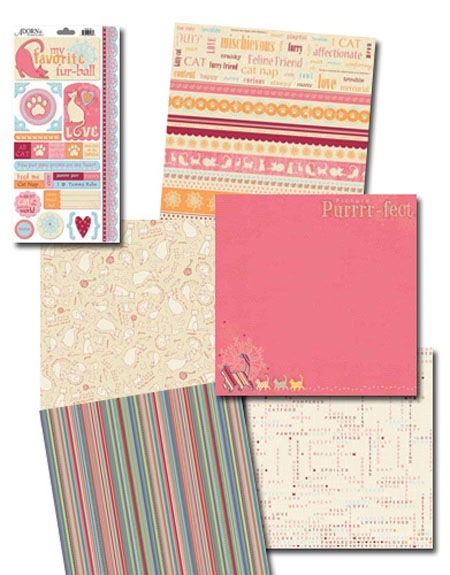 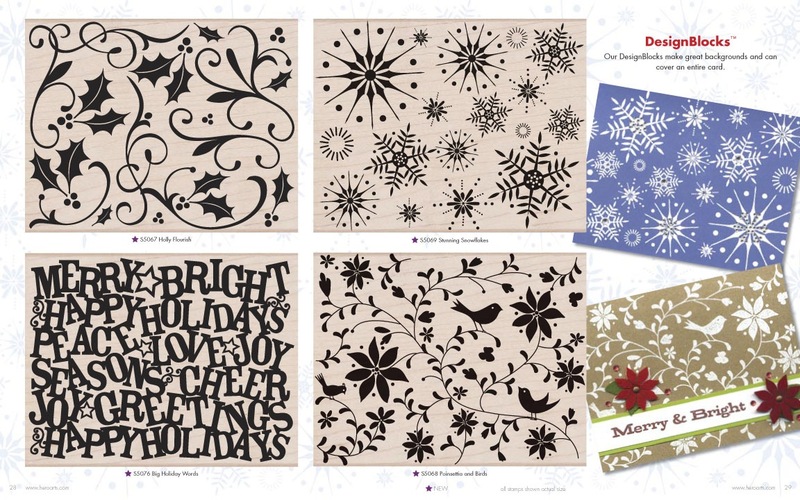 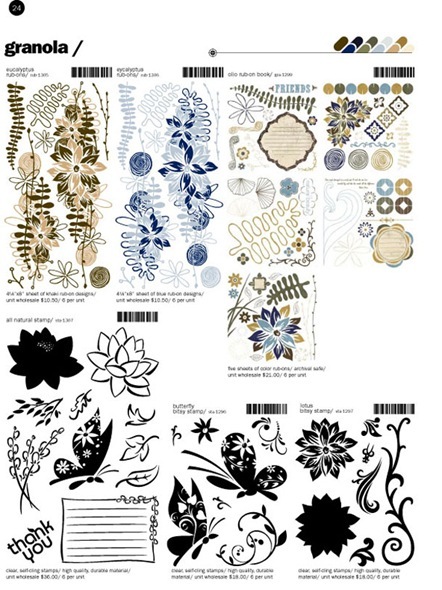 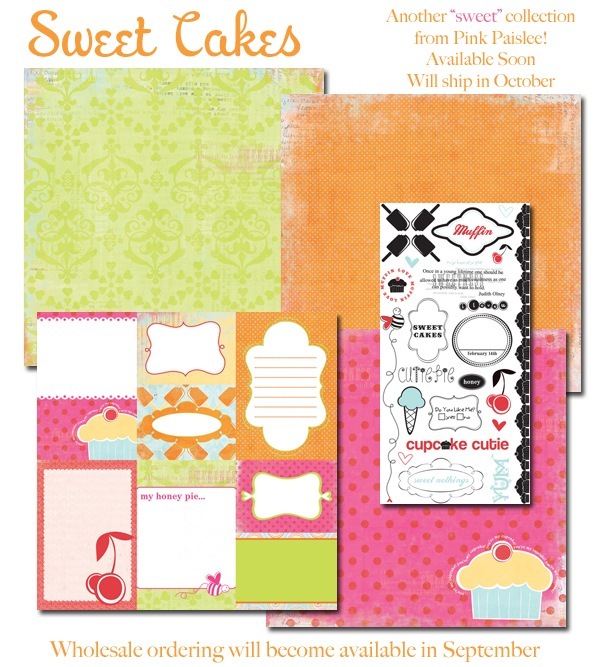 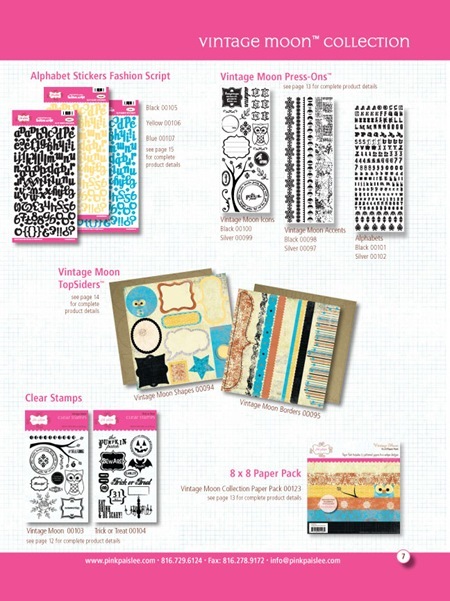 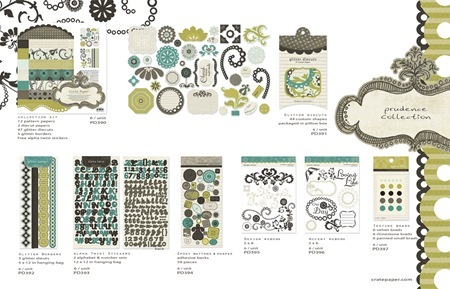 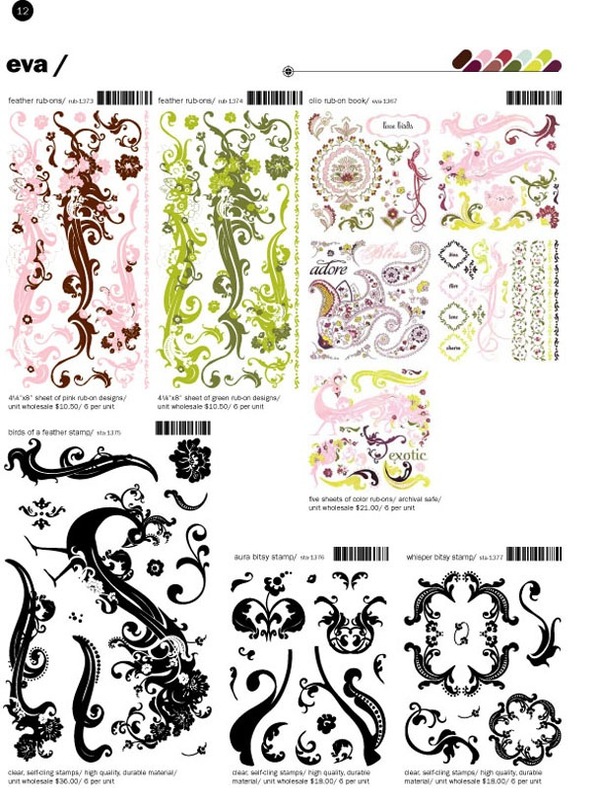 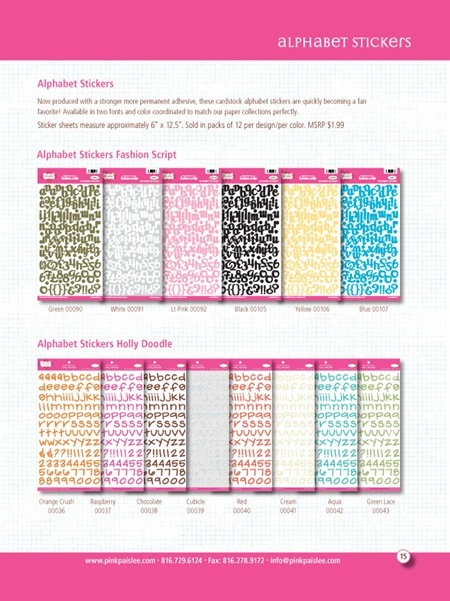 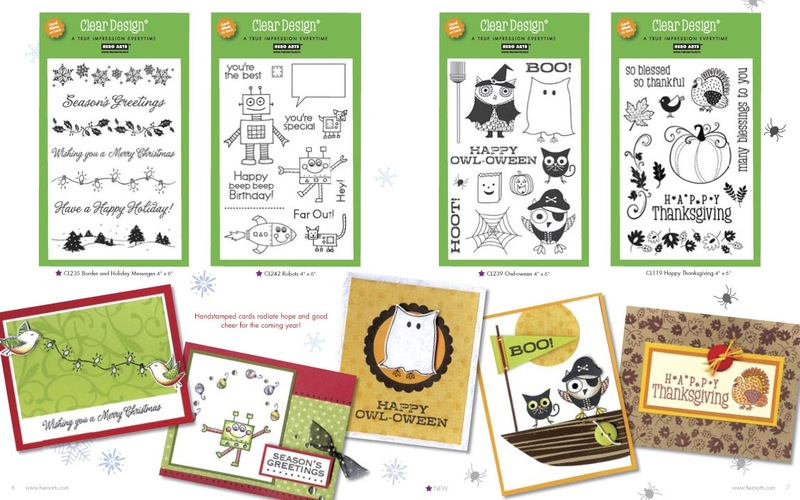 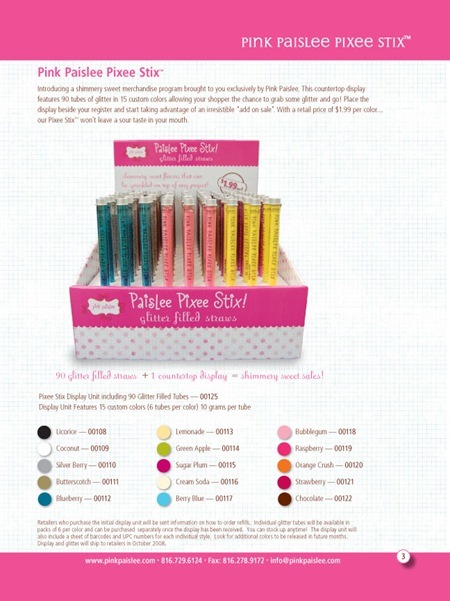 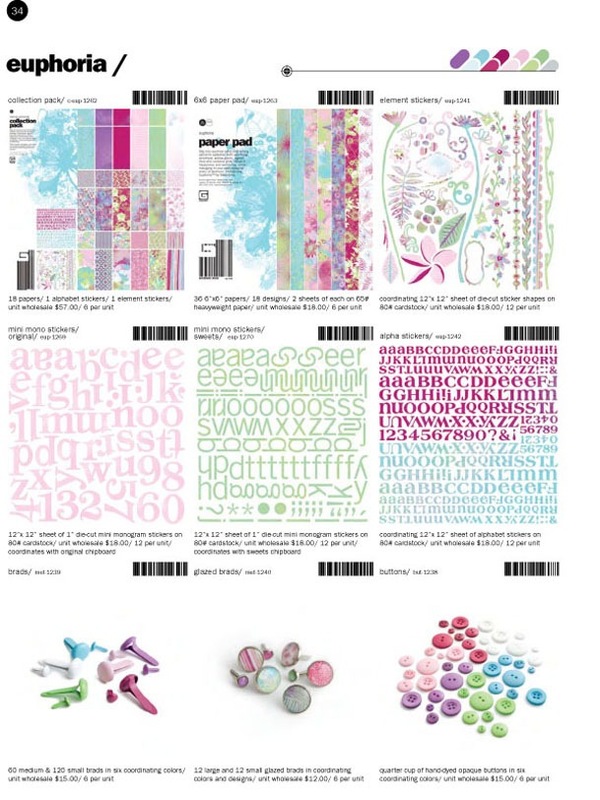 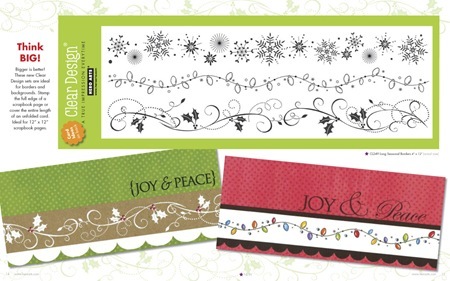 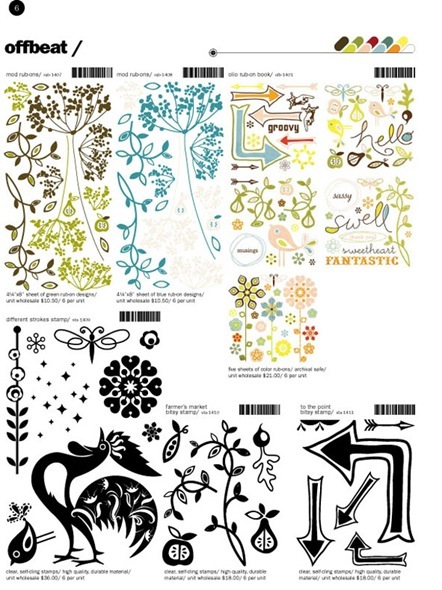 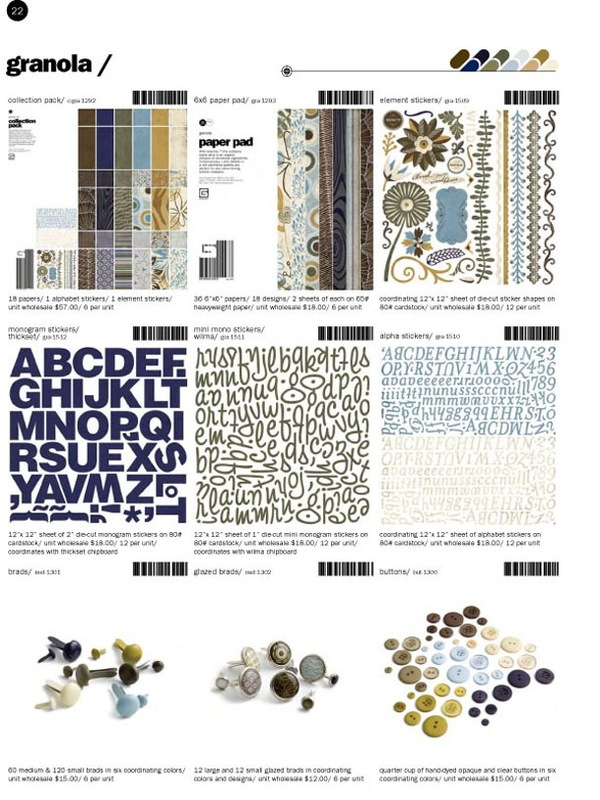 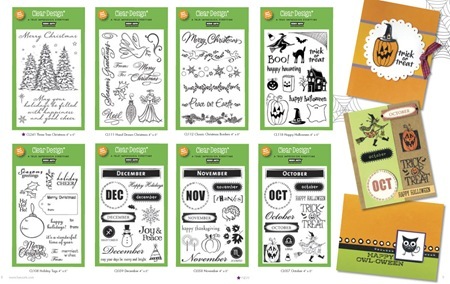 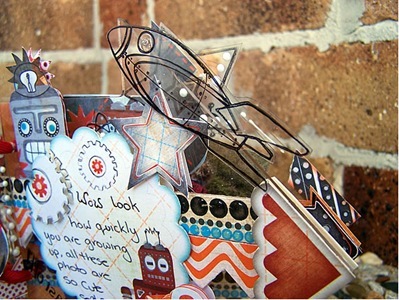 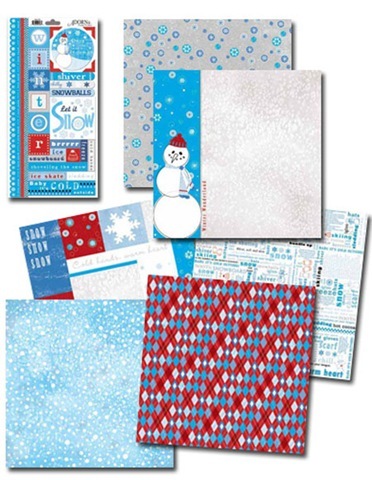 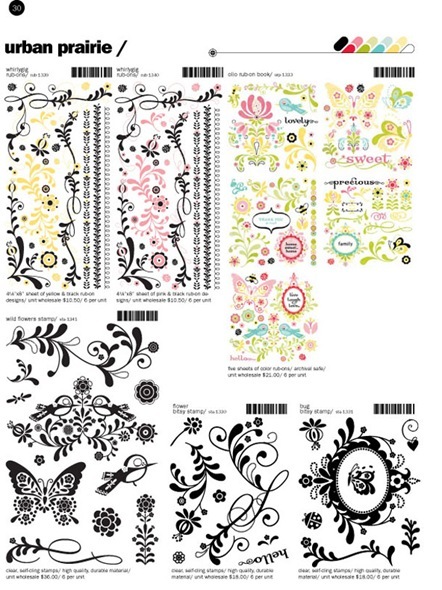 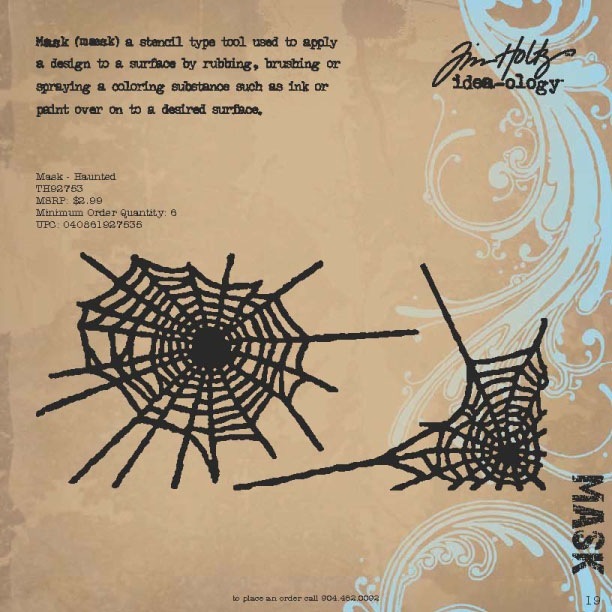 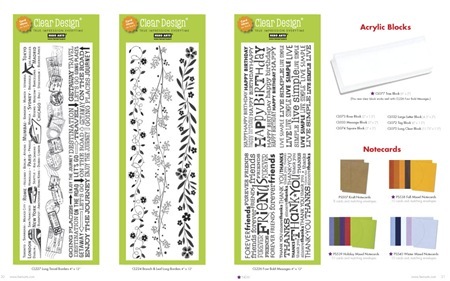 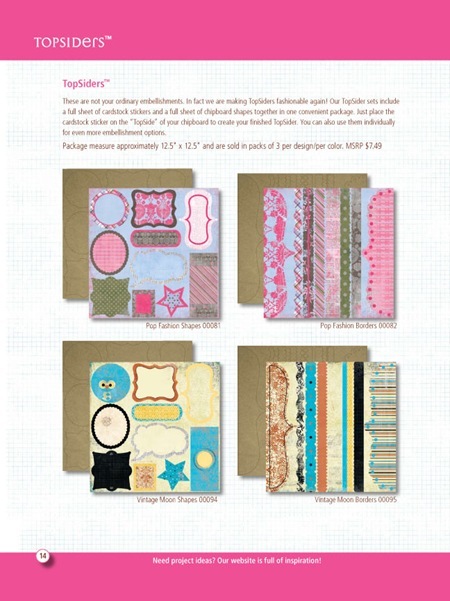 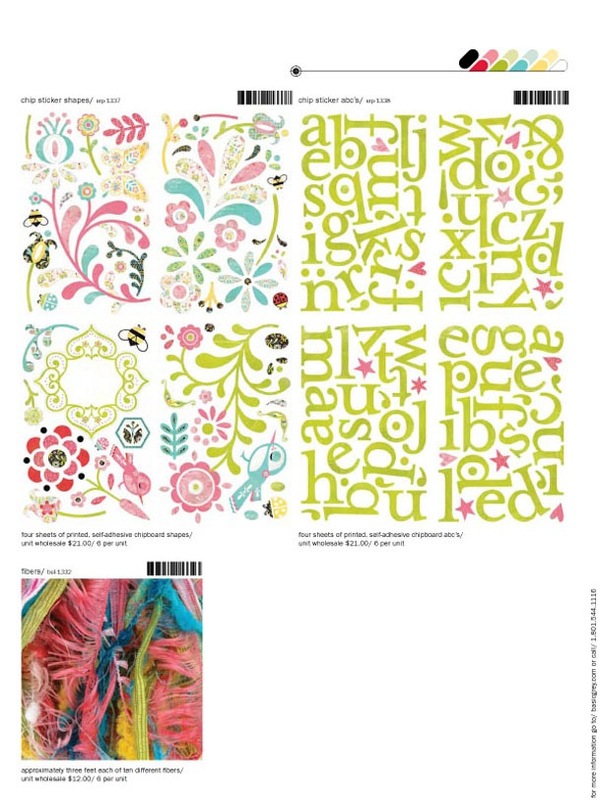 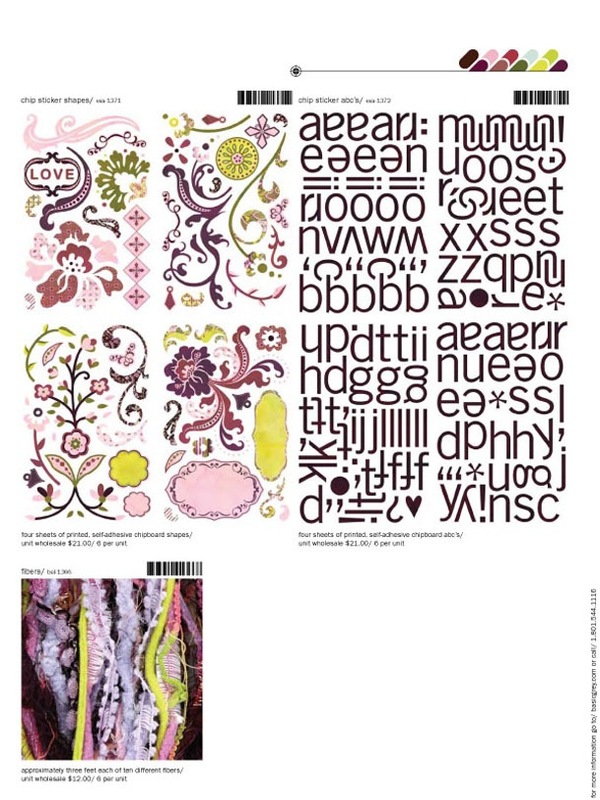 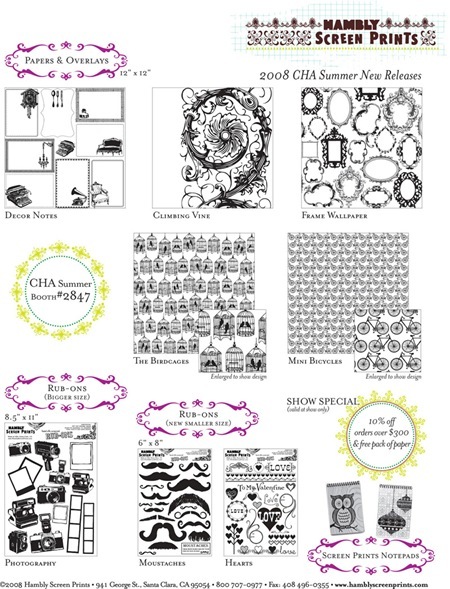 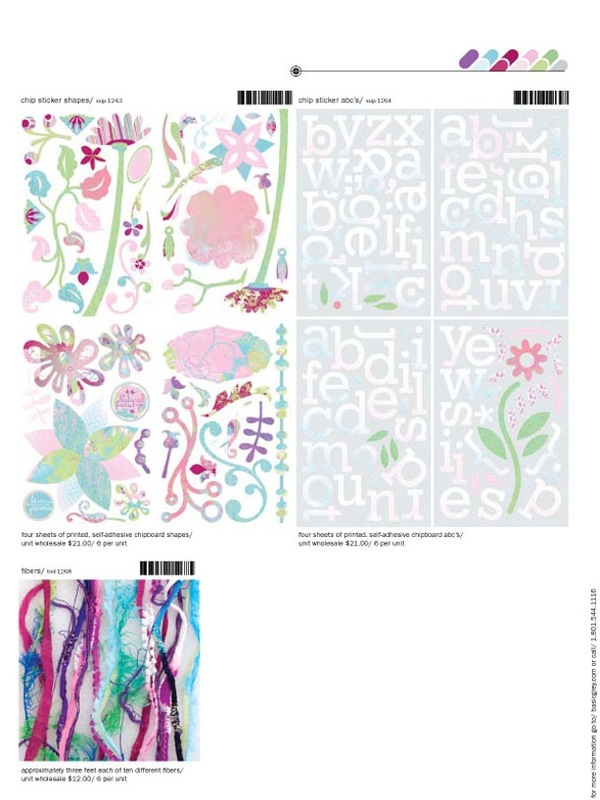 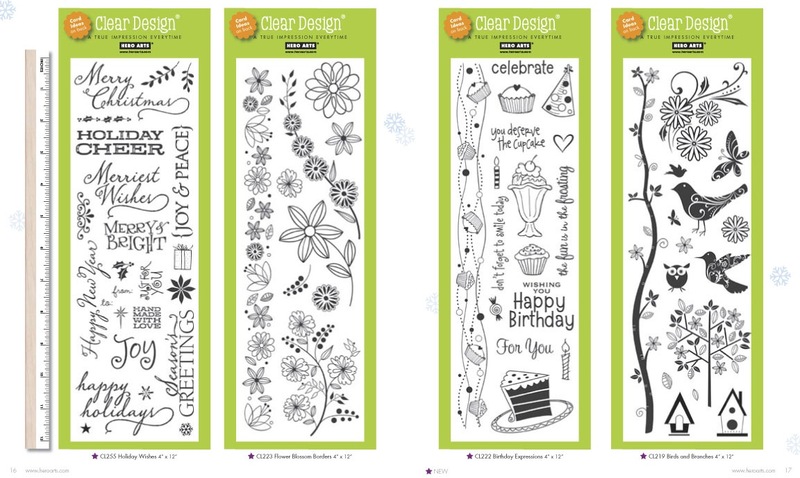 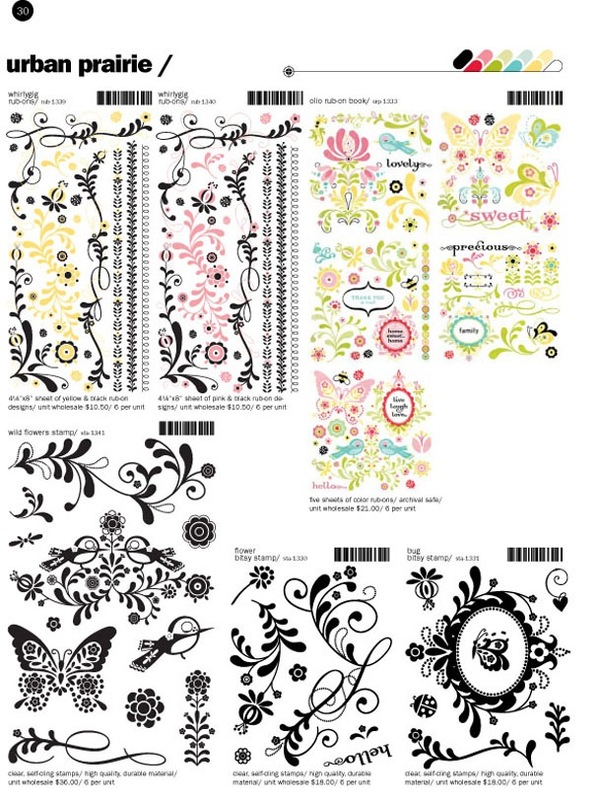 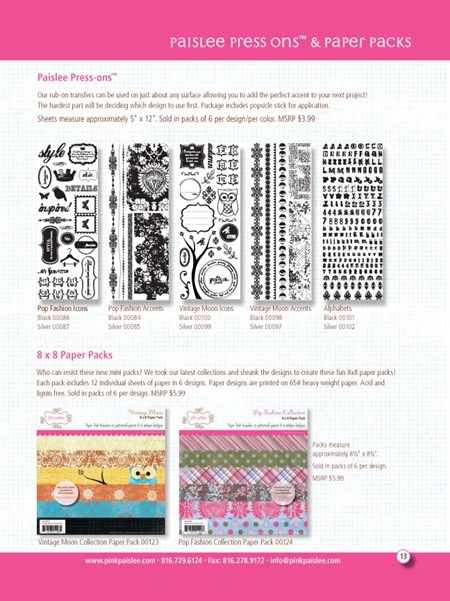 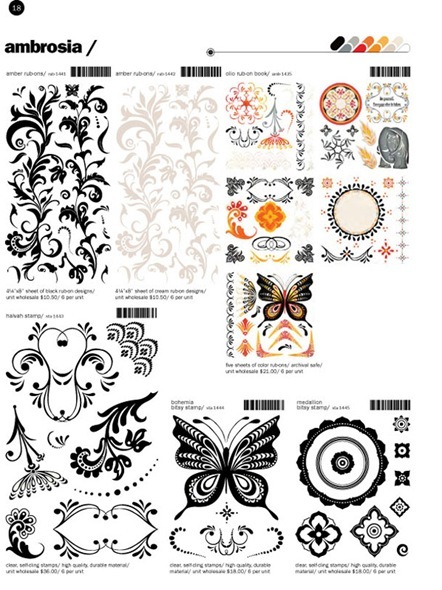 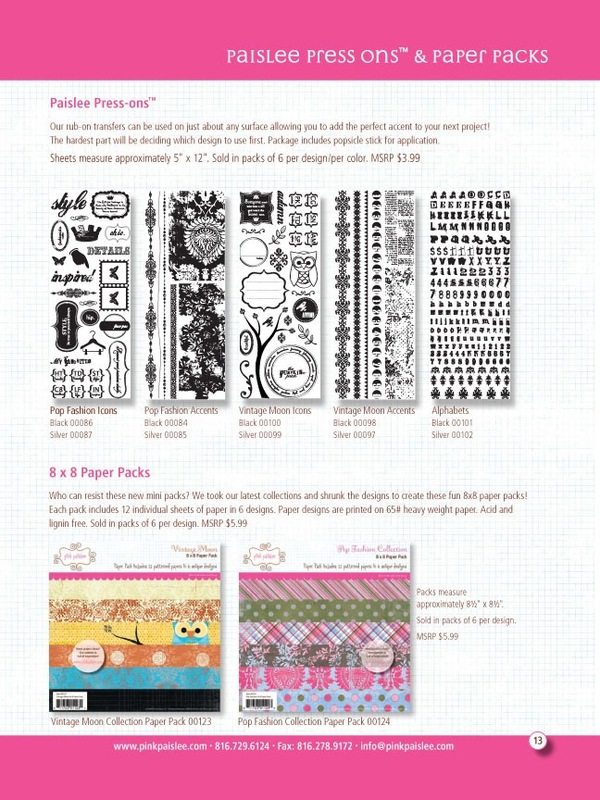 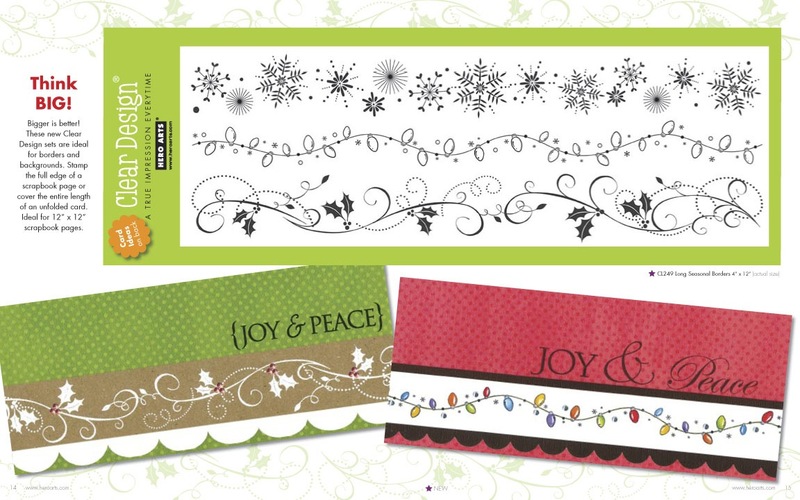 Seven brand new patterned paper lines, complete with alphas, embellishments, puff and epoxy stickers, ribbon and more. 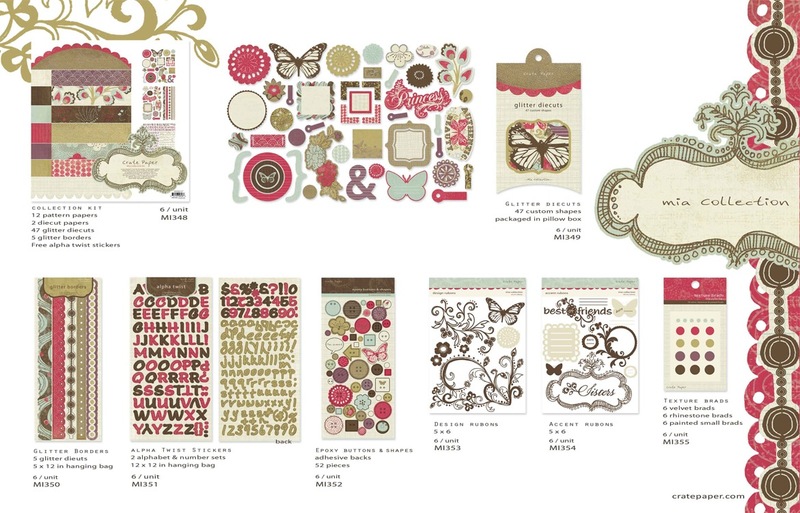 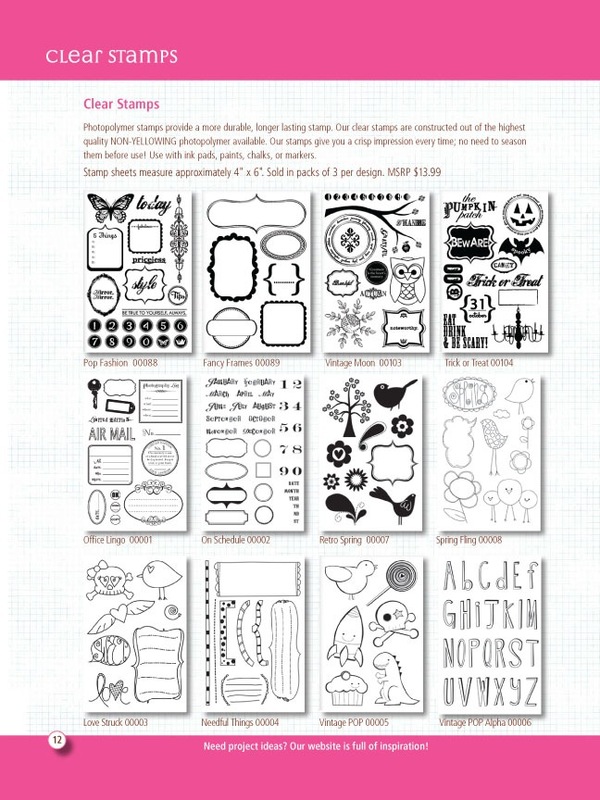 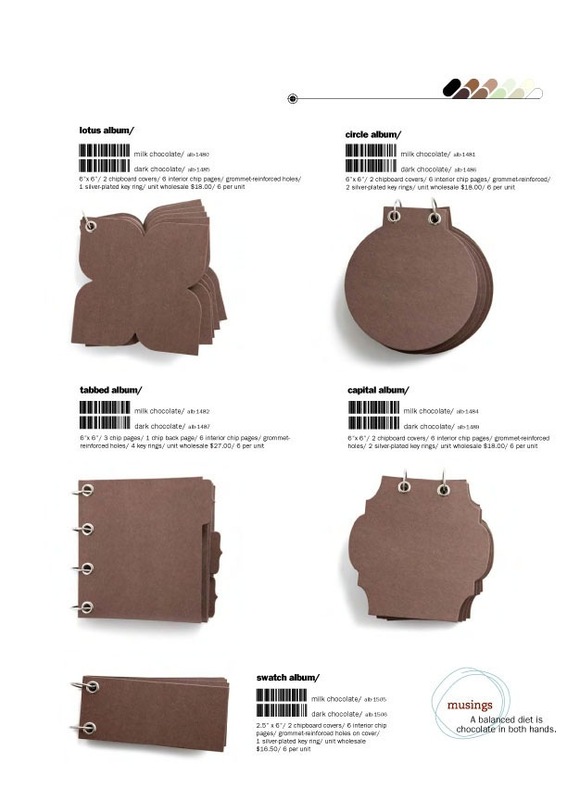 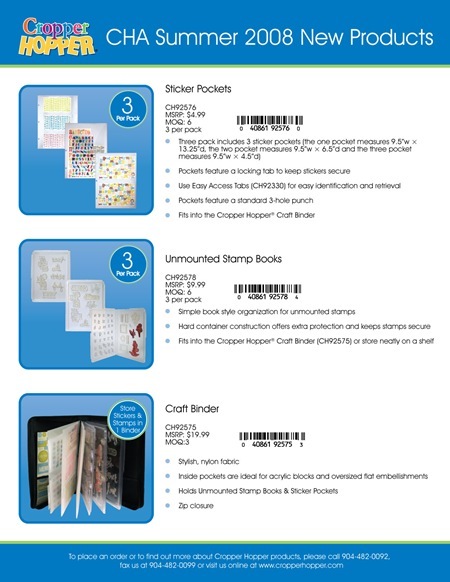 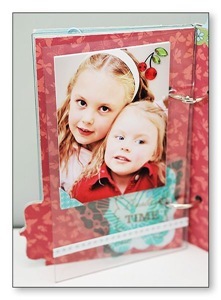 Also check out the last page for cute themed word mini albums.